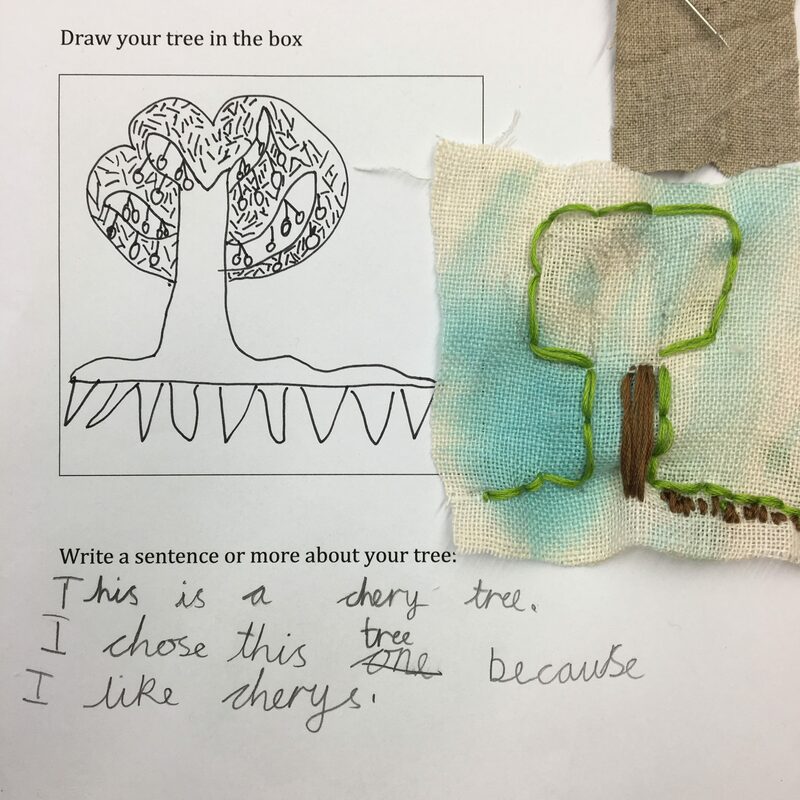 Please see here for a List of Label Descriptions for trees sent to us before June 2018. 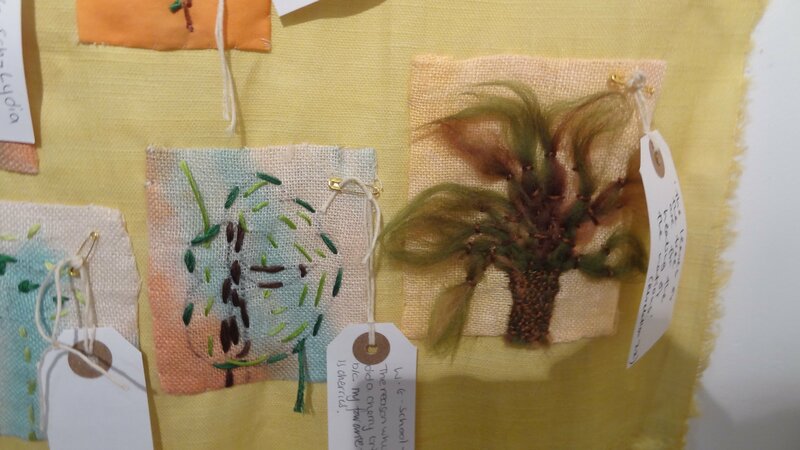 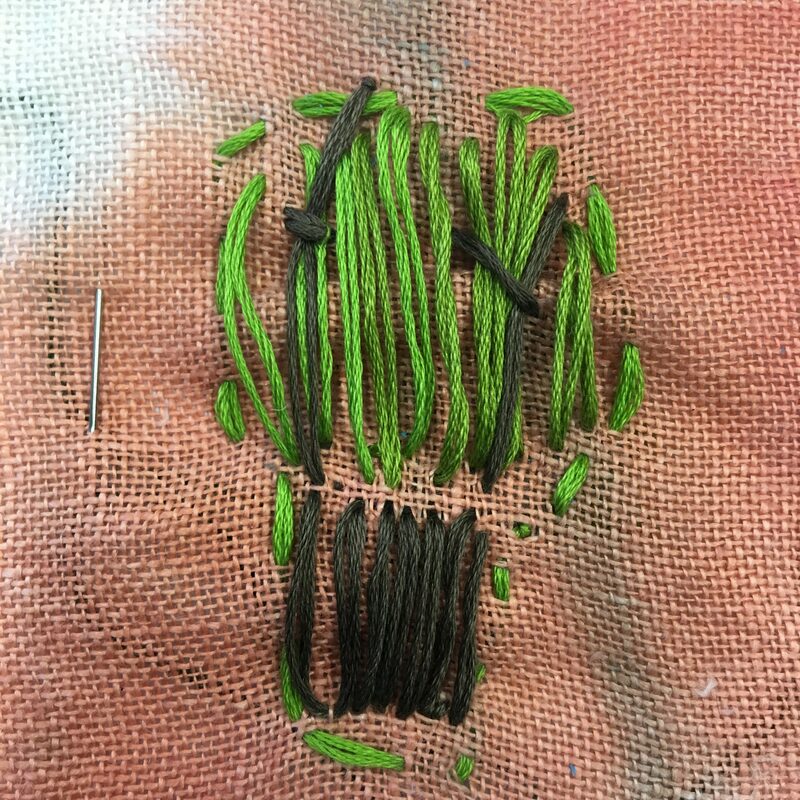 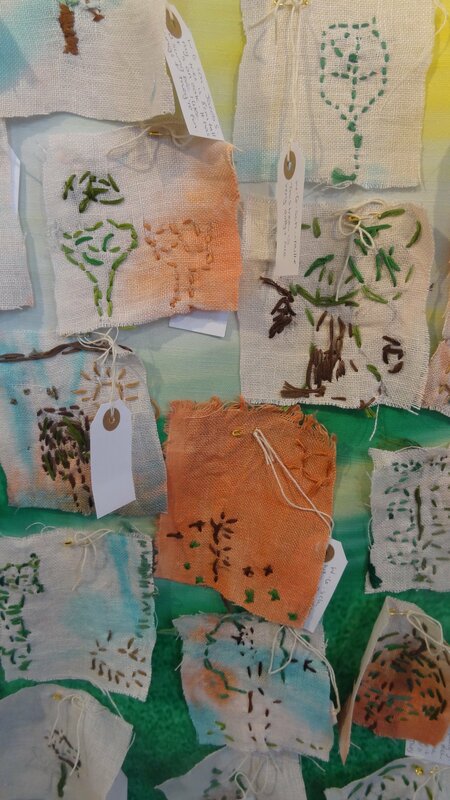 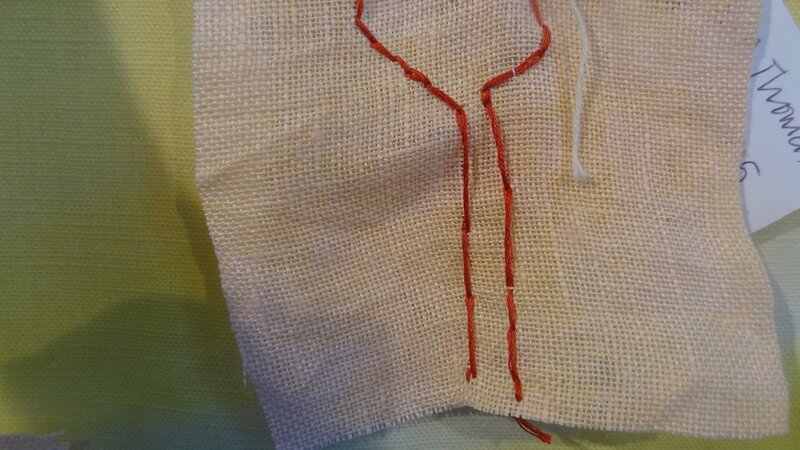 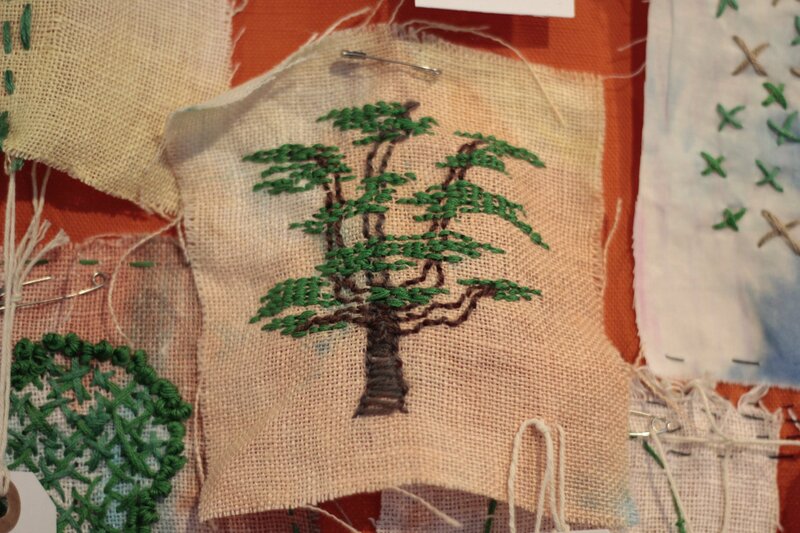 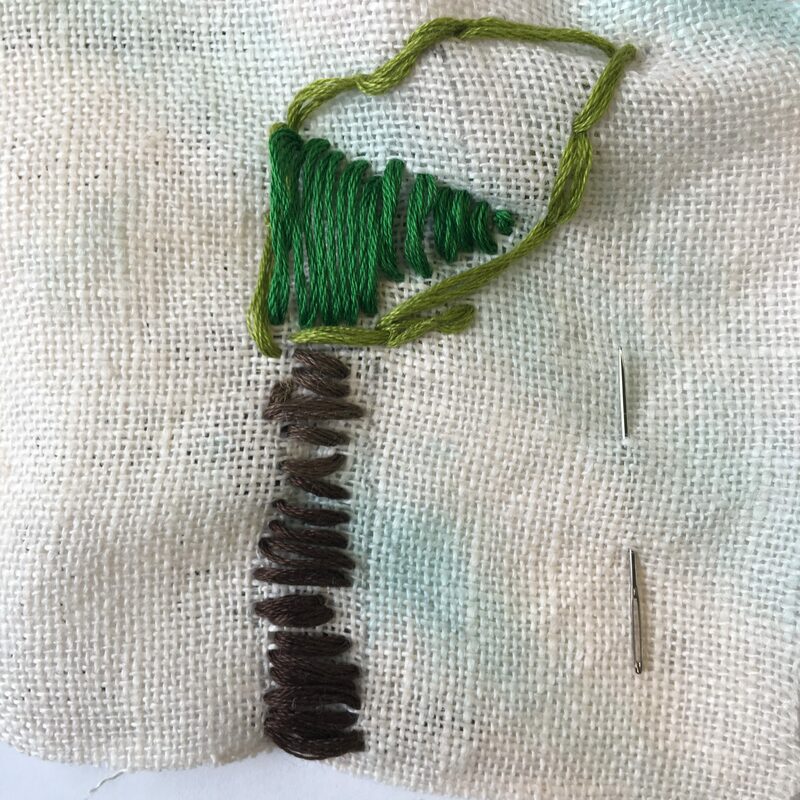 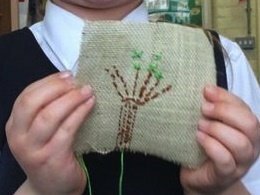 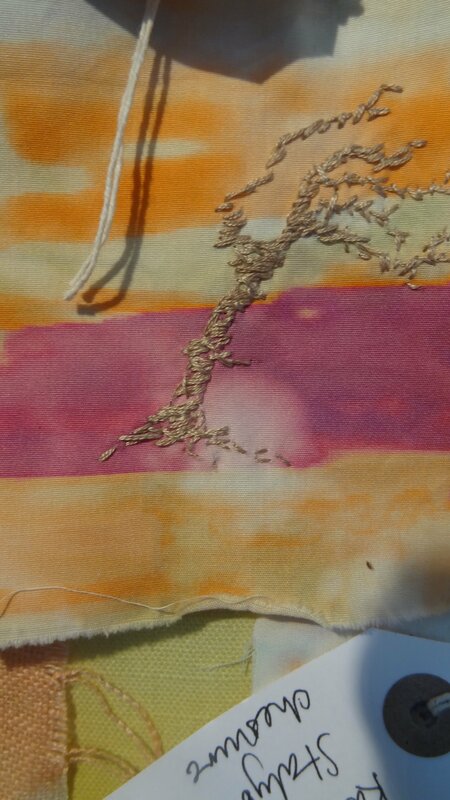 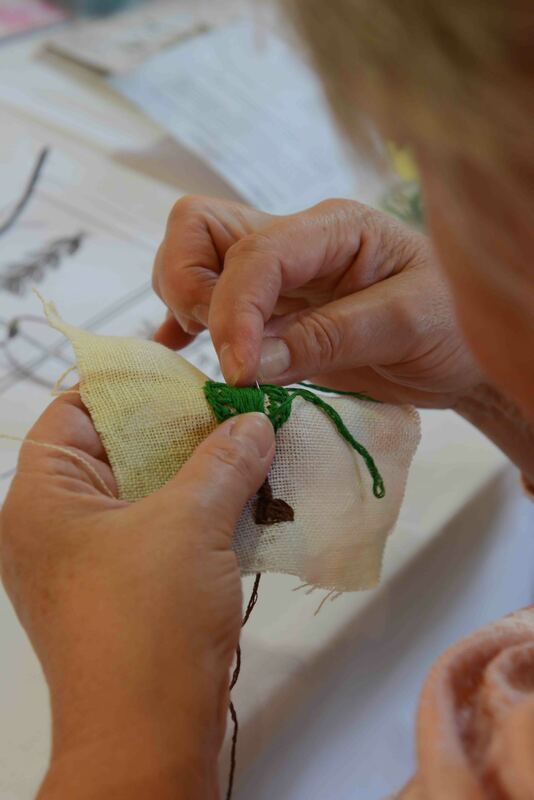 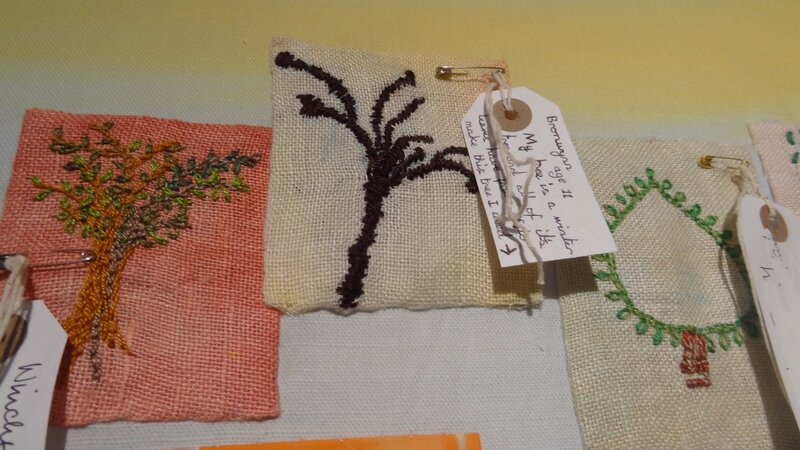 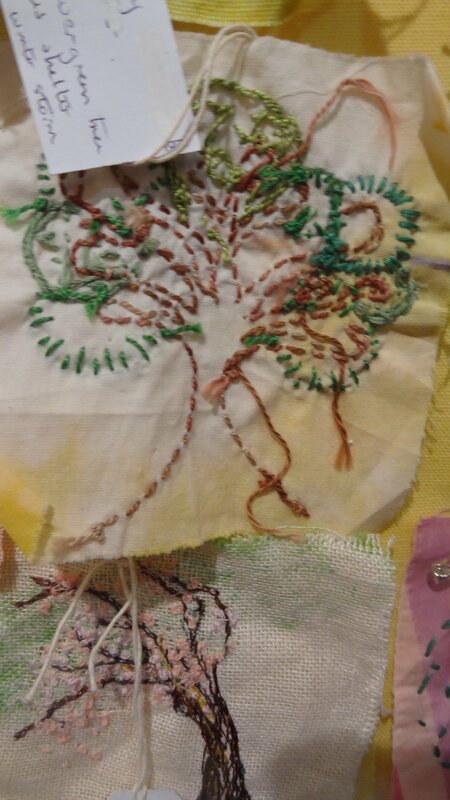 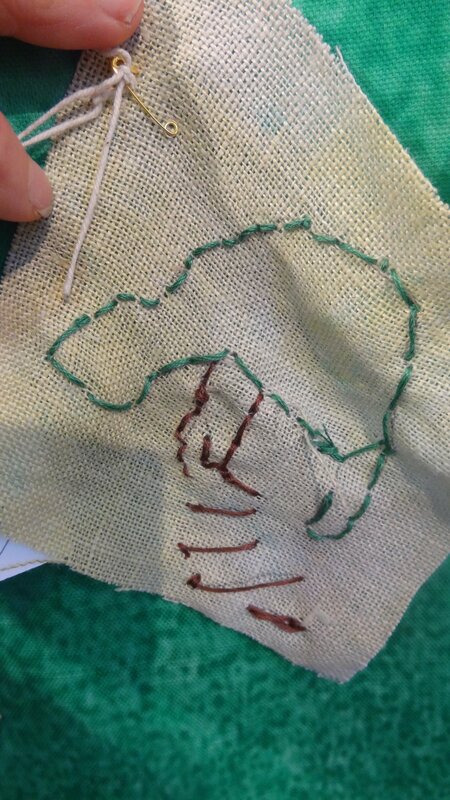 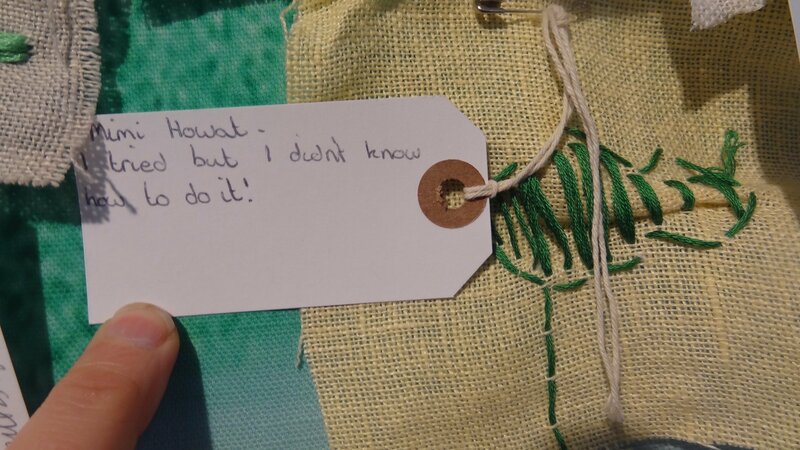 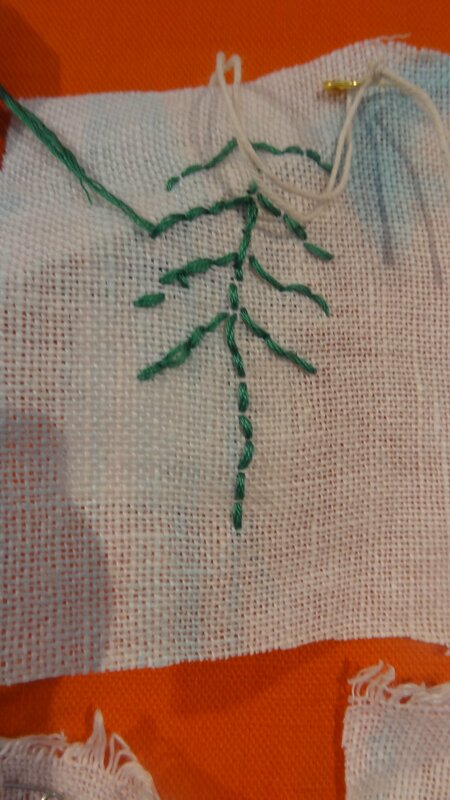 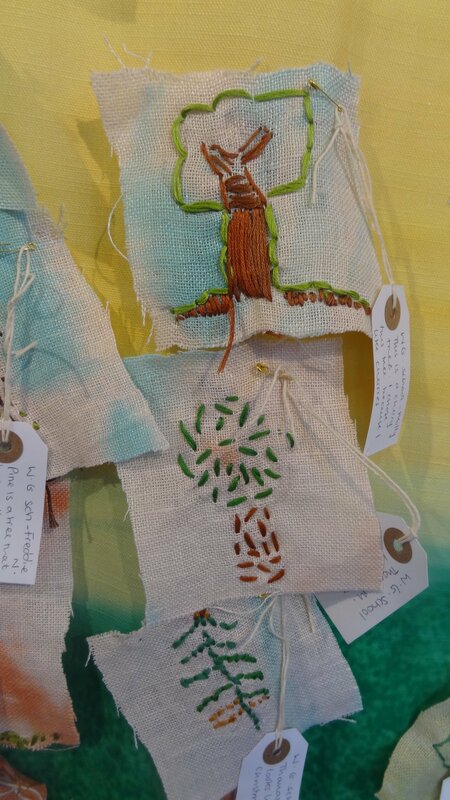 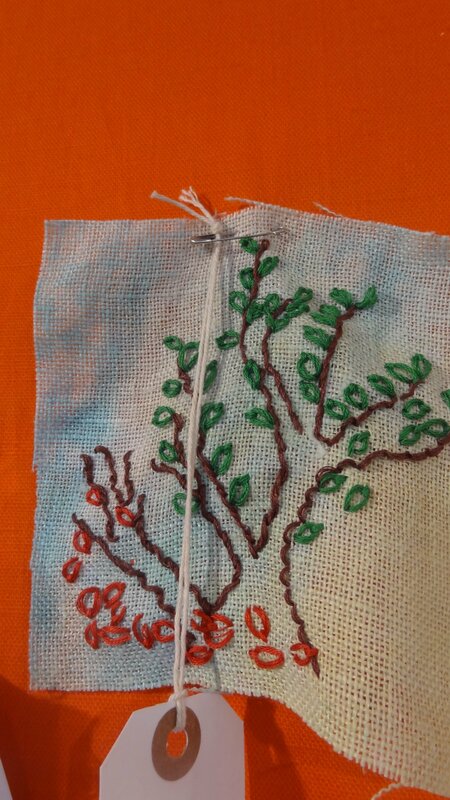 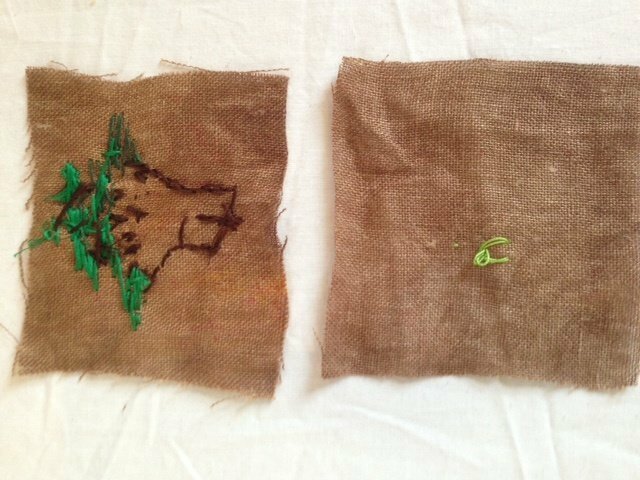 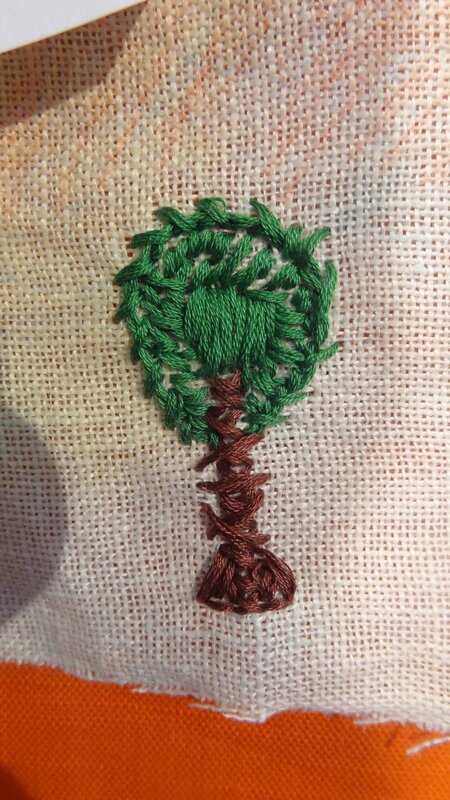 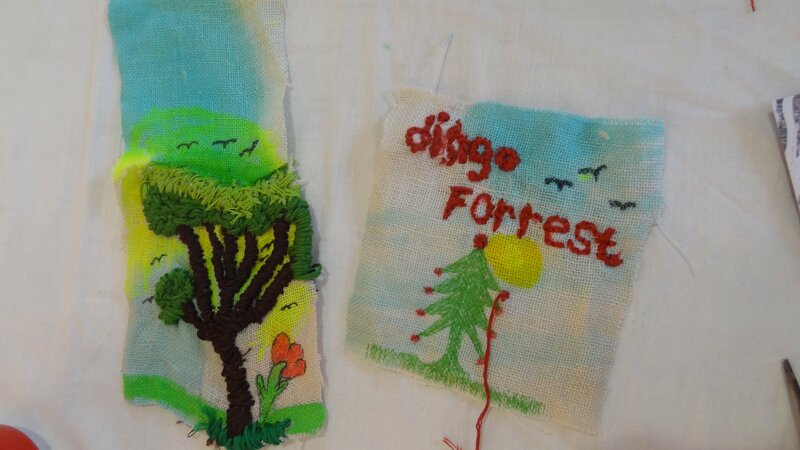 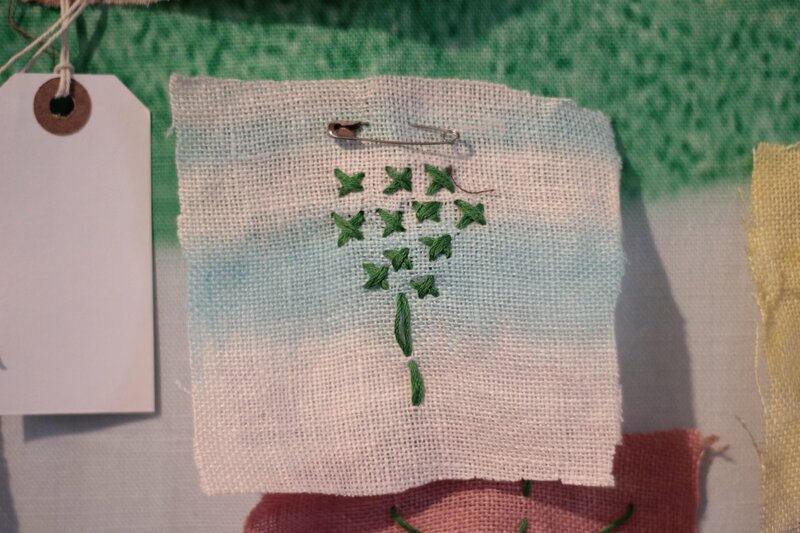 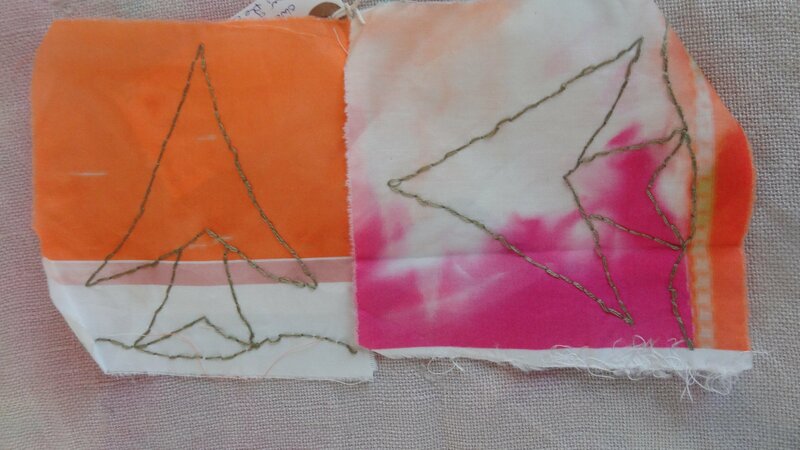 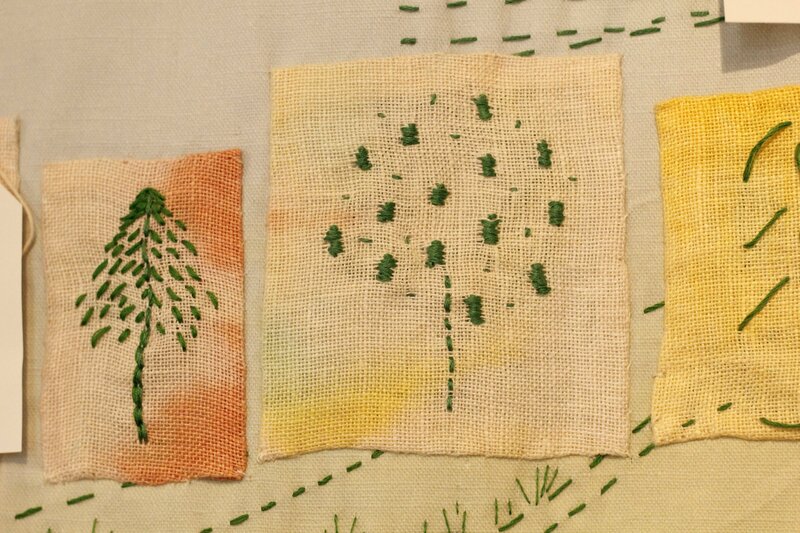 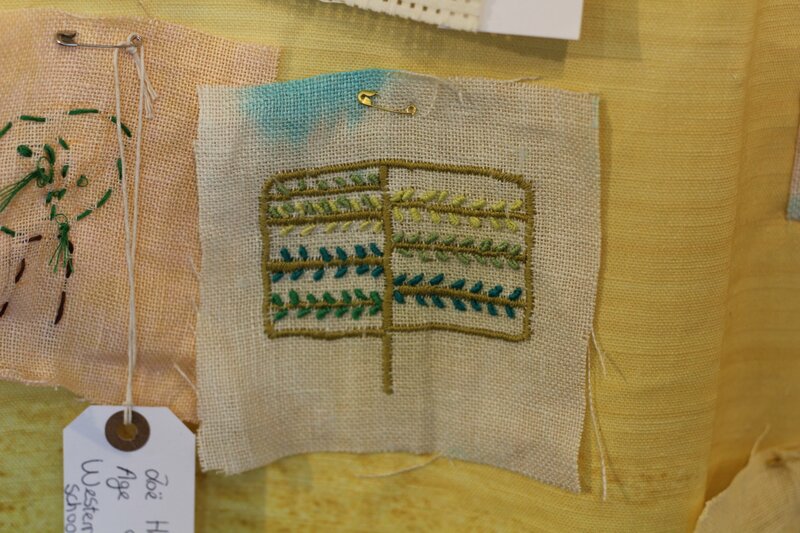 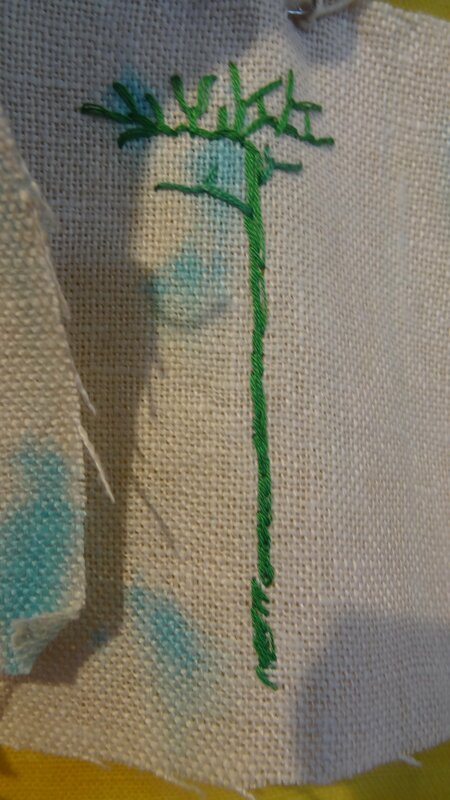 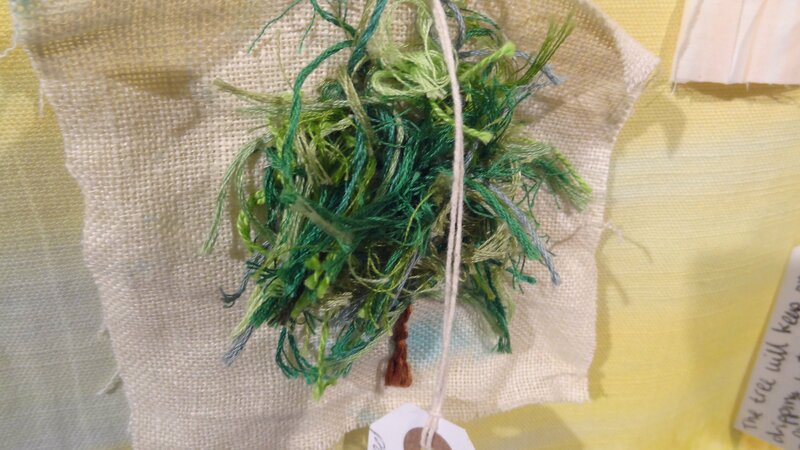 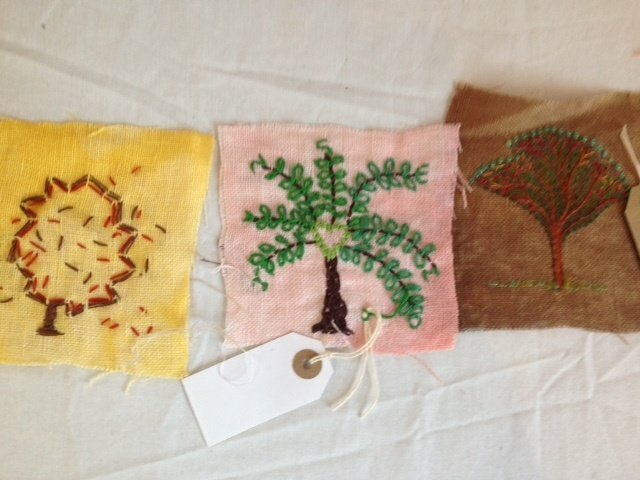 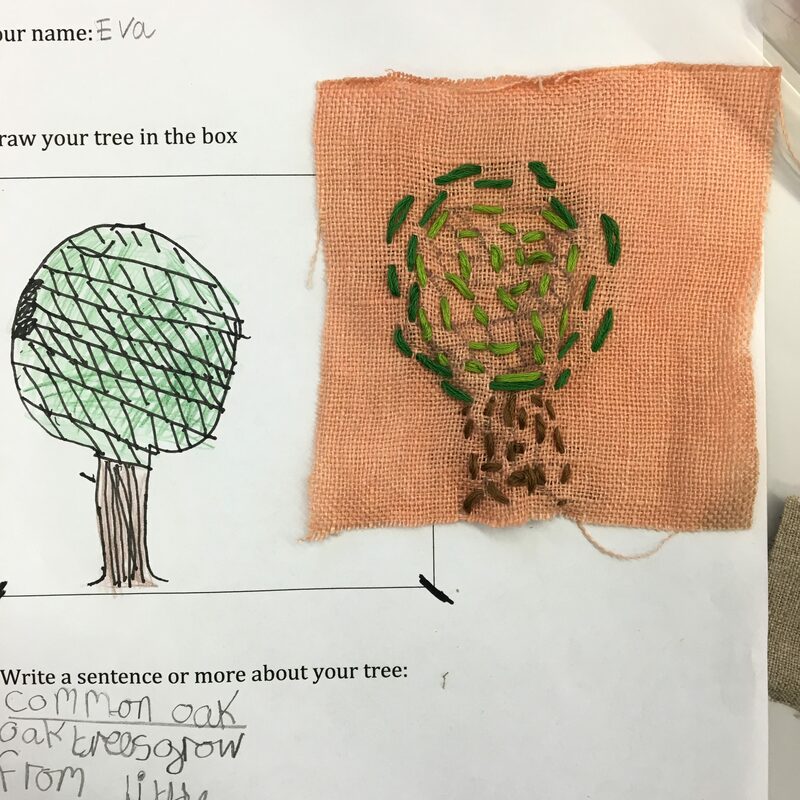 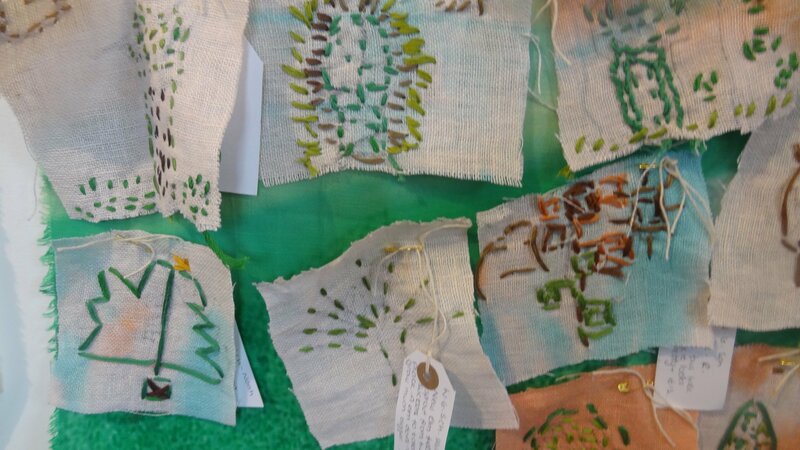 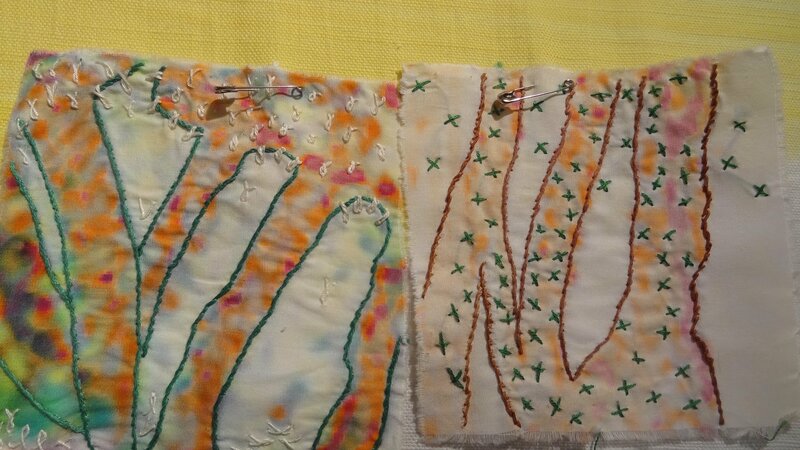 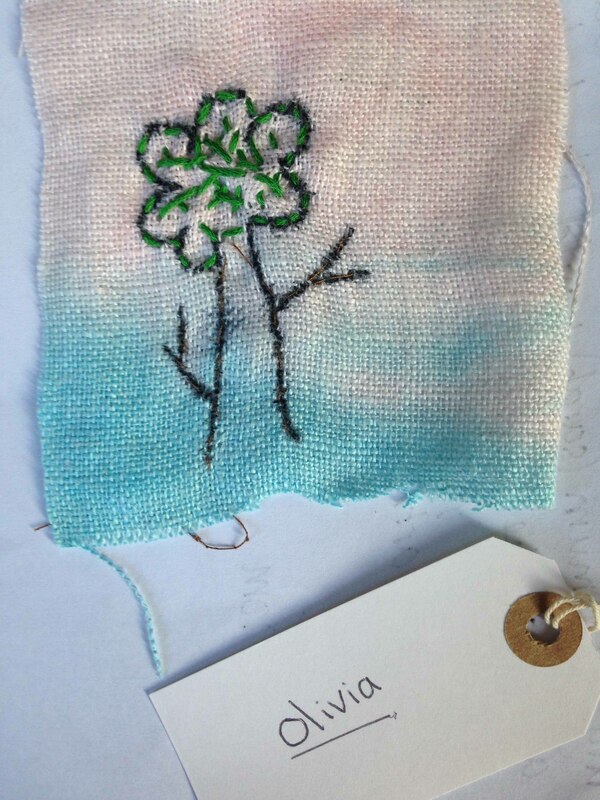 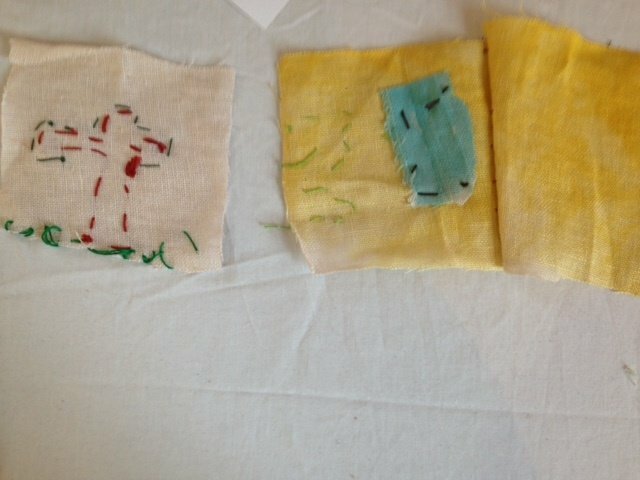 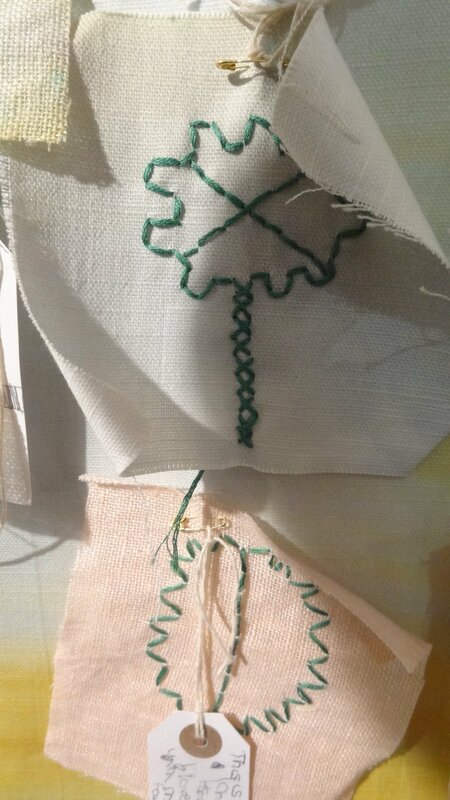 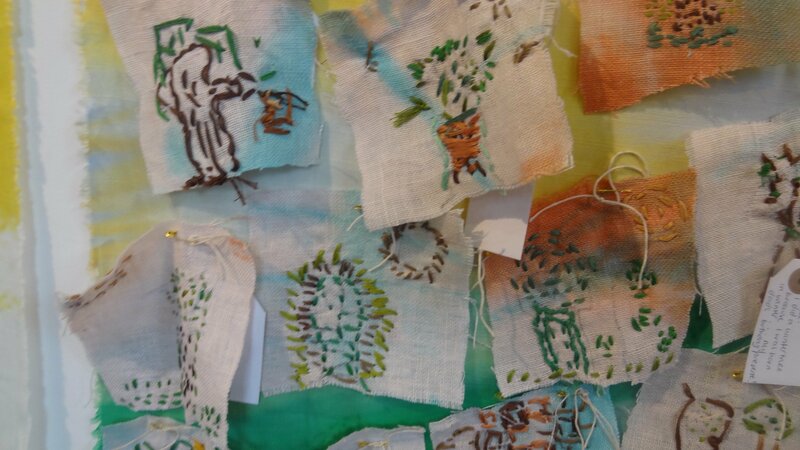 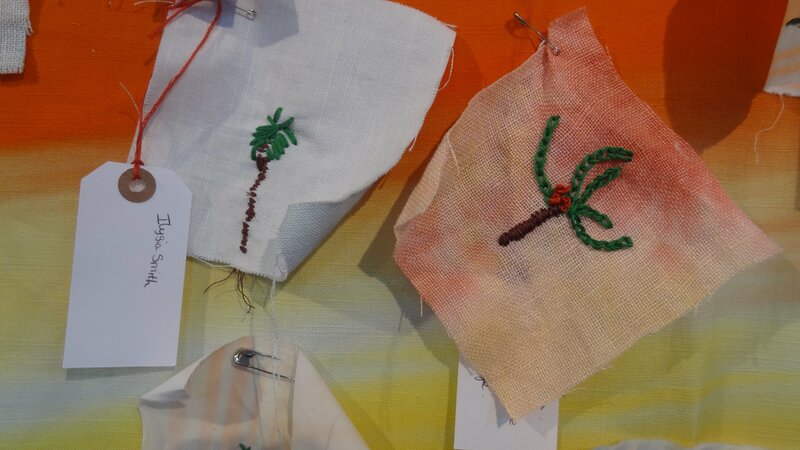 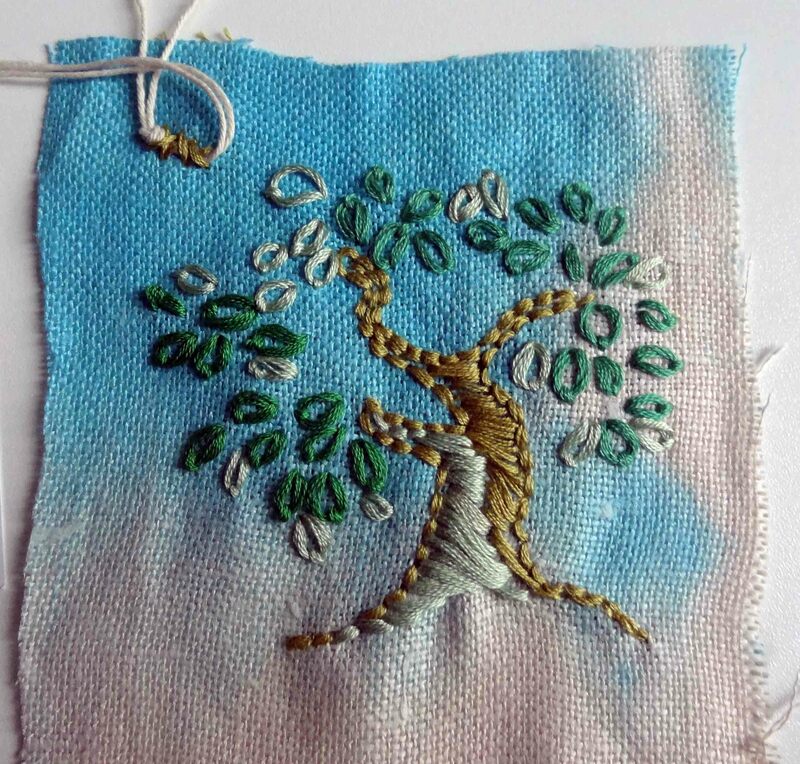 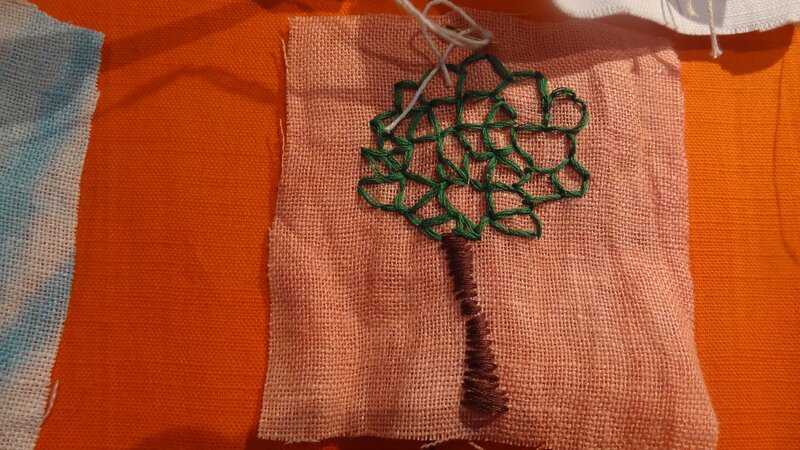 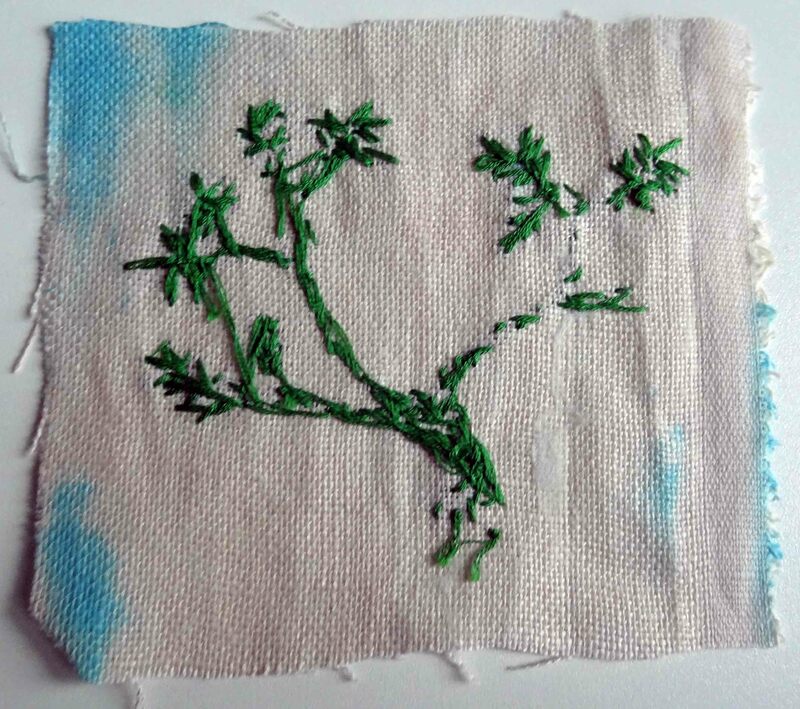 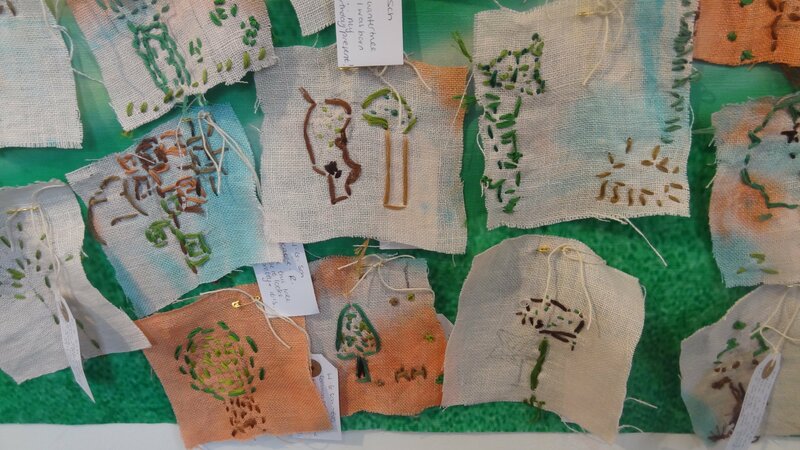 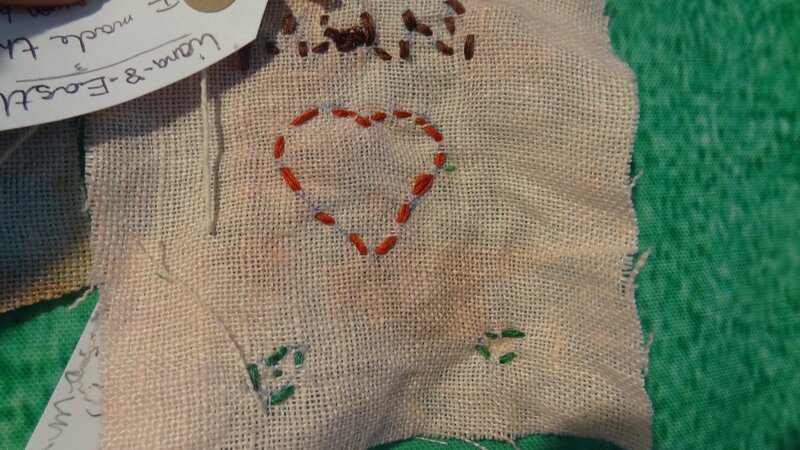 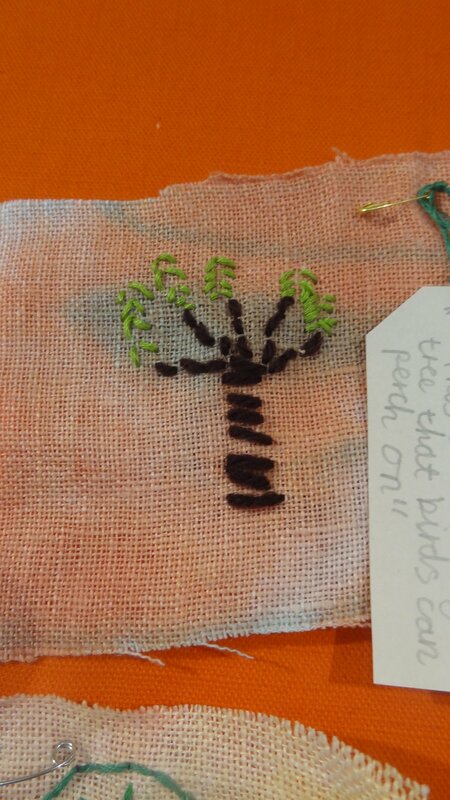 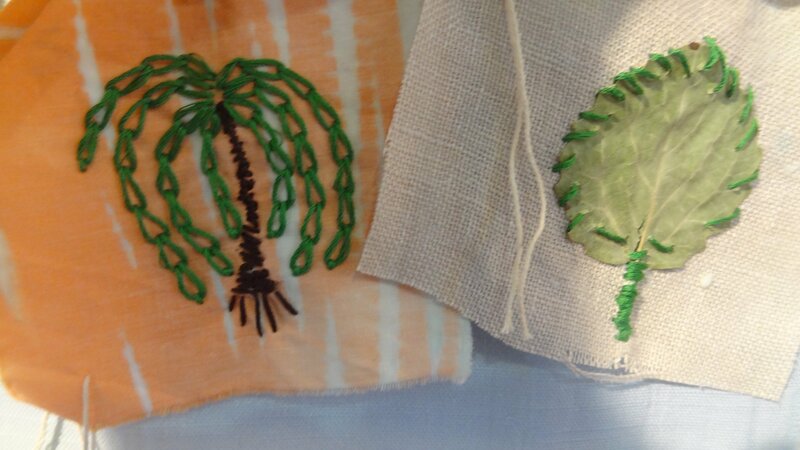 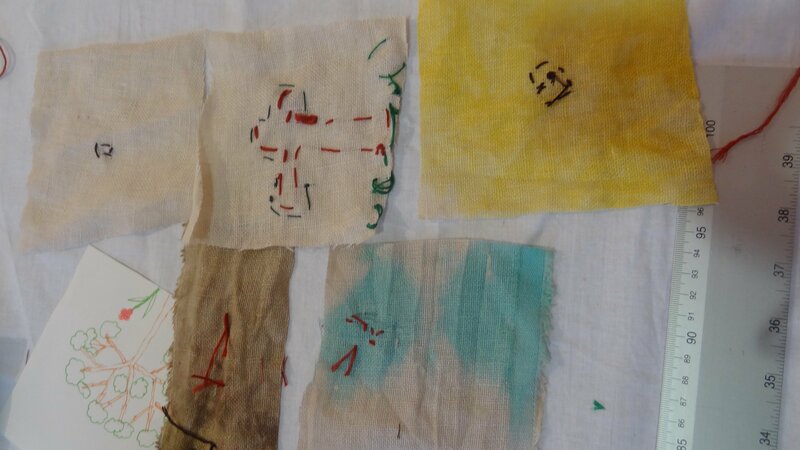 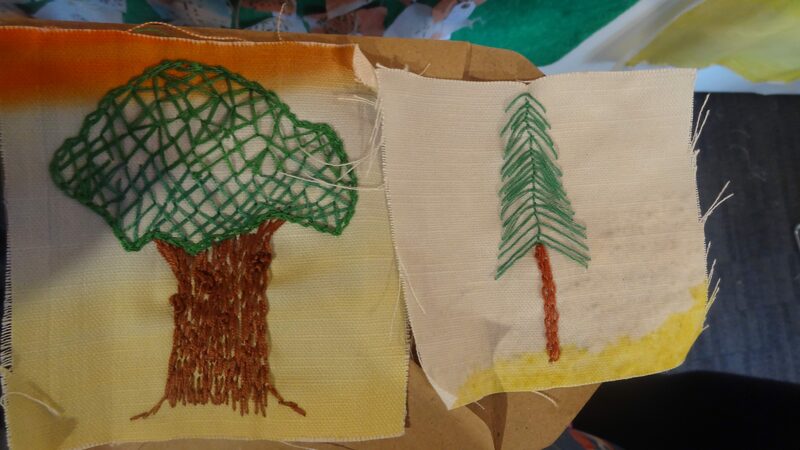 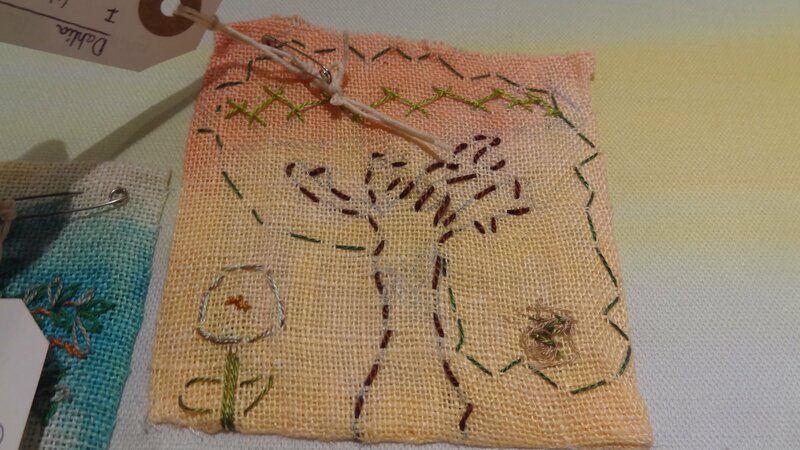 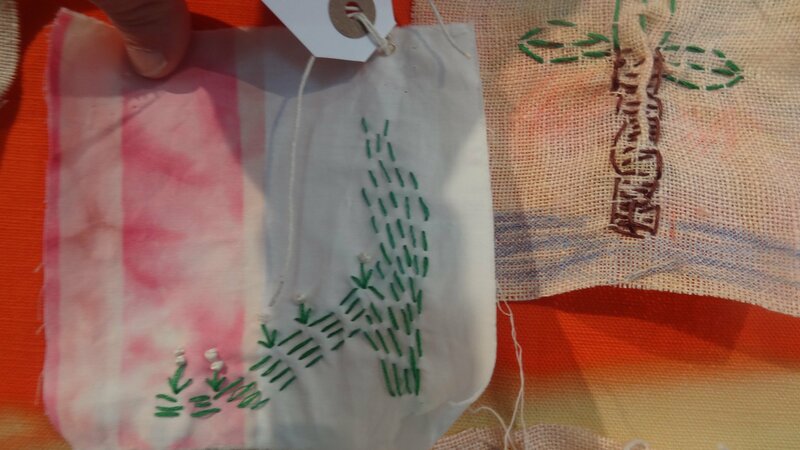 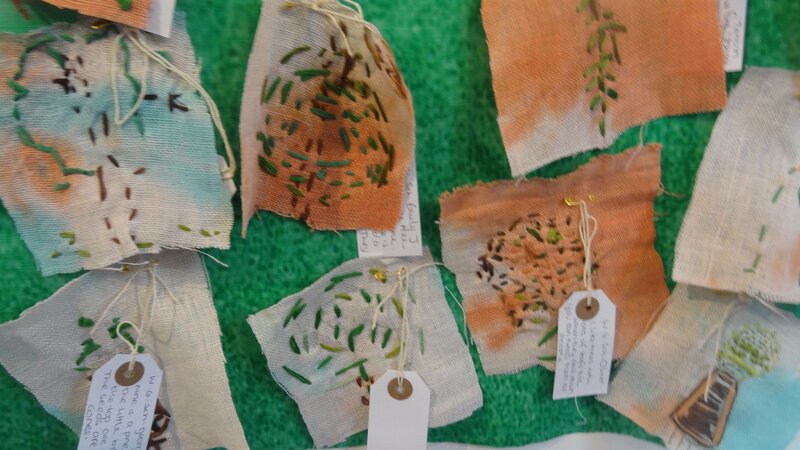 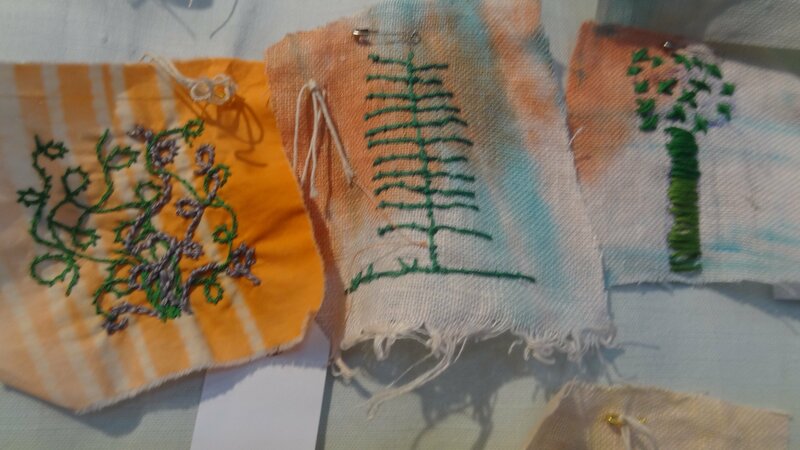 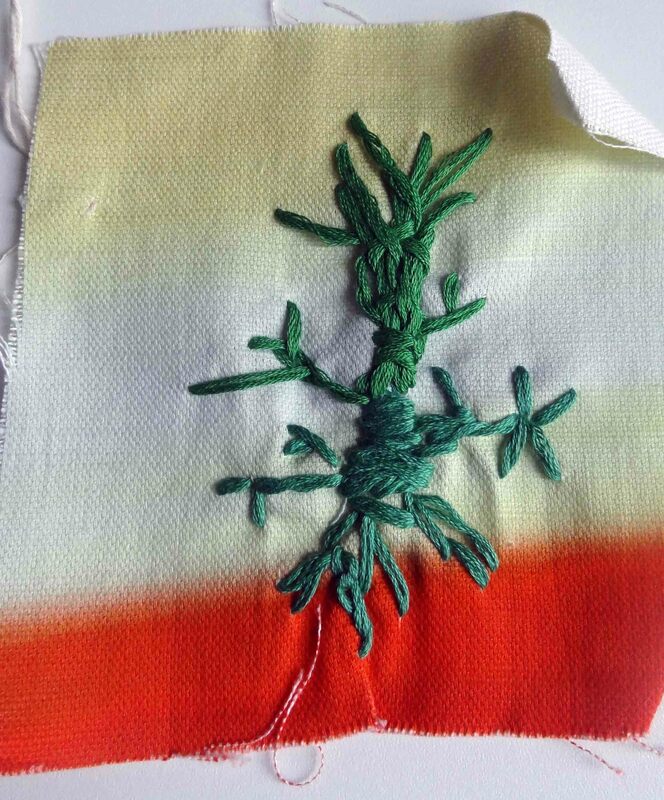 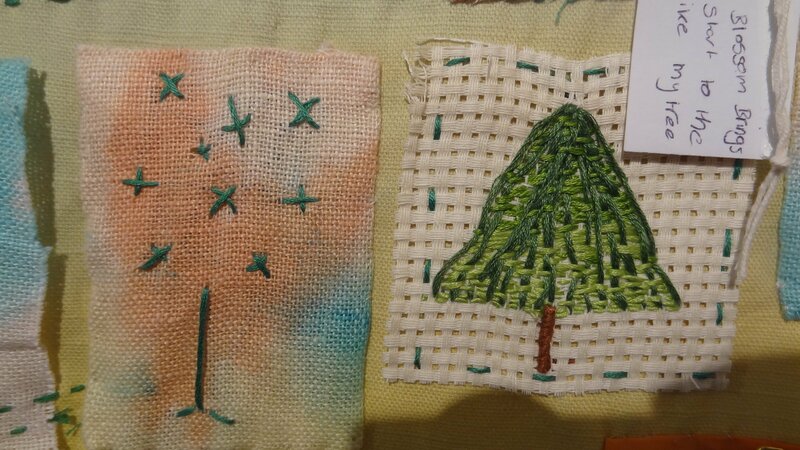 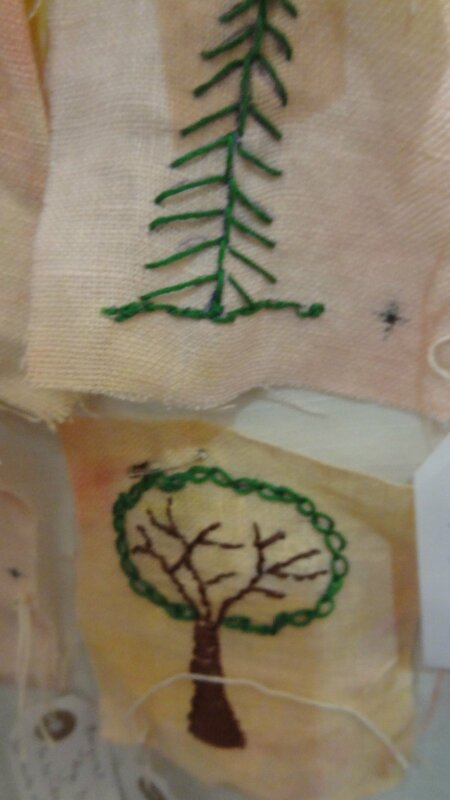 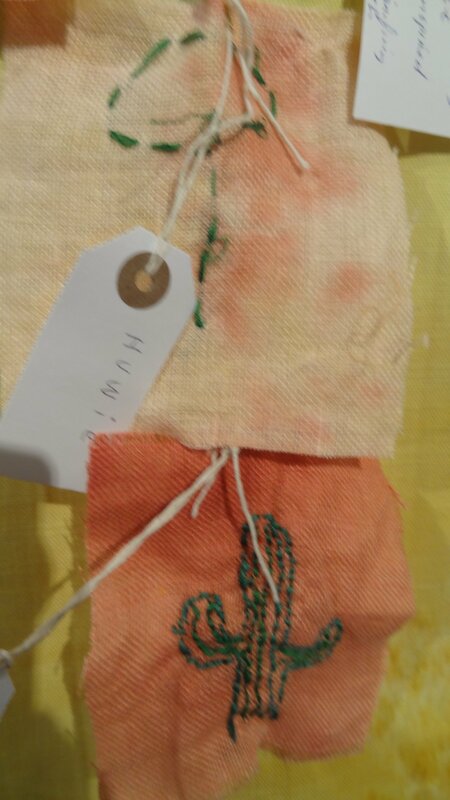 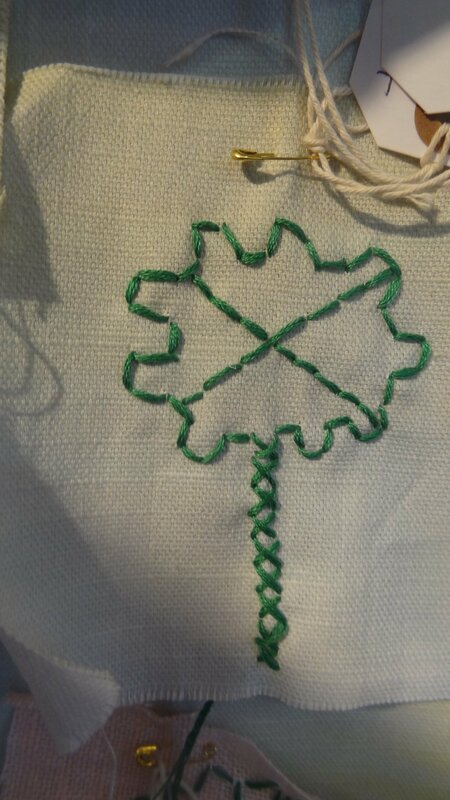 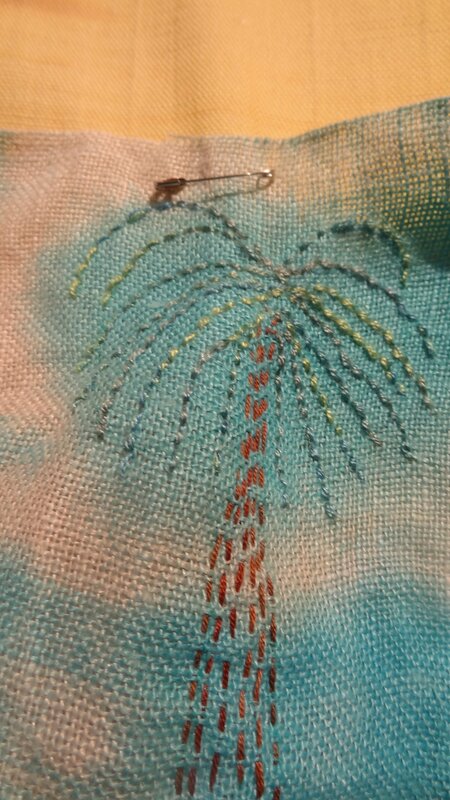 You can still be involved in the project using your own materials – a loose weave cotton with green and brown embroidery thread. 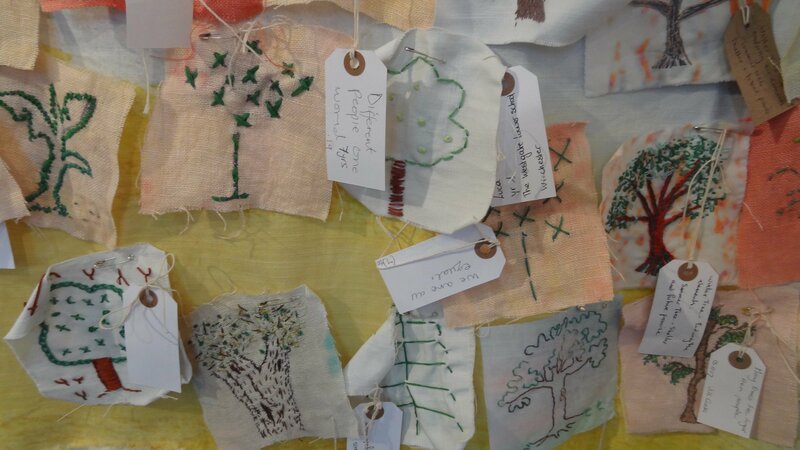 Please post your tree (see below) or bring it to the Whitworth before 28th February 2019 and it will be added to the Forest during the exhibition. 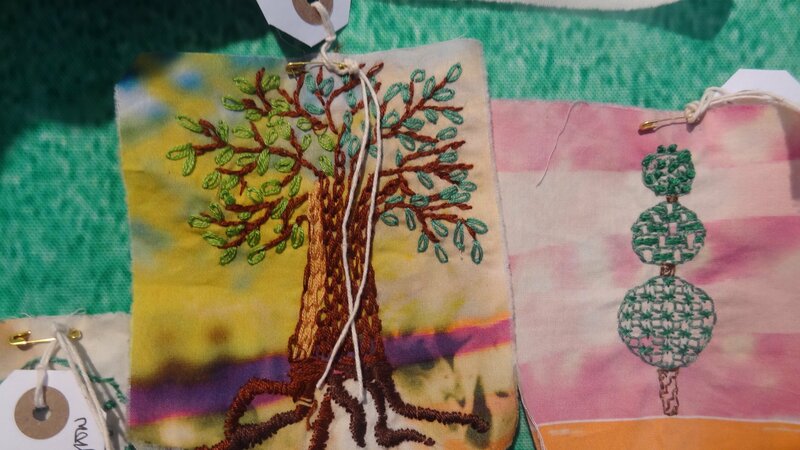 Emails: For the duration of the project – until 28th February 2019 – we will hold the content of the email you sent to us in the first instance (to request a pack). 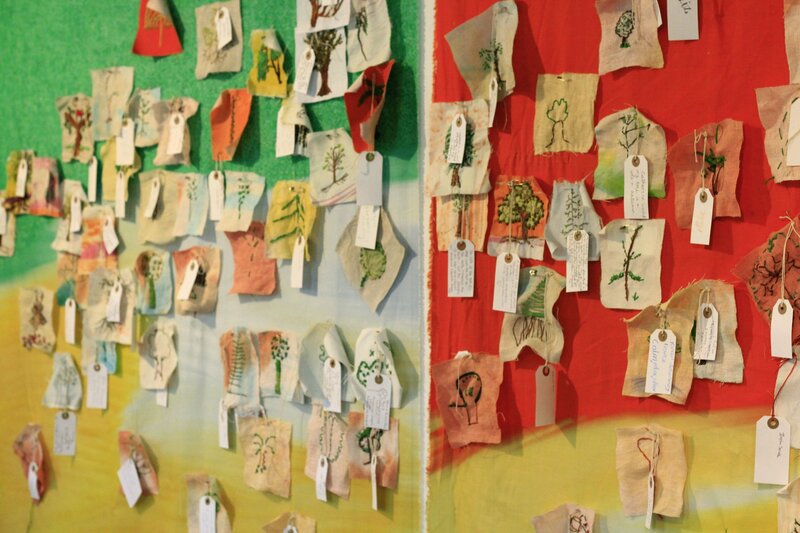 At the end of the project all email content and addresses will be permanently deleted. 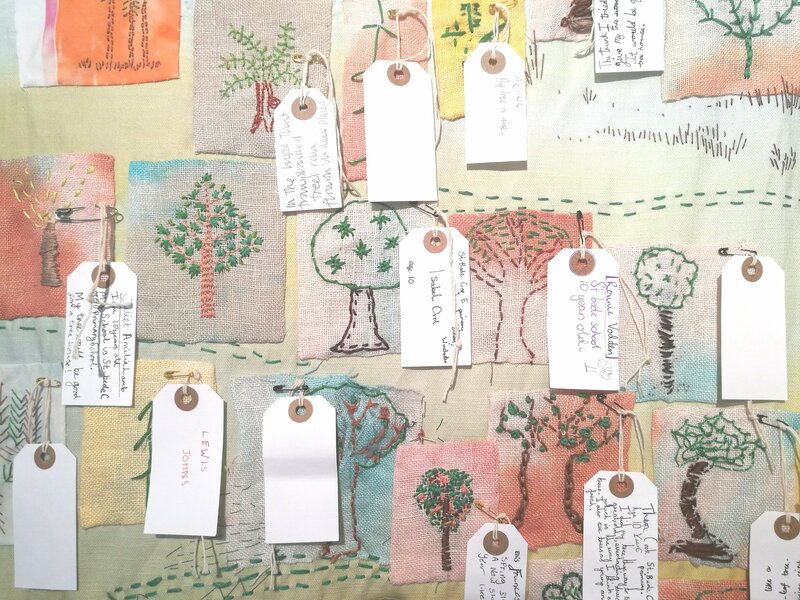 We will not use your email address or the content of your email for any other purpose other than to contact you (should we need to) to contribute to interpretation on our website threadbearingwitness.com and / or in the exhibition, or to gather statistical data for the project. 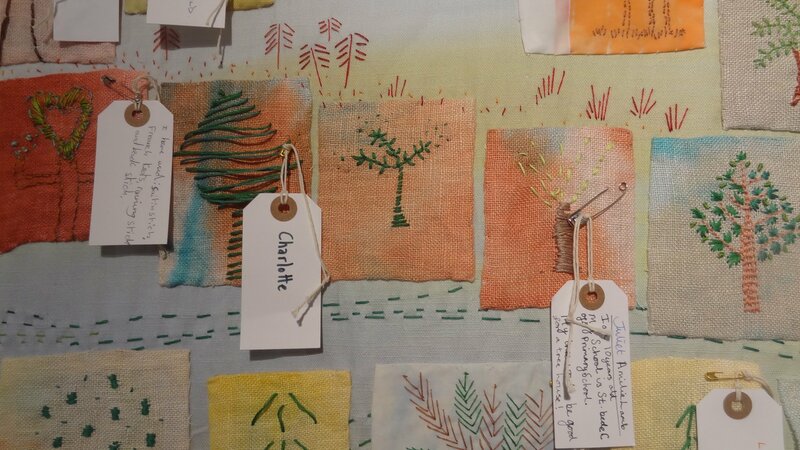 Your data will not be shared with anyone else. 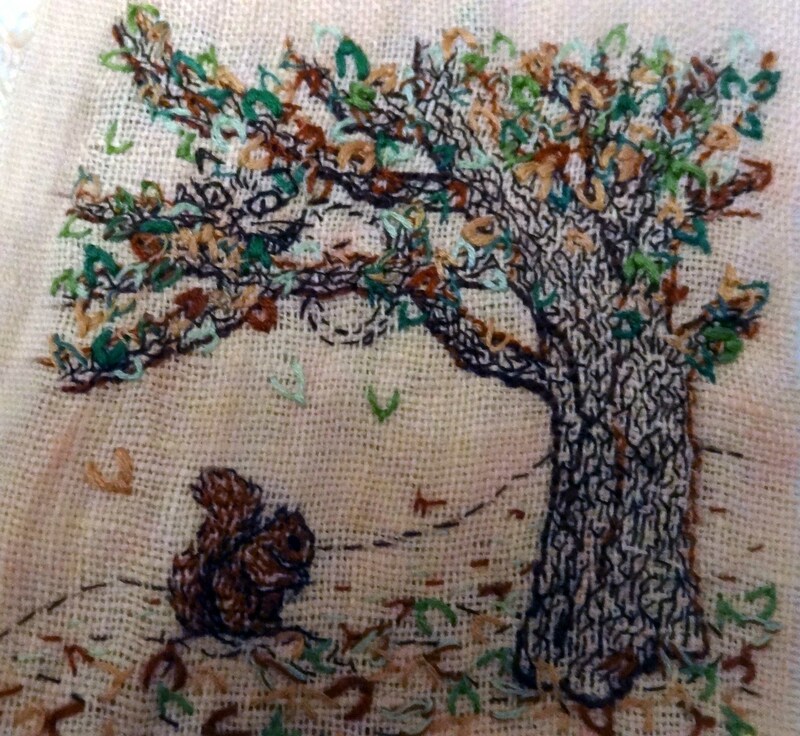 If you wish your data to be deleted sooner please contact us at: threadbearingwitness@gmail.com. 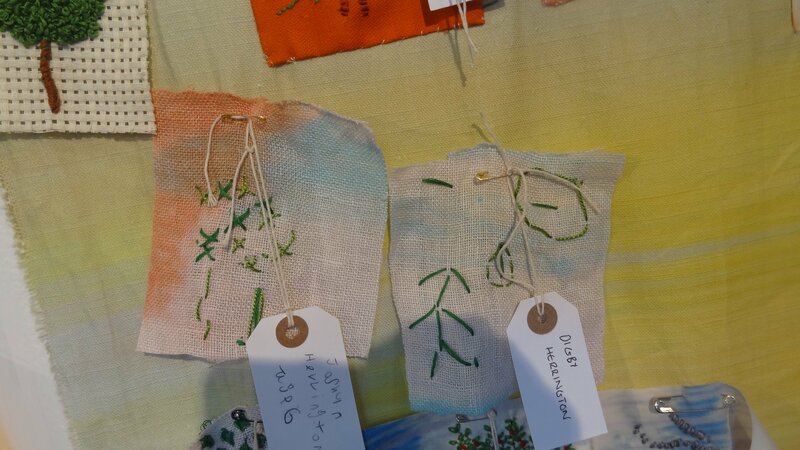 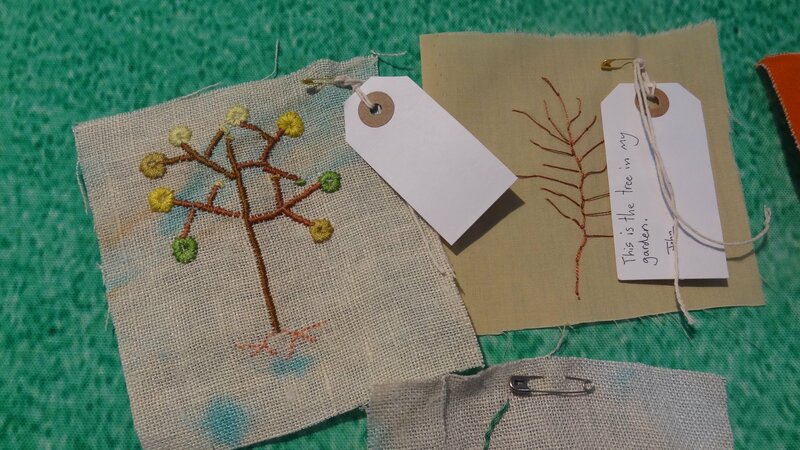 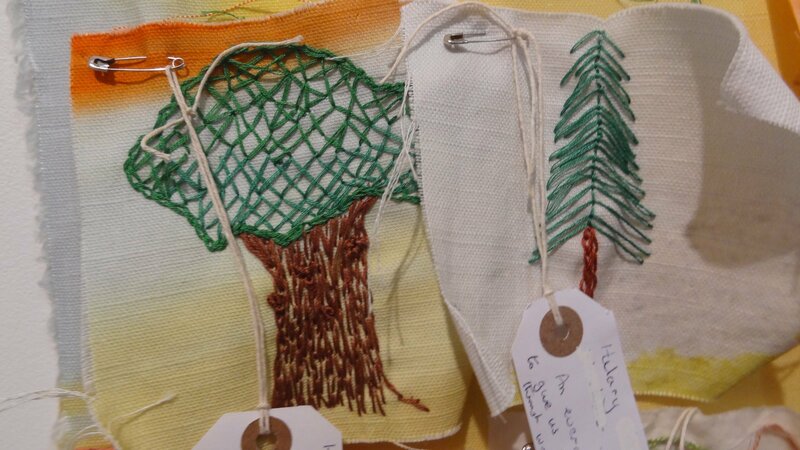 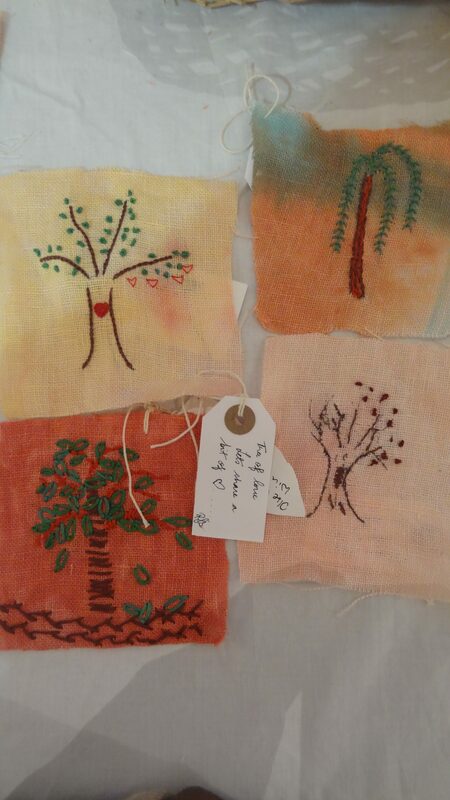 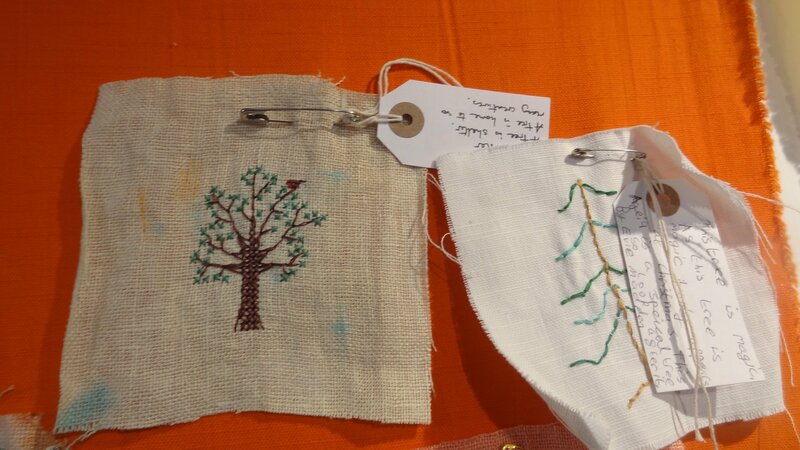 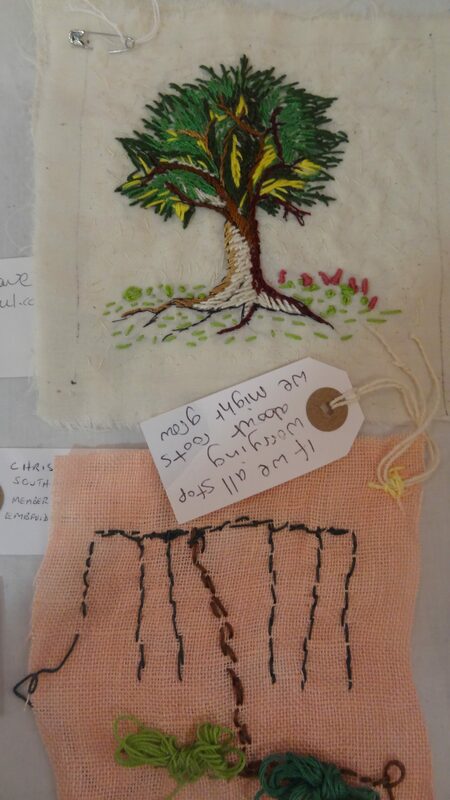 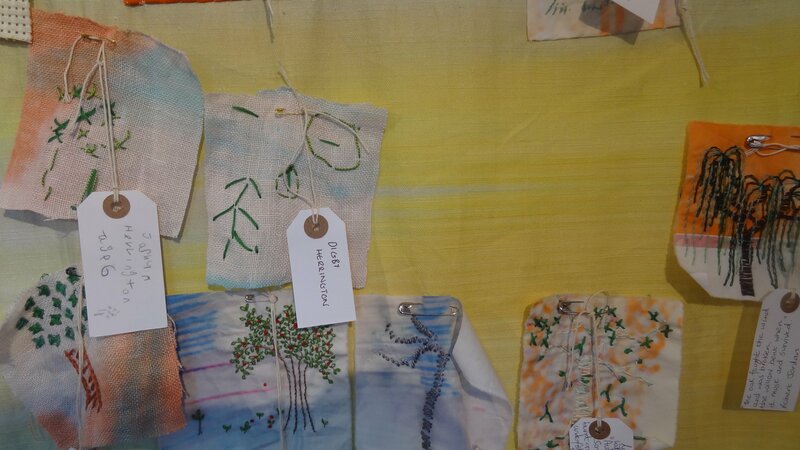 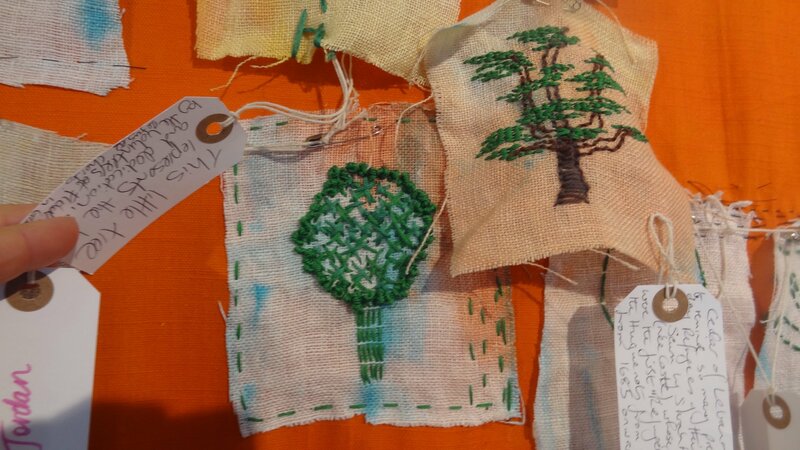 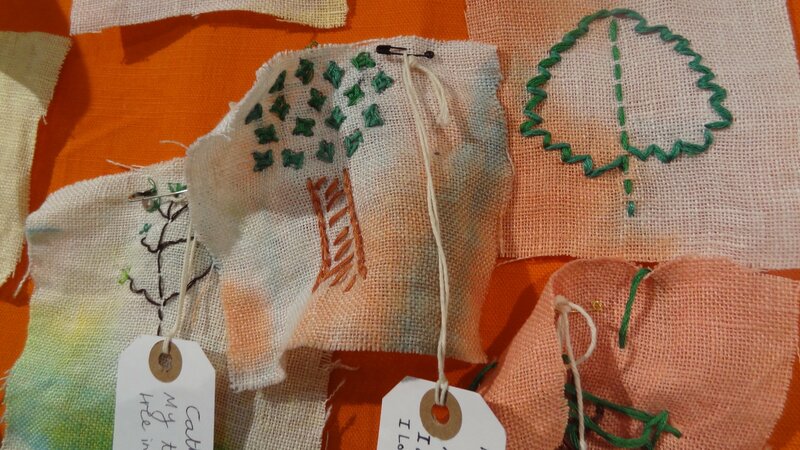 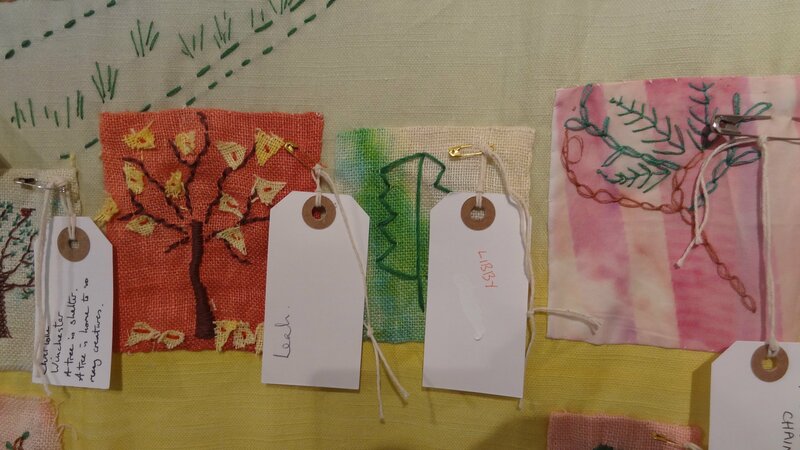 Labels: For the duration of the project – until 28th February 2019 – we will hold the labels which were sent with your stitched tree. 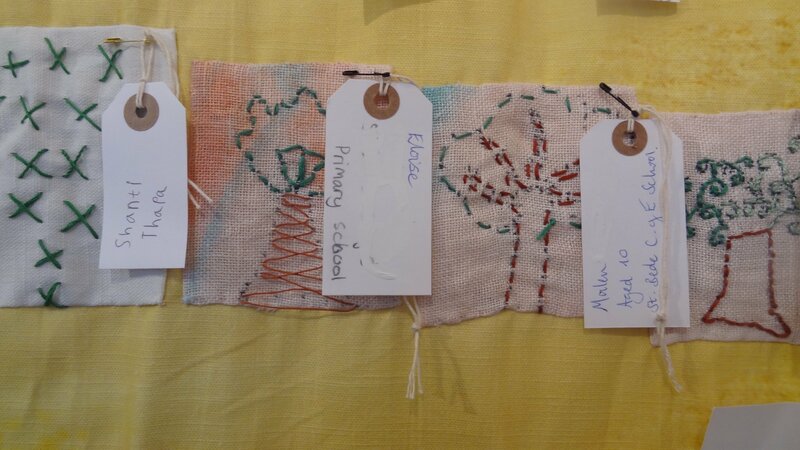 At the end of the project all labels will be permanently destroyed. 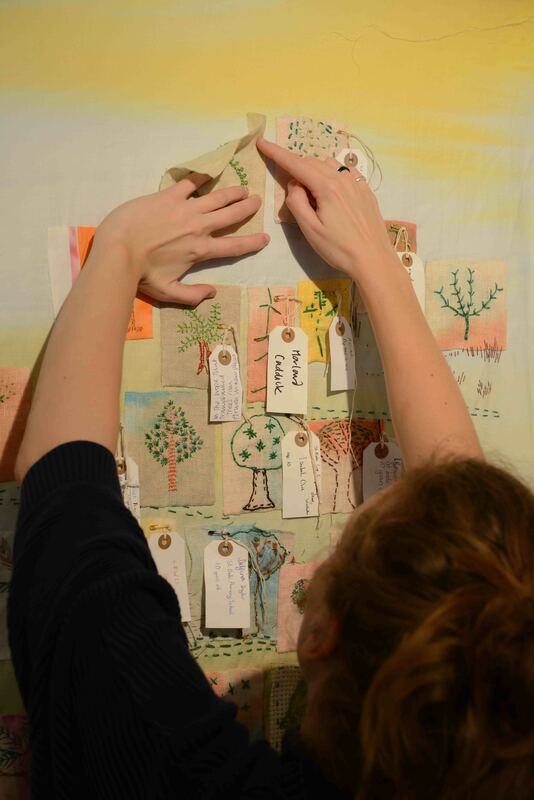 At no point during the project will the labels themselves be shown – this is to adhere to data protection guidelines. 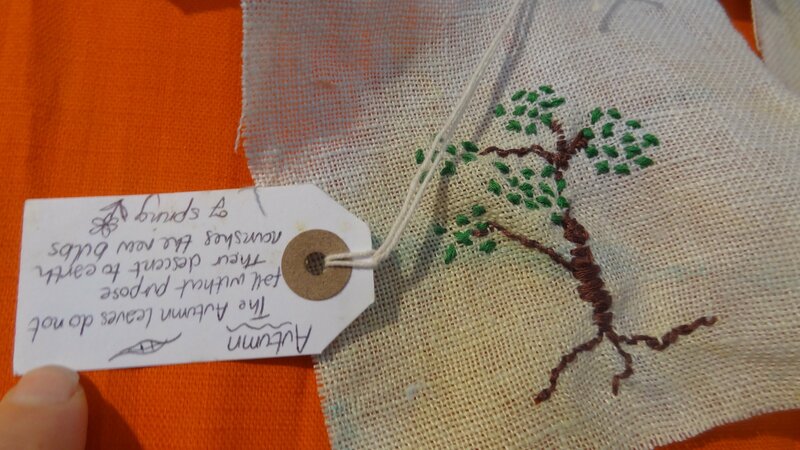 Label content: During the project we will share a selection of tree descriptions (from your labels) on our website threadbearingwitness.com and / or in the exhibition. 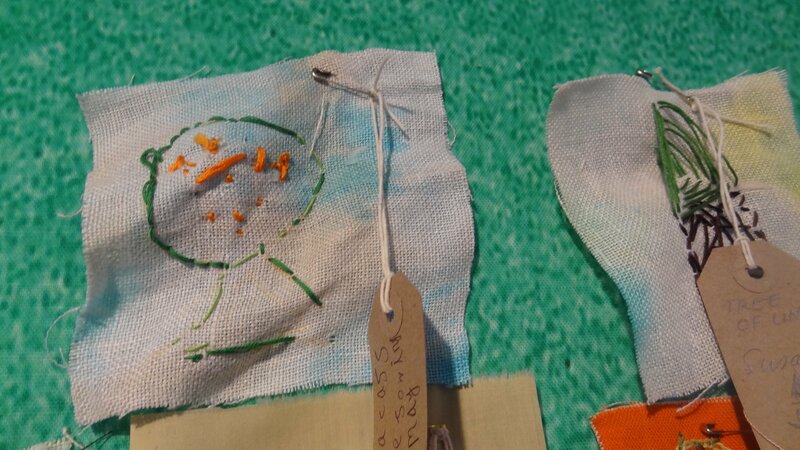 No names, emails or postal addresses will be shared. 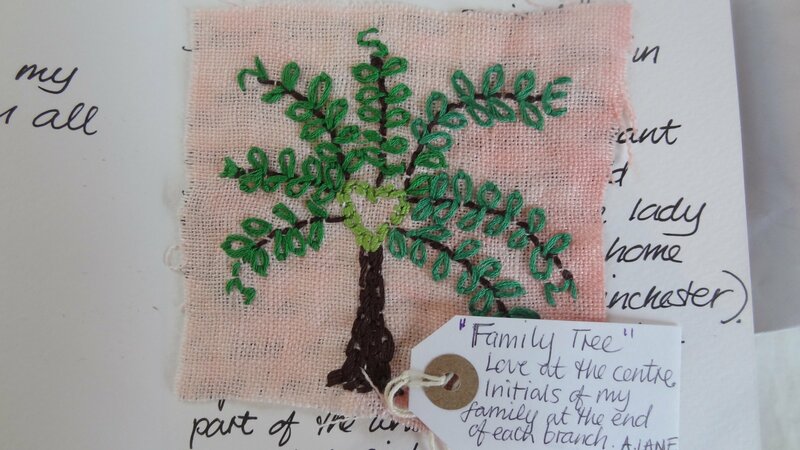 Names will only be included when they were written, by the contributor, within the content of the tree description. 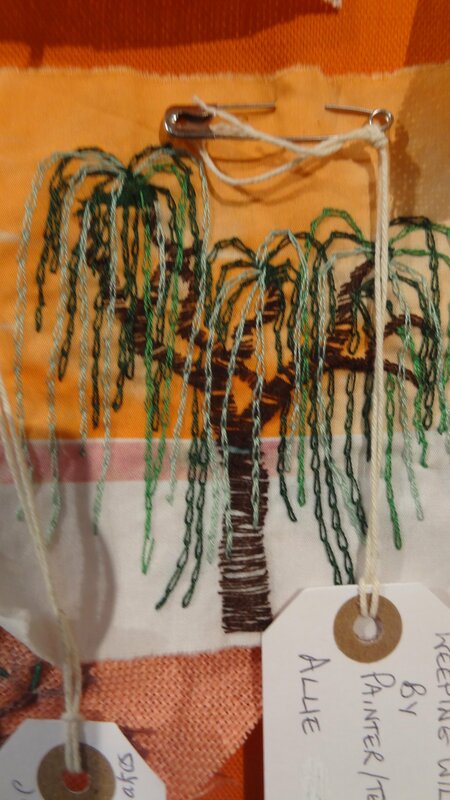 As far as possible we have aimed to directly duplicate the descriptions of your trees to form a list of descriptions. 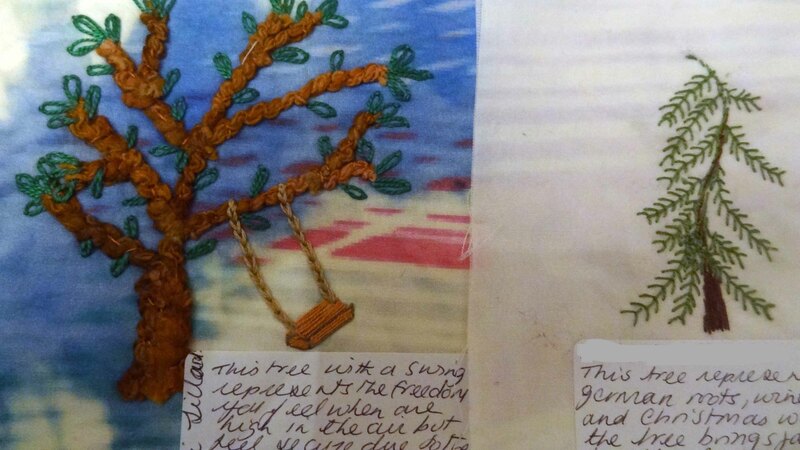 Where text was difficult to read it has been necessary for us to omit words or make an educated guess. 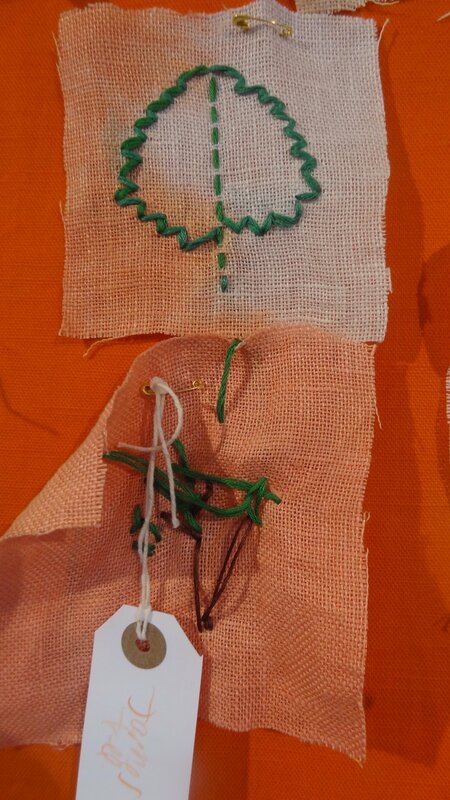 We apologise for any errors that might have occurred in duplicating the written content of your label. 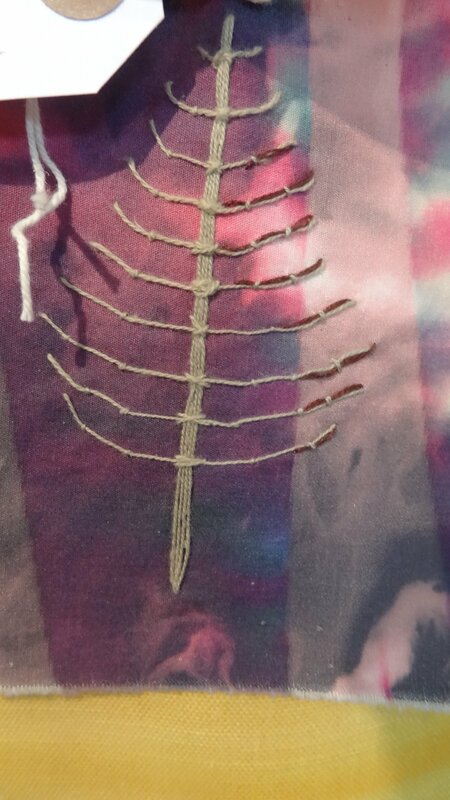 If you find a mistake, please contact us. 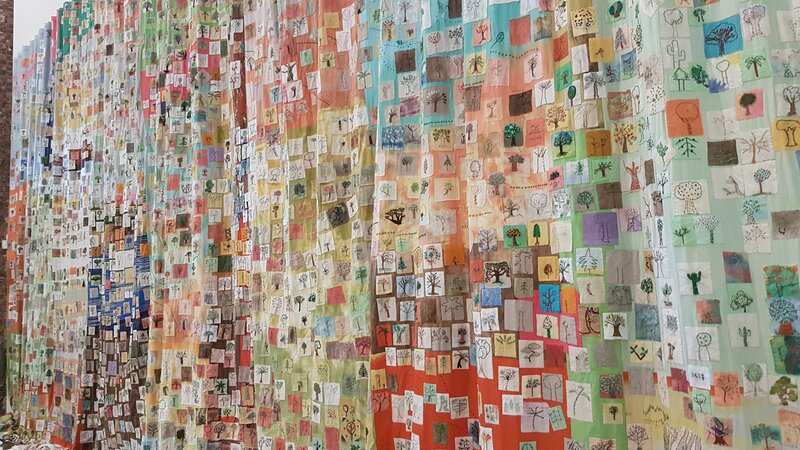 Every effort will be made to make corrections, however due to the very large number of contributions it may not be possible in all cases. 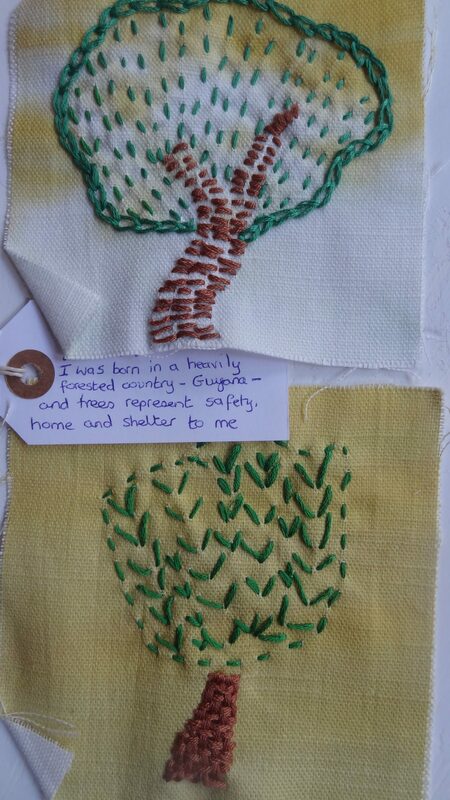 Packs containing fabric, thread and a printed booklet can be posted to you and are available by emailing threadbearingwitness@gmail.com. 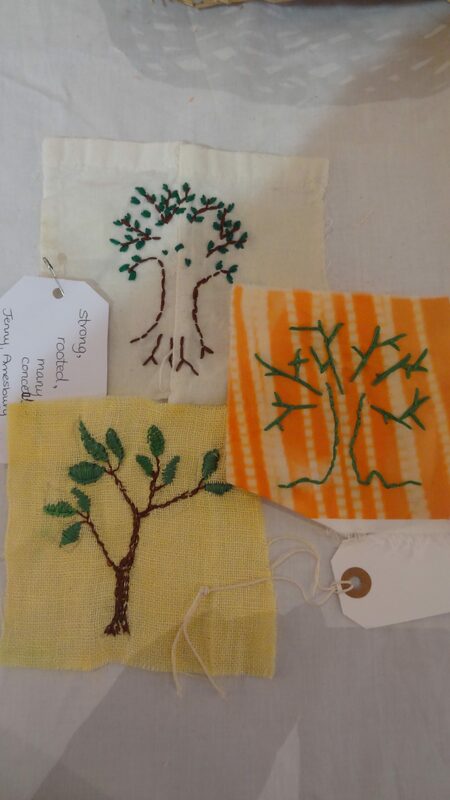 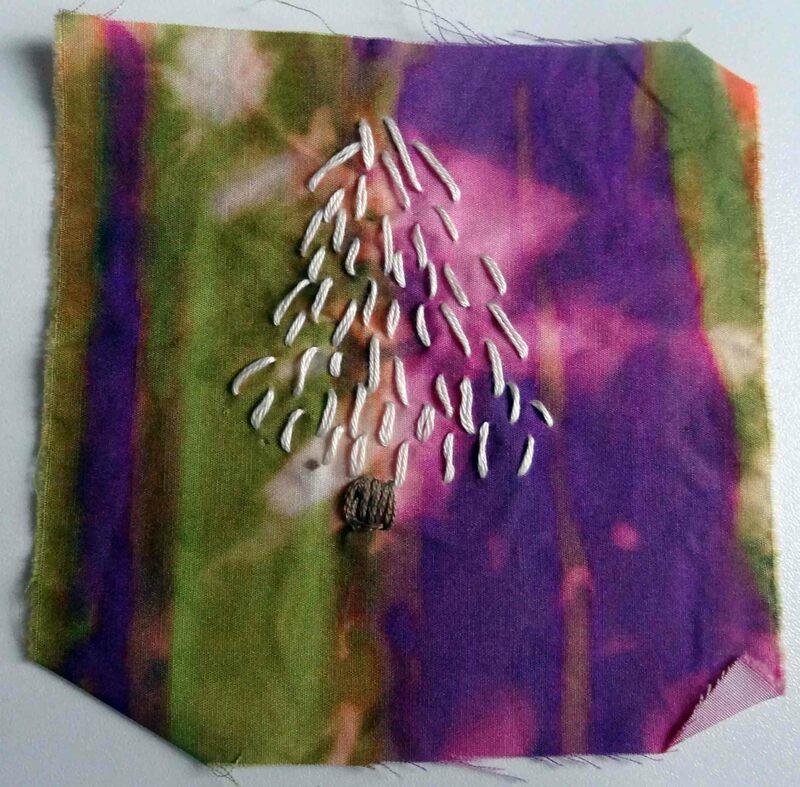 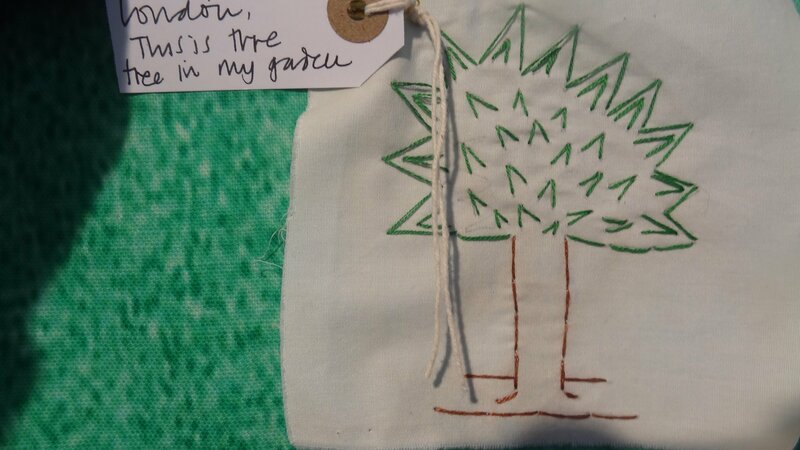 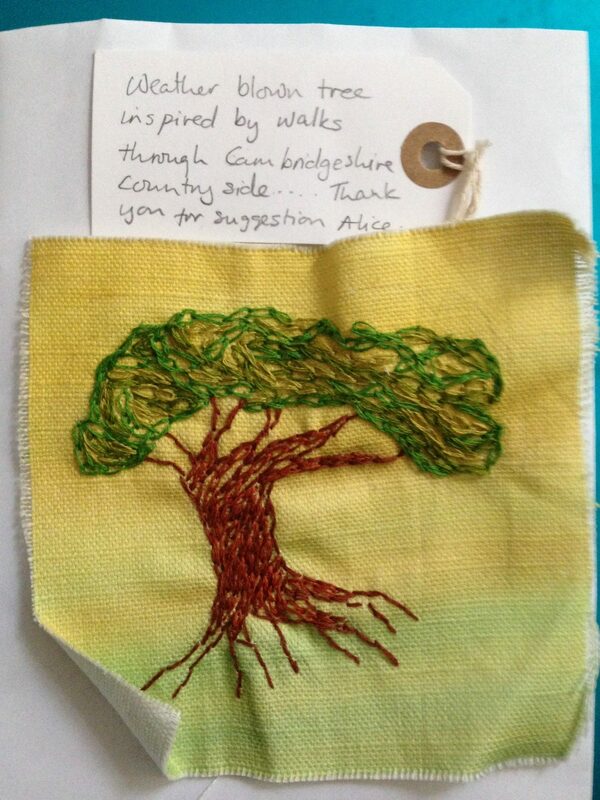 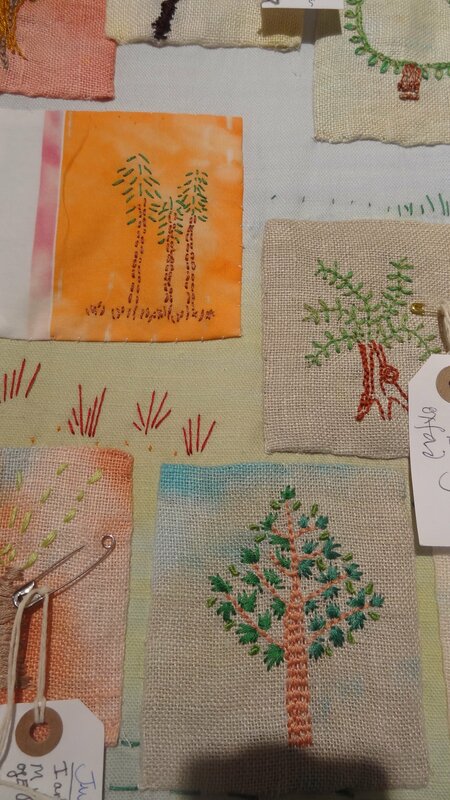 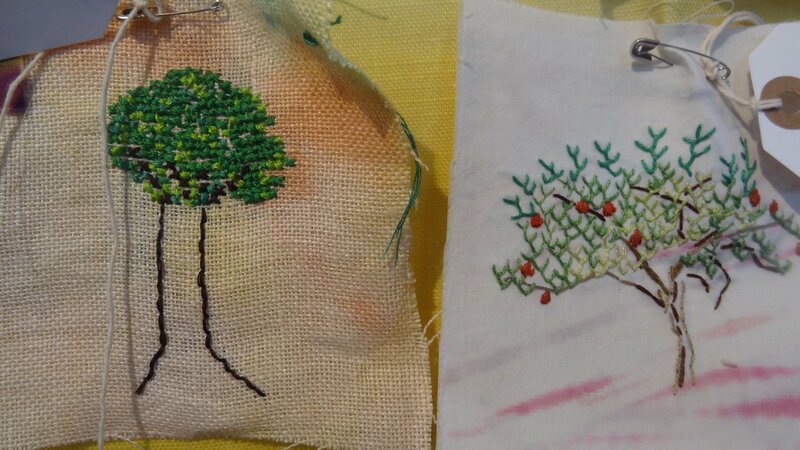 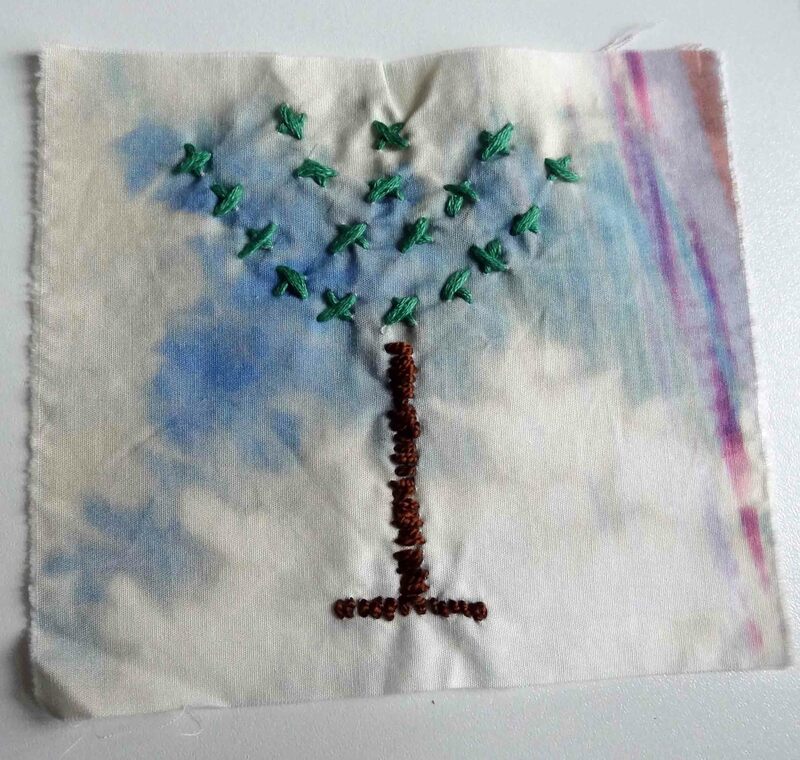 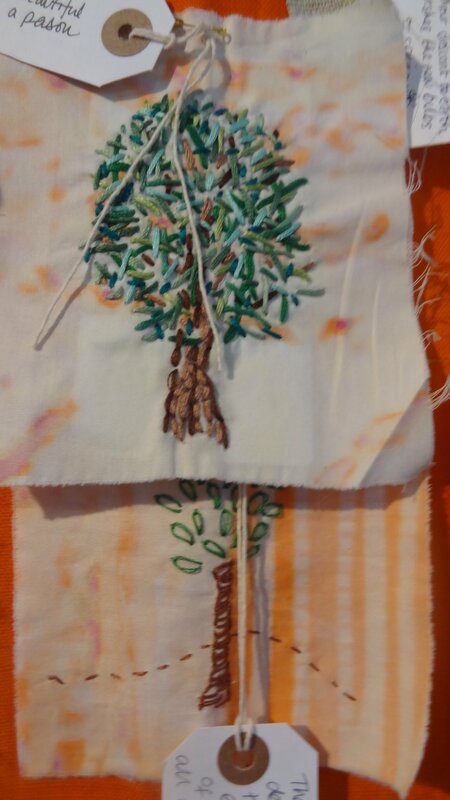 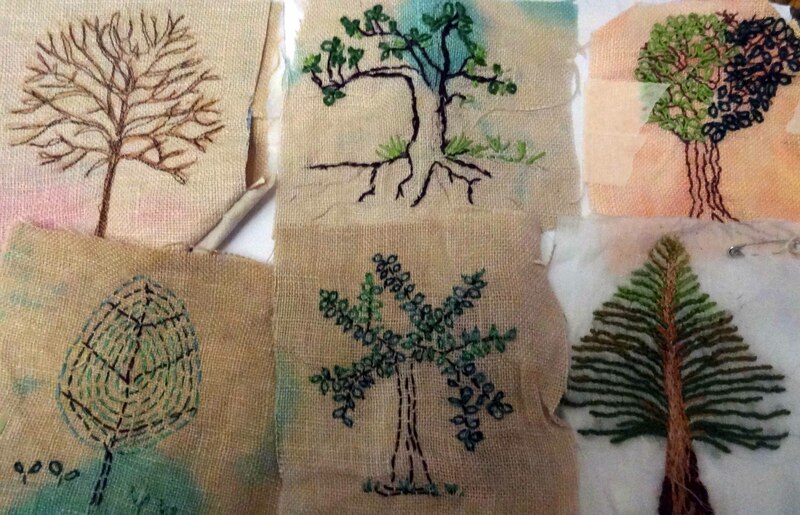 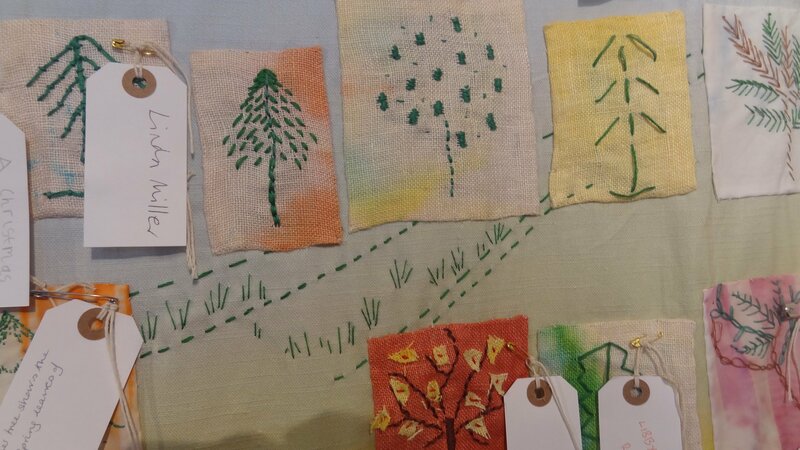 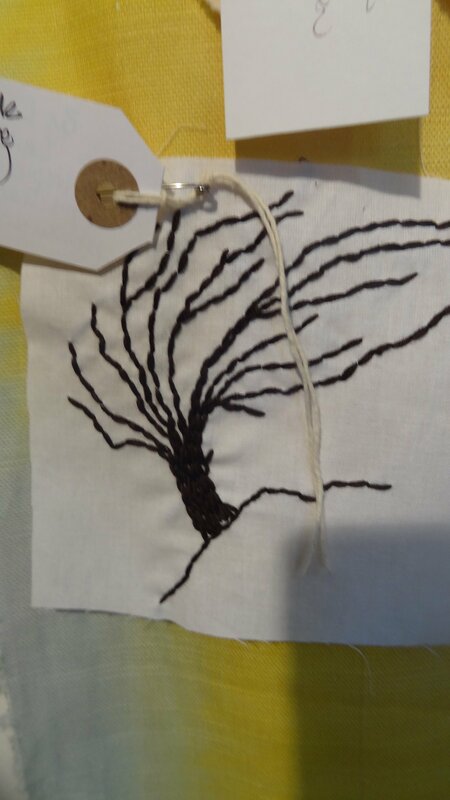 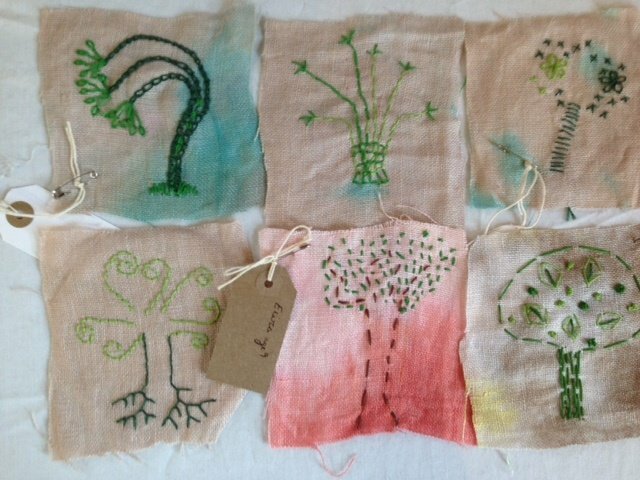 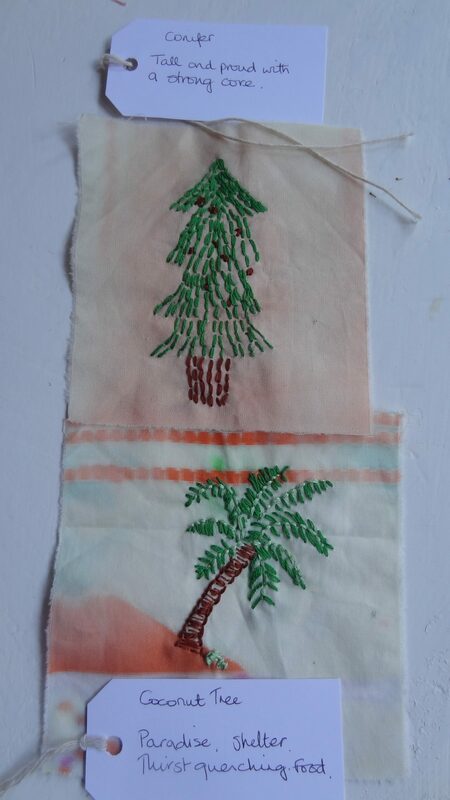 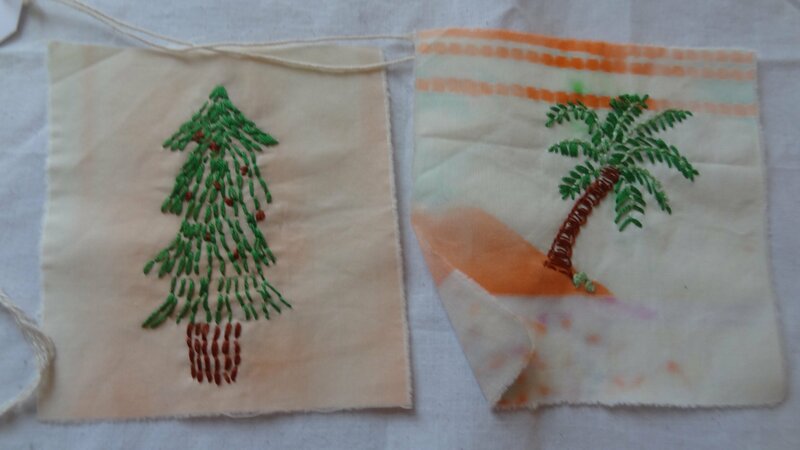 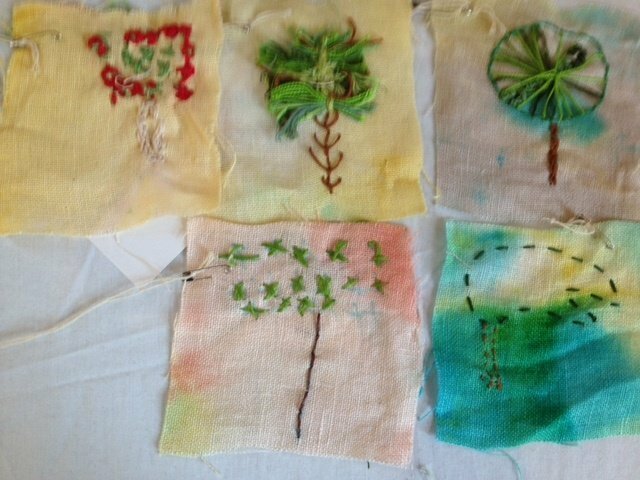 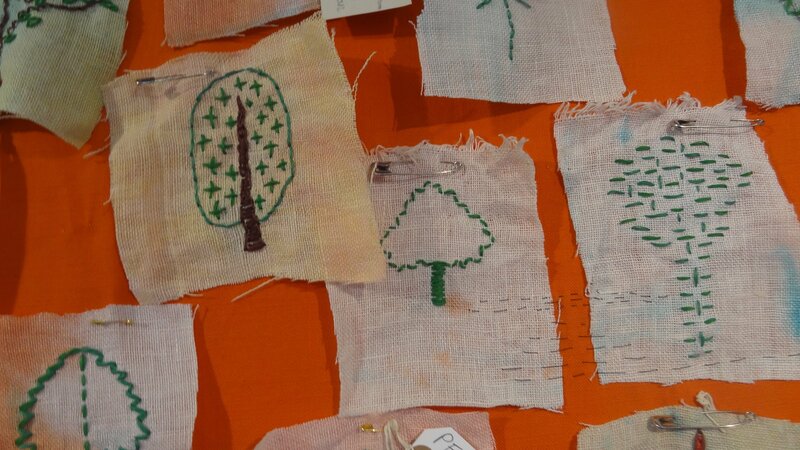 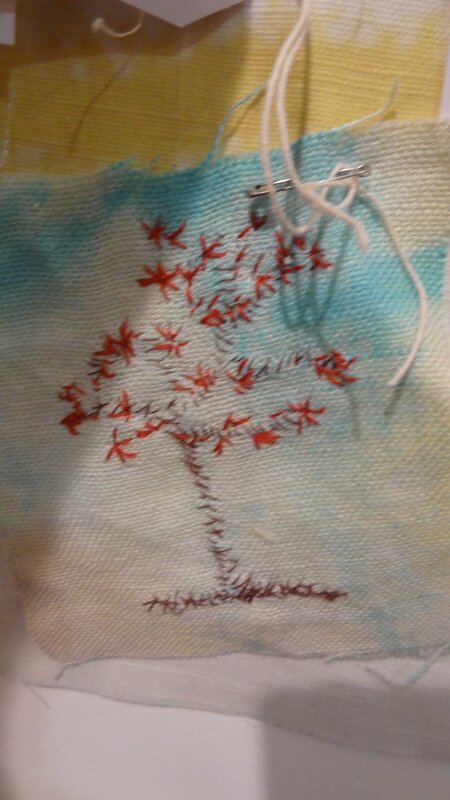 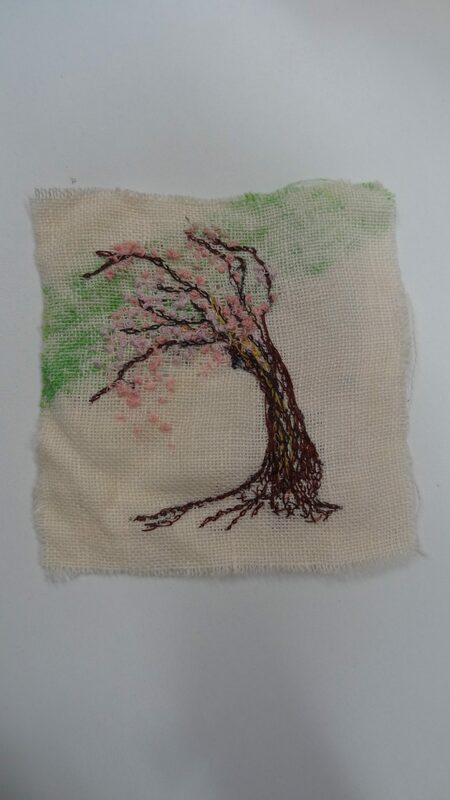 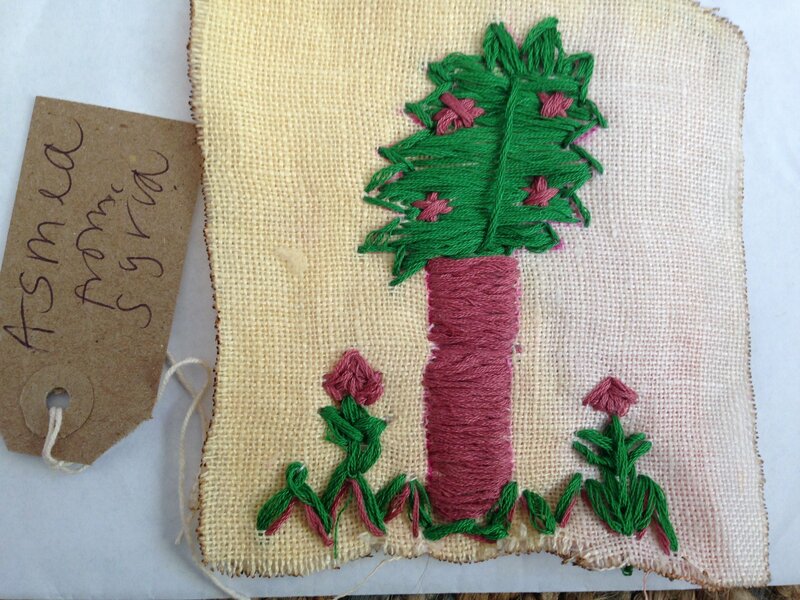 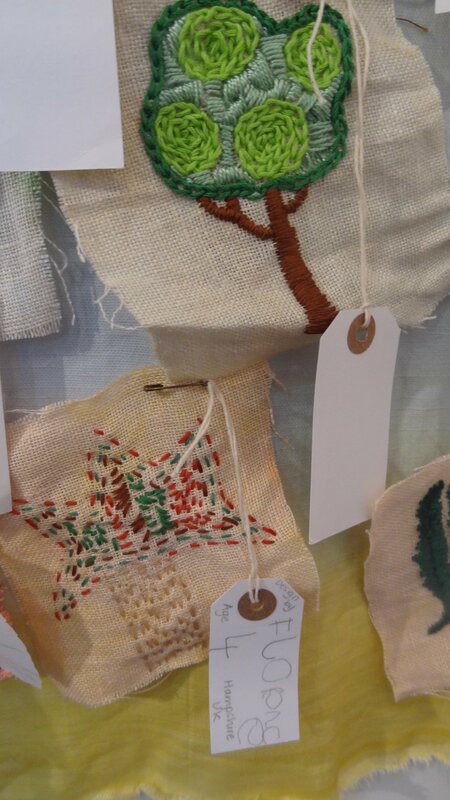 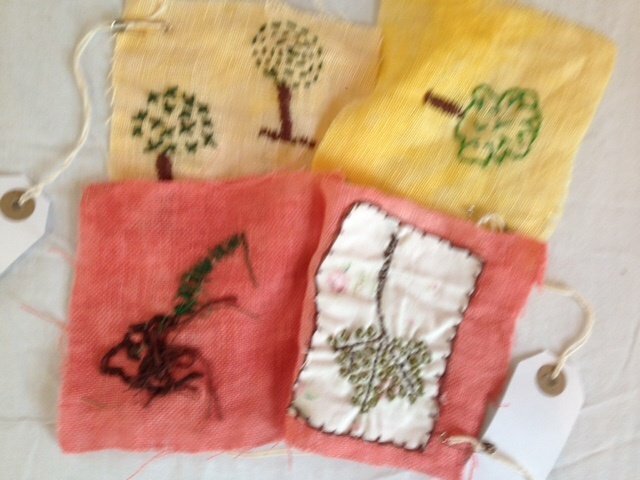 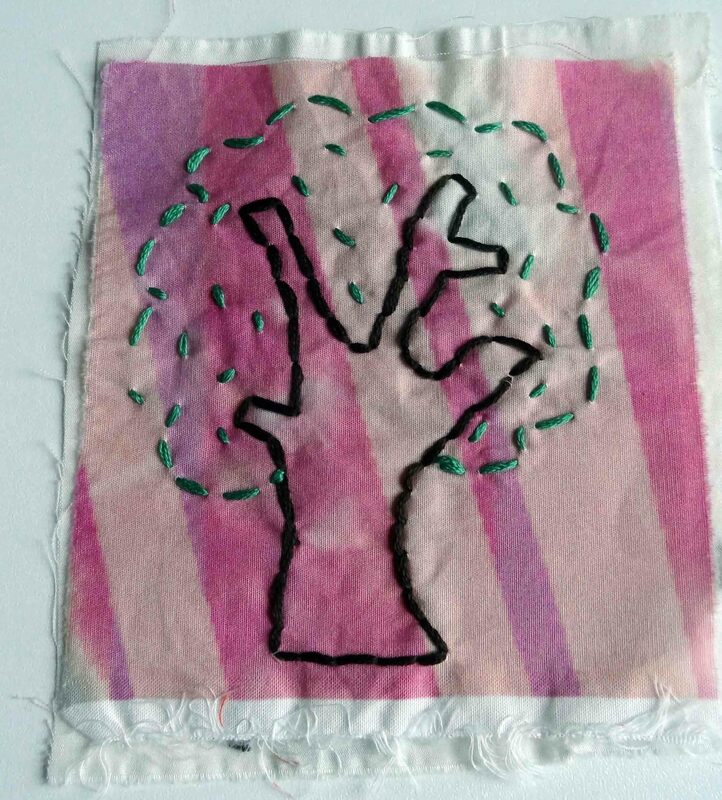 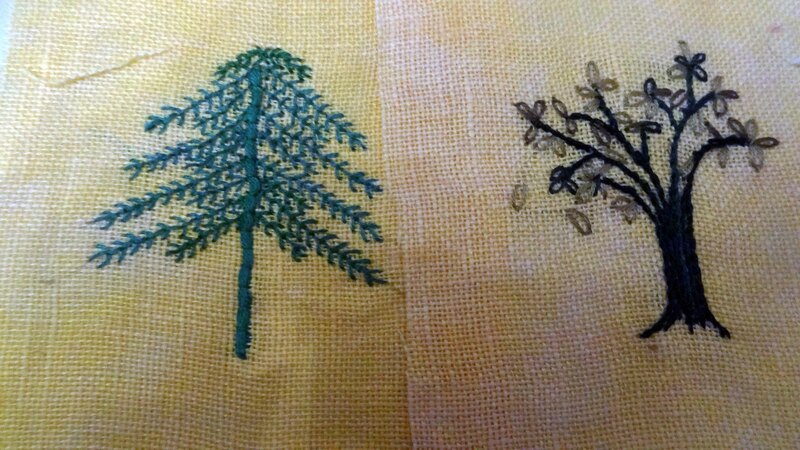 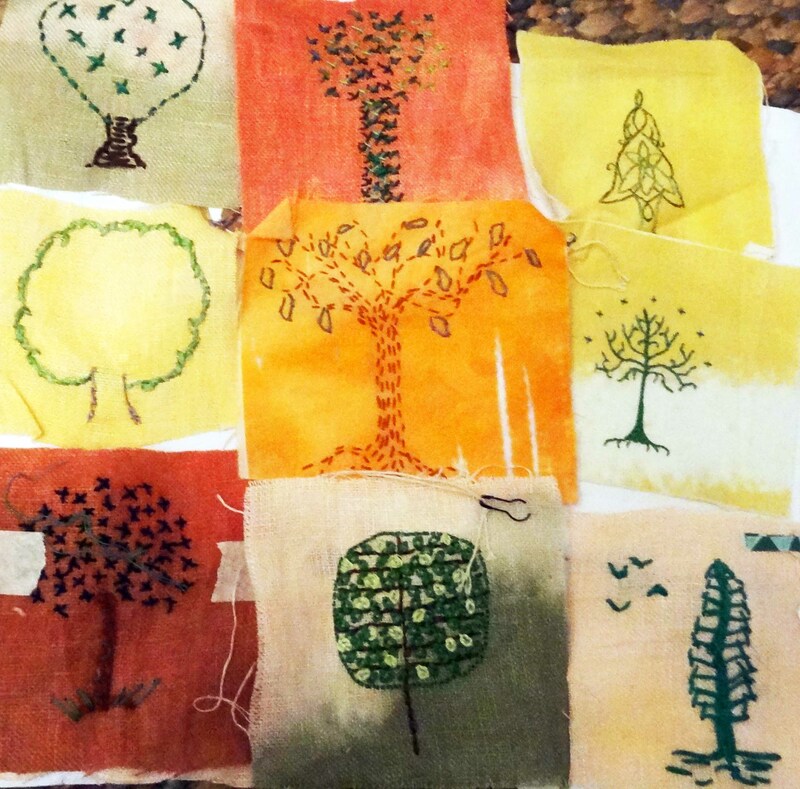 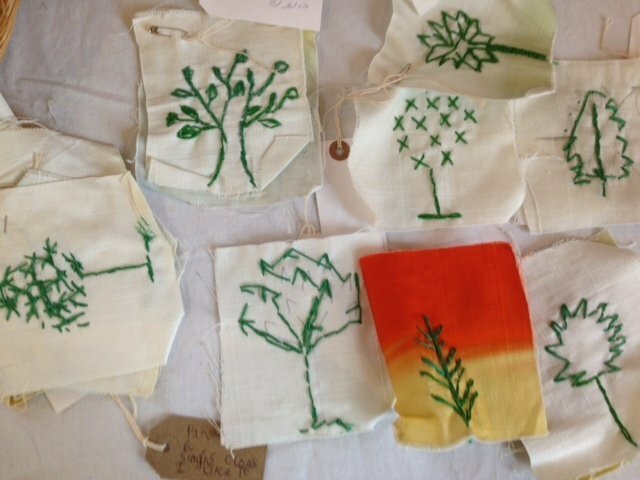 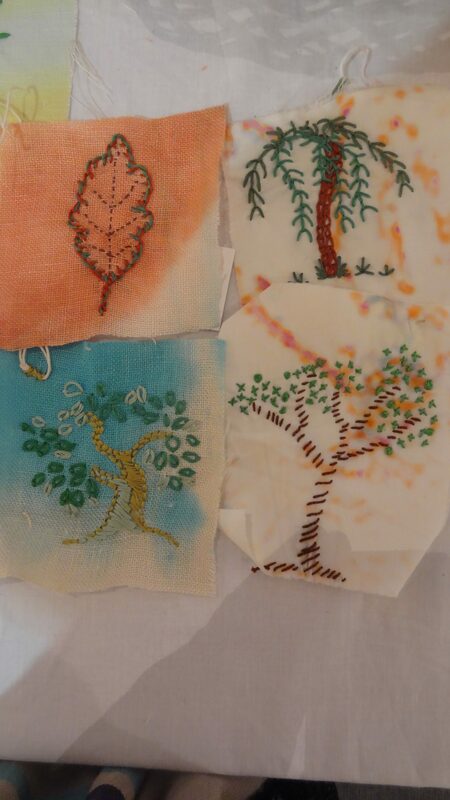 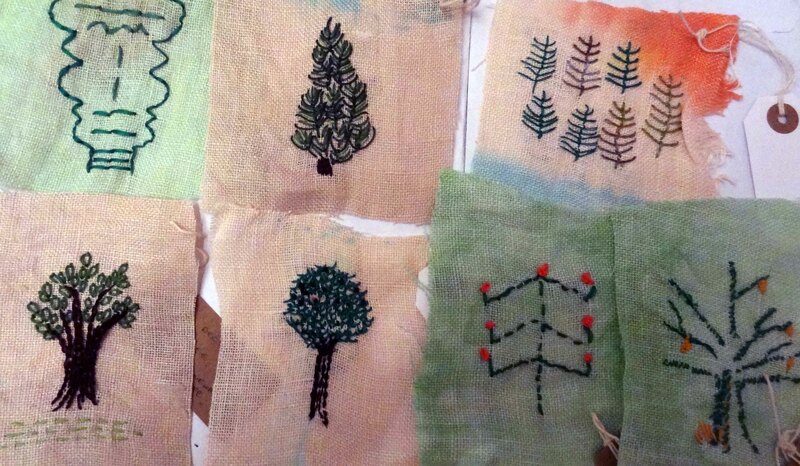 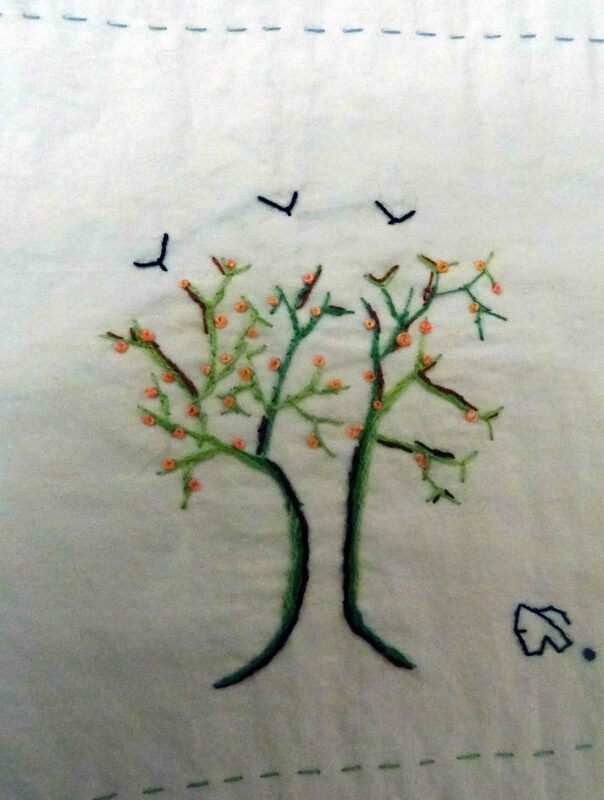 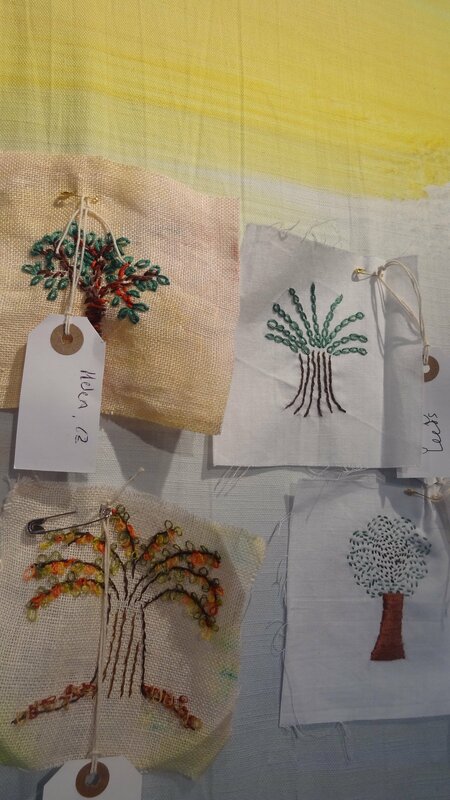 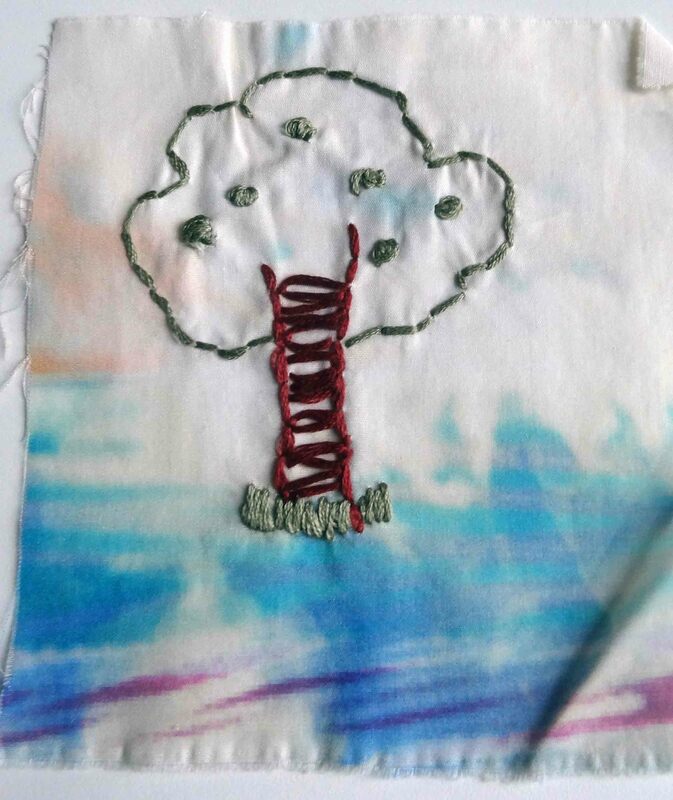 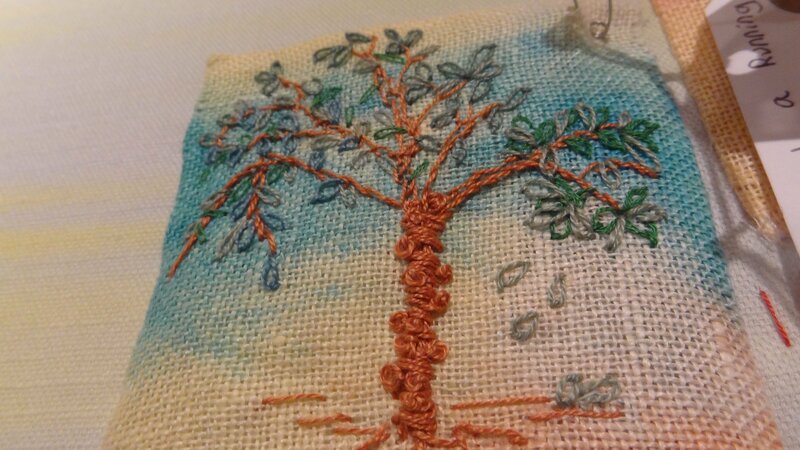 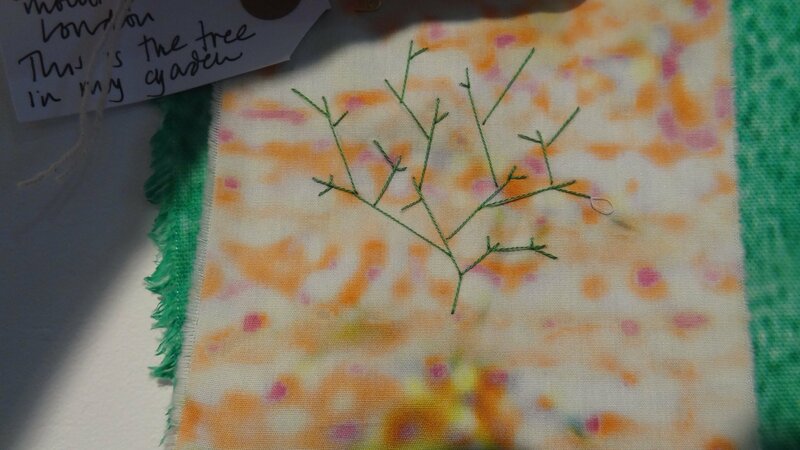 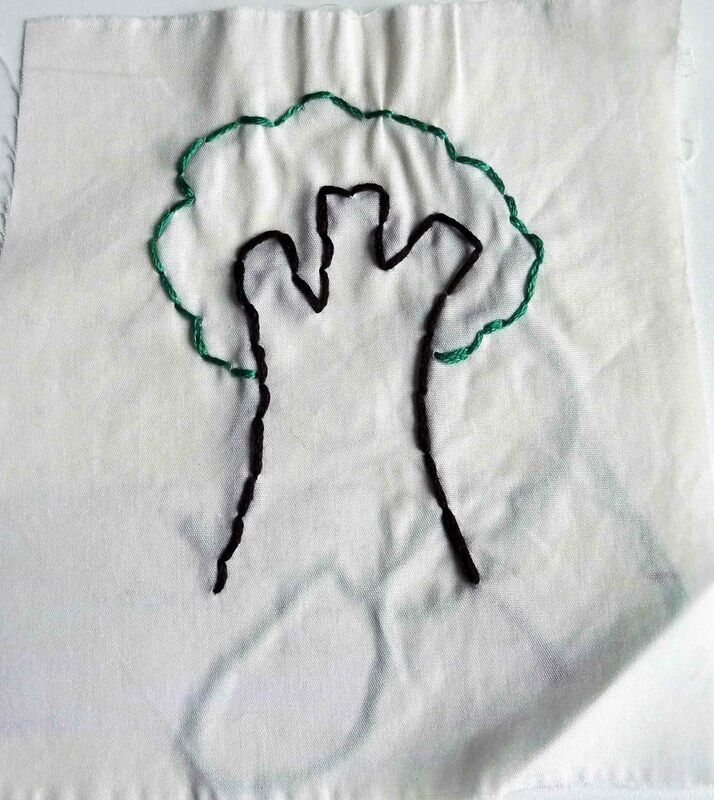 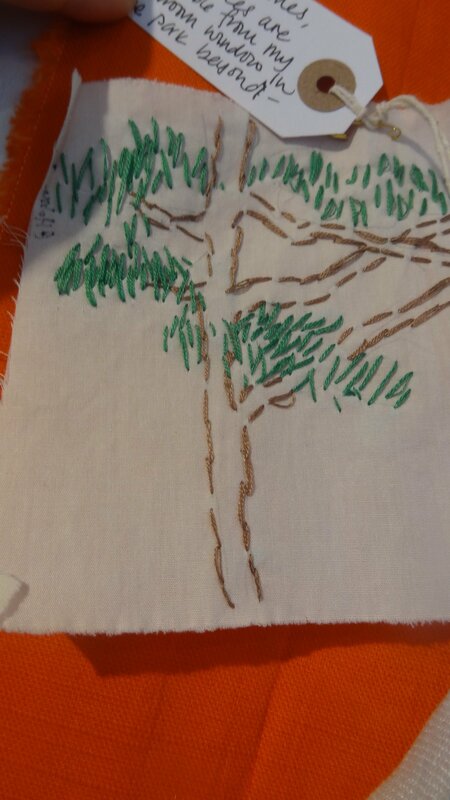 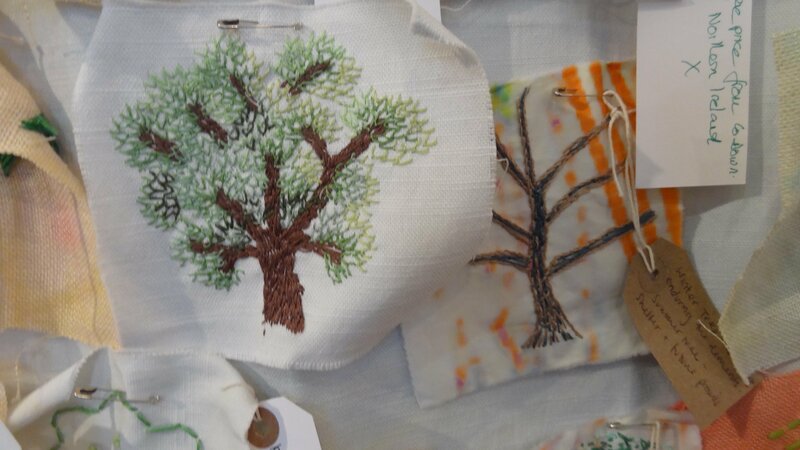 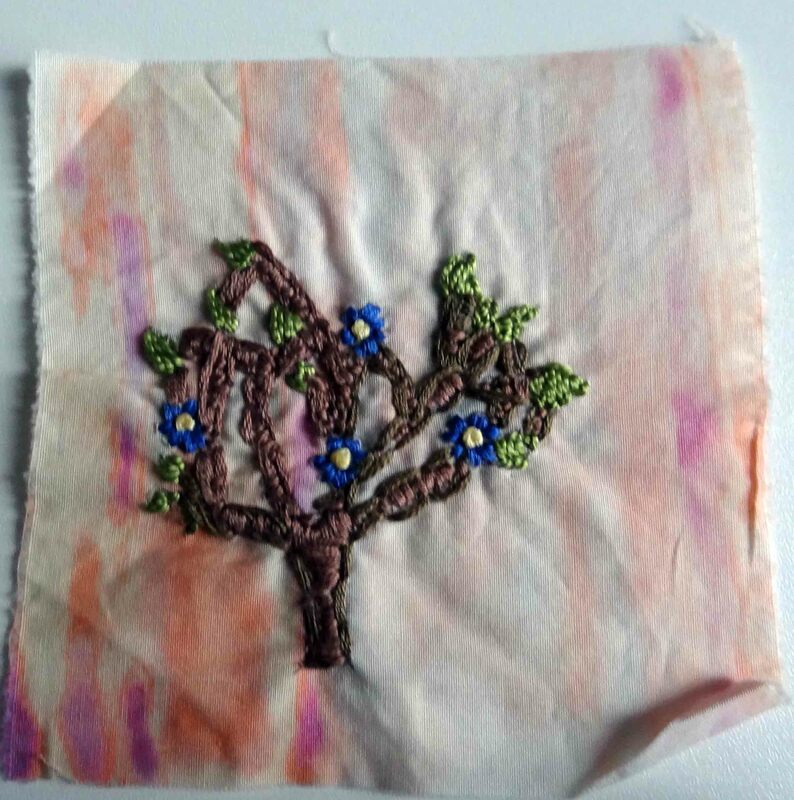 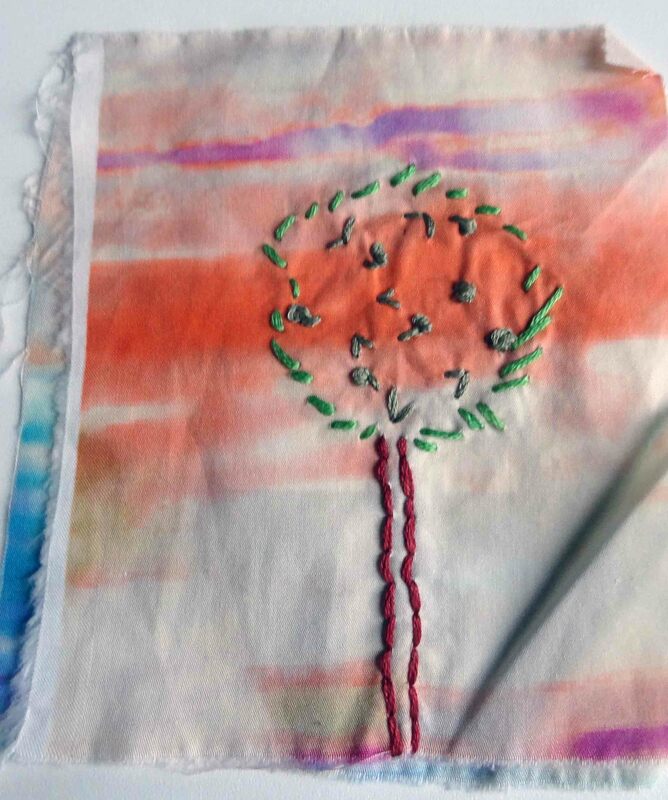 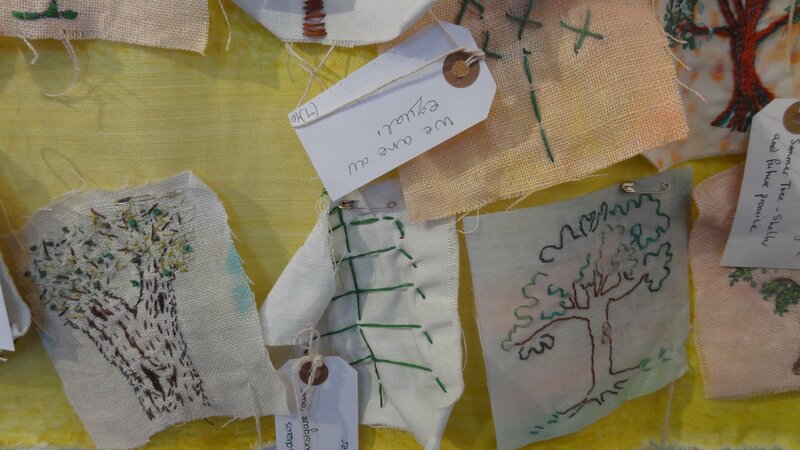 Alternatively, download our Stitch a Tree booklet and Further Information PDFs and start designing and stitching your tree on a piece of your own fabric (cotton only please) measuring 12 x 12 cm. 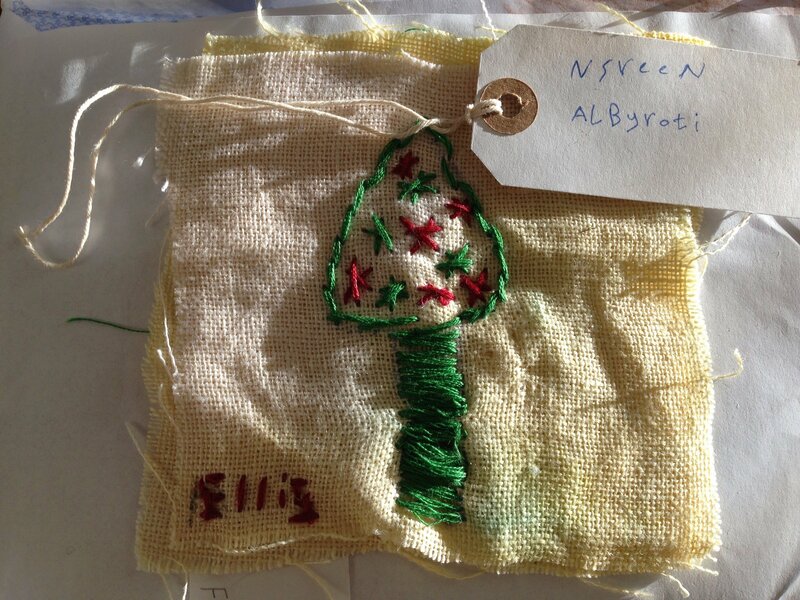 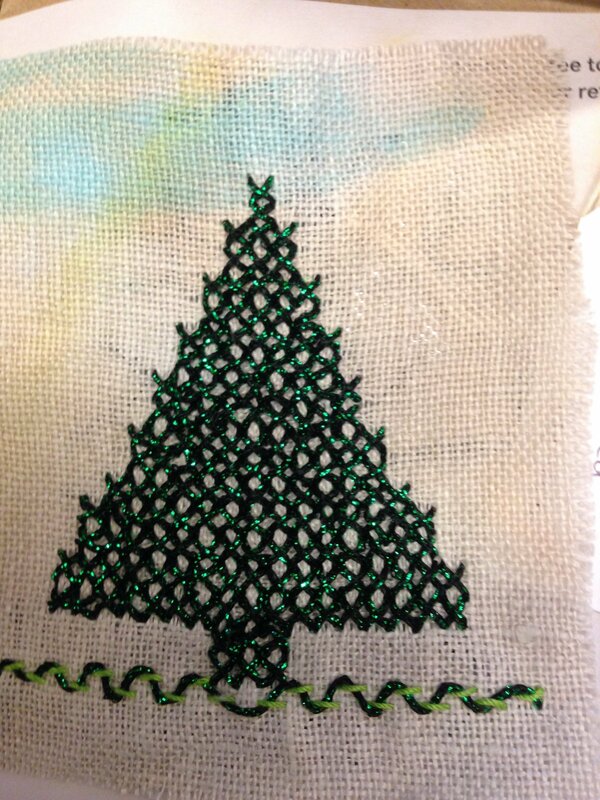 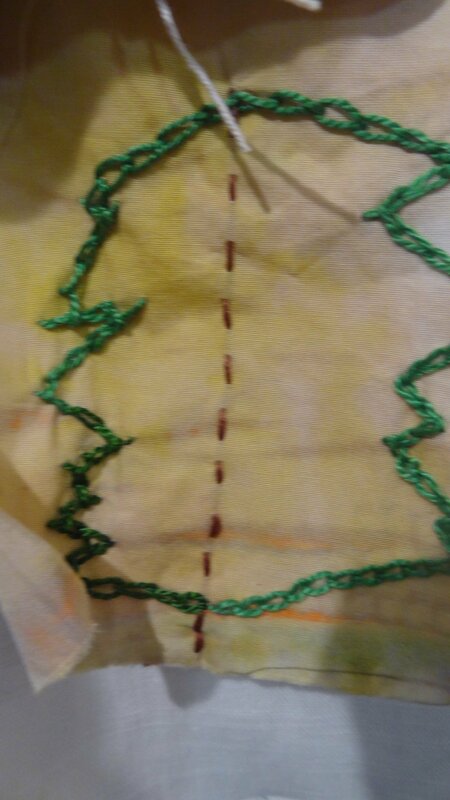 When you have finished stitching, please post your tree back to us in the envelope provided and don’t forget to include your name, email address and brief information about your tree. 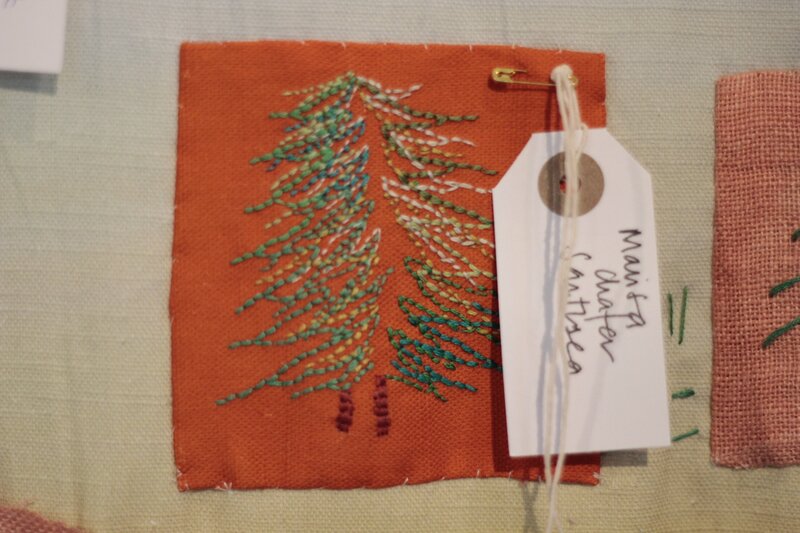 Unfortunately we cannot cover the cost of posting your tree back to us, but we have drop-off points available if you want to deliver your tree by hand (see Further Information PDF for details). 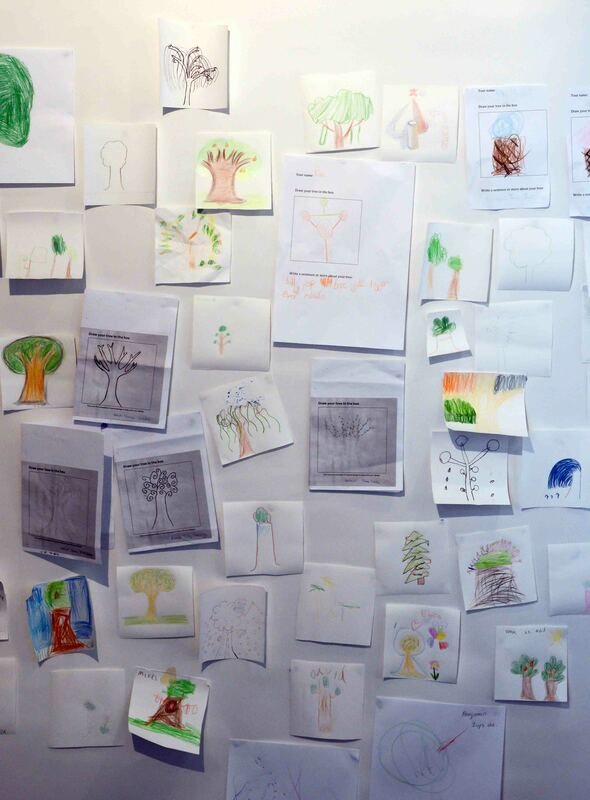 We shall continue to receive trees until end of April 2018. 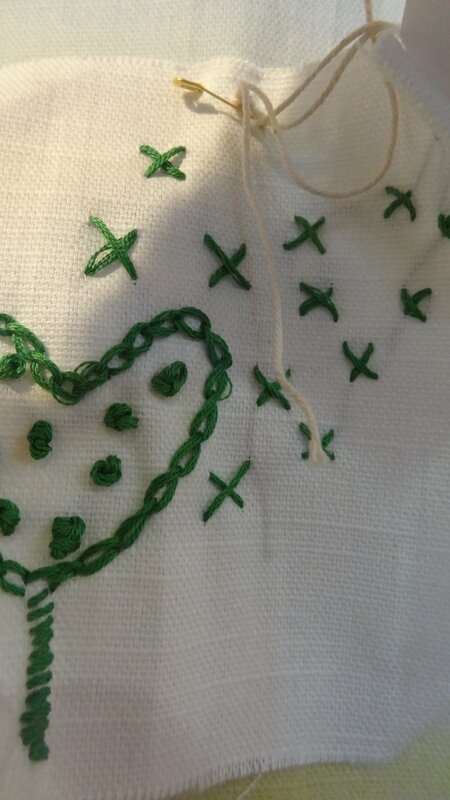 But check the site for updates in case we review this date. 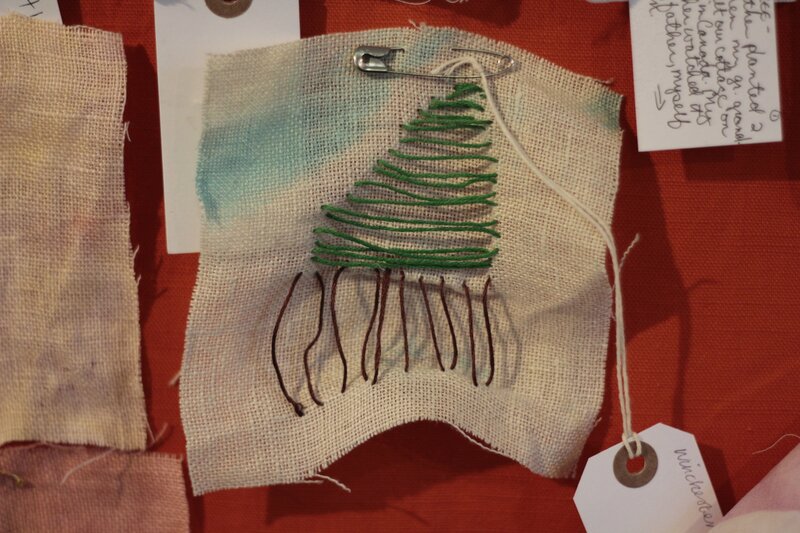 If you can’t make this date don’t worry we will still include your tree. 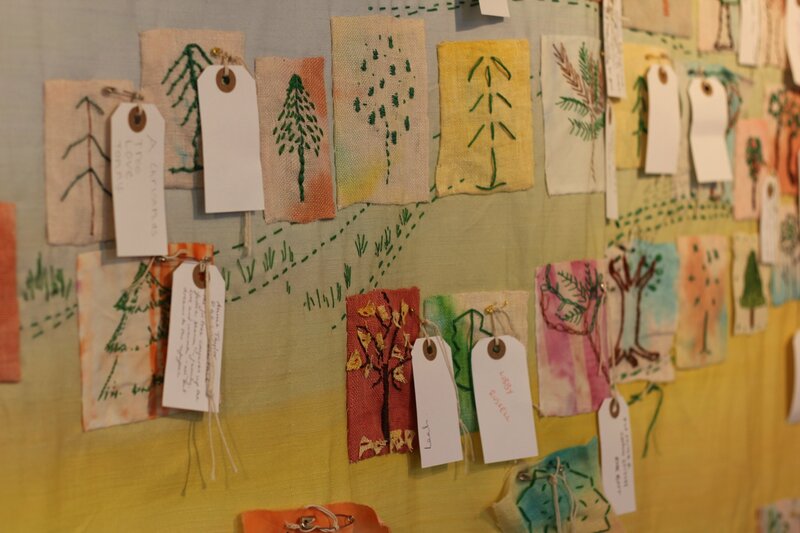 Each contribution to Forest will be acknowledged and documented on a map. 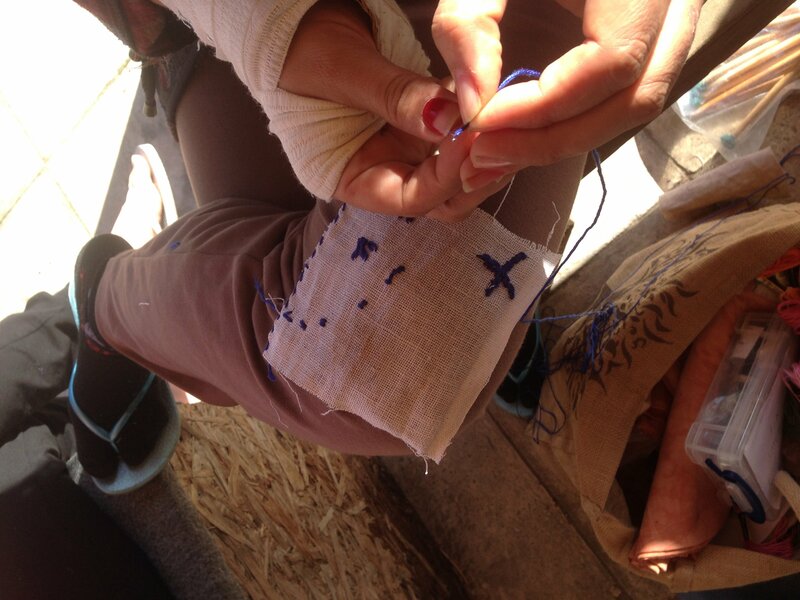 Please check this website for updates and activities during the course of the project. 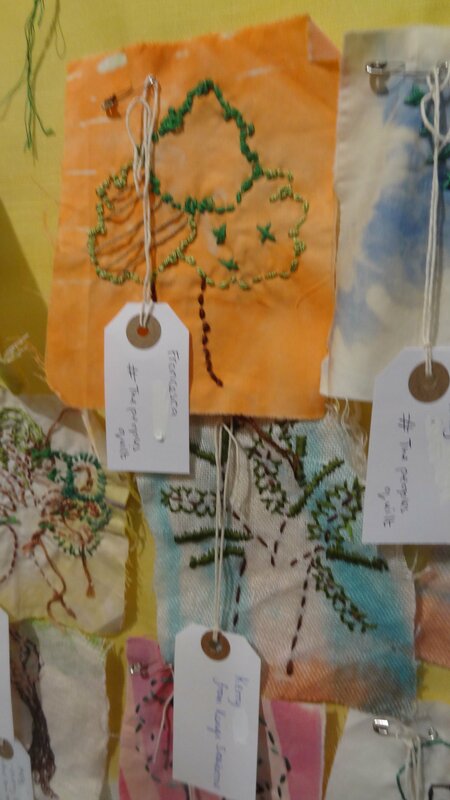 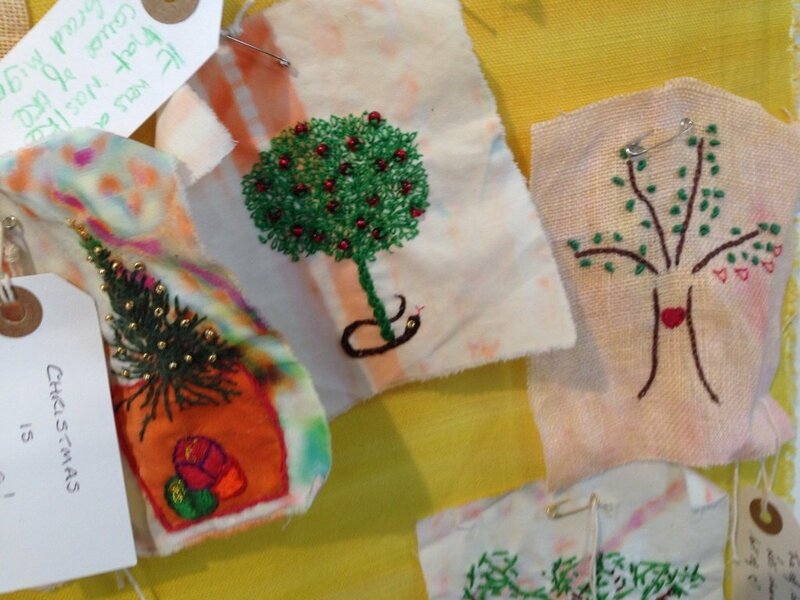 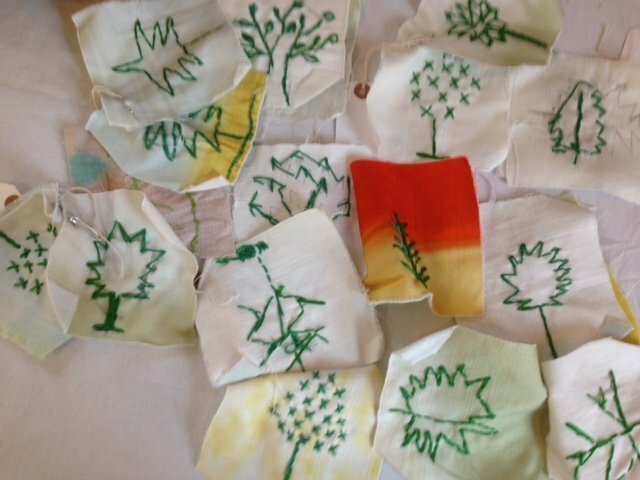 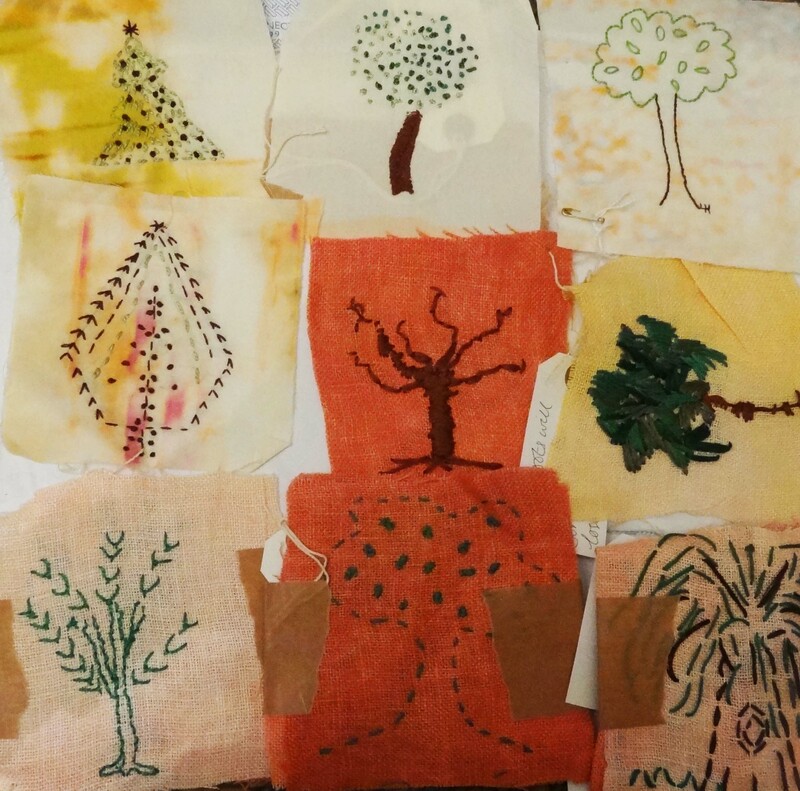 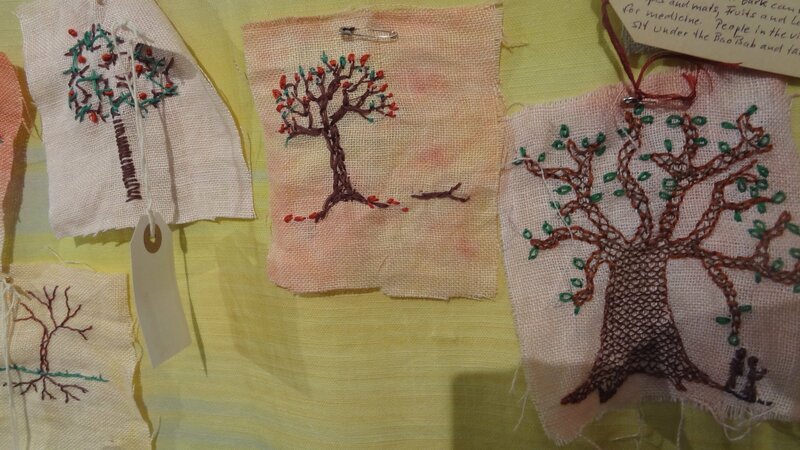 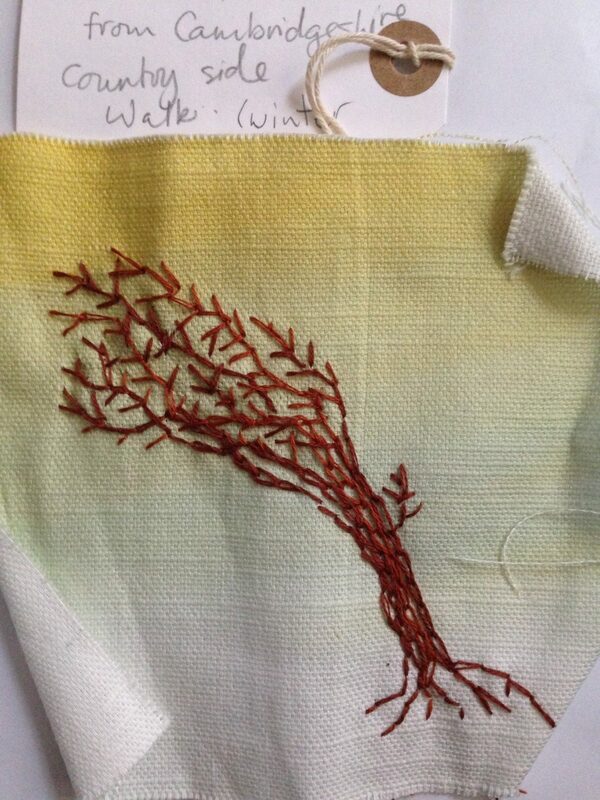 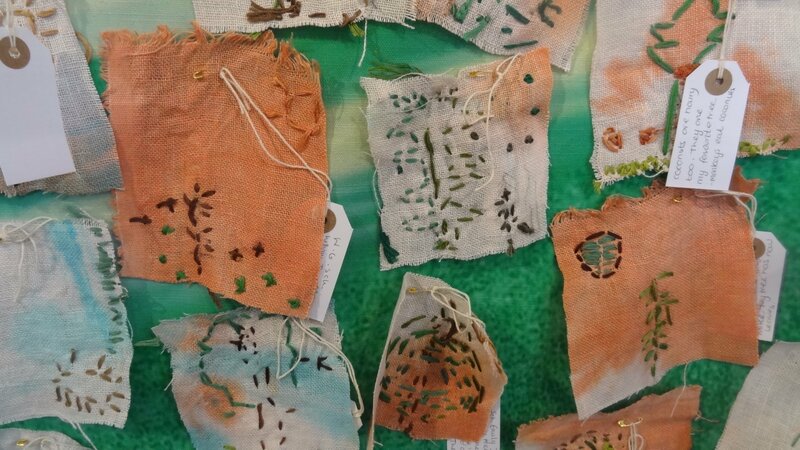 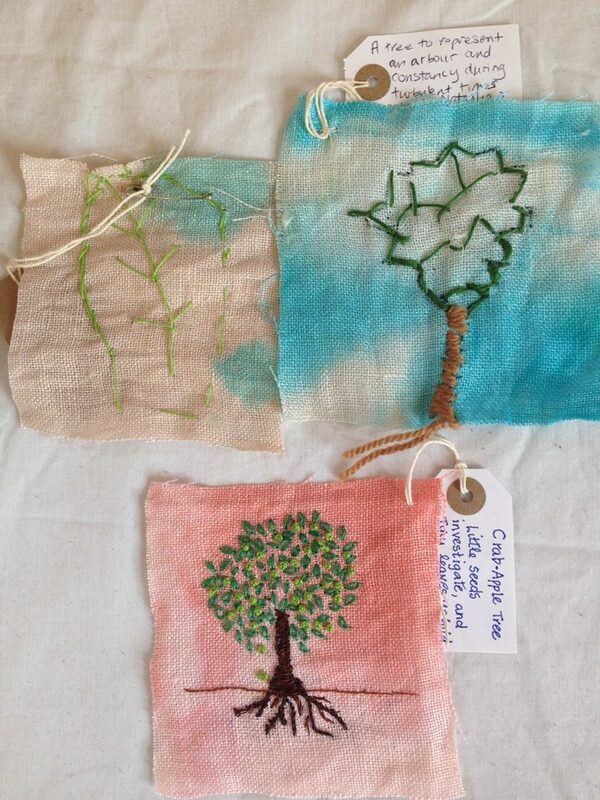 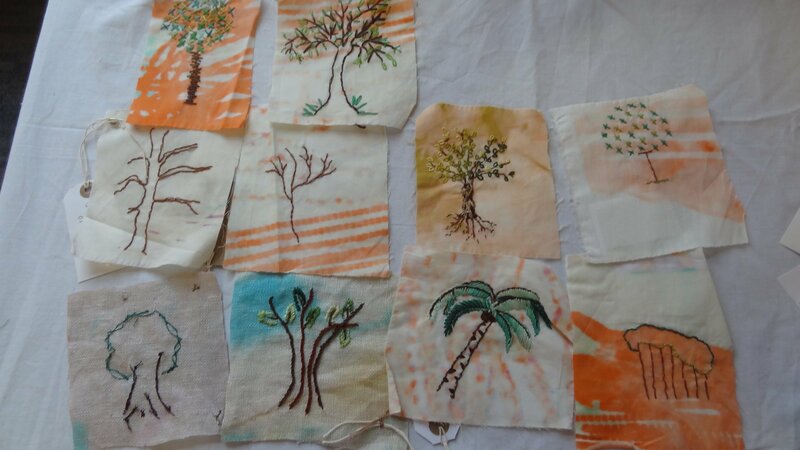 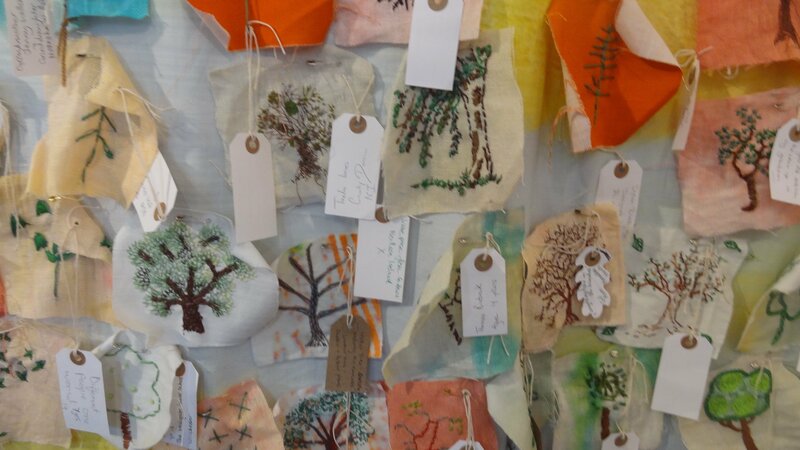 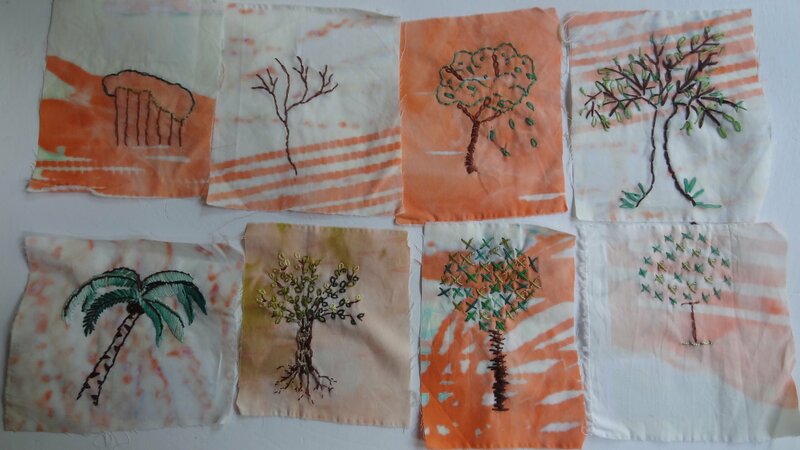 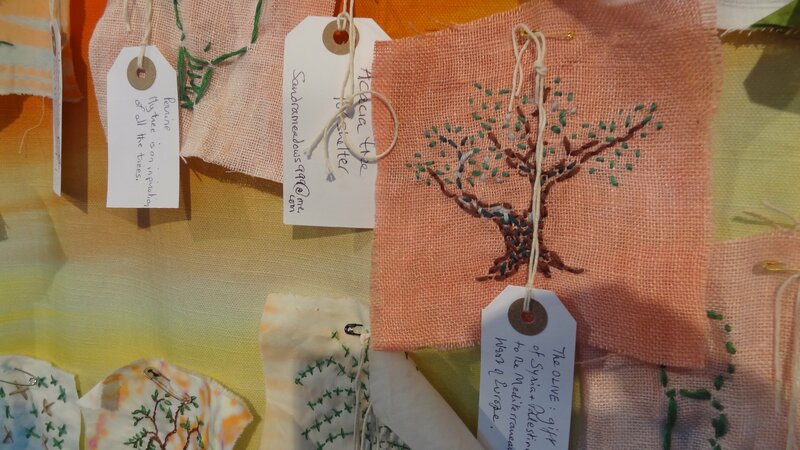 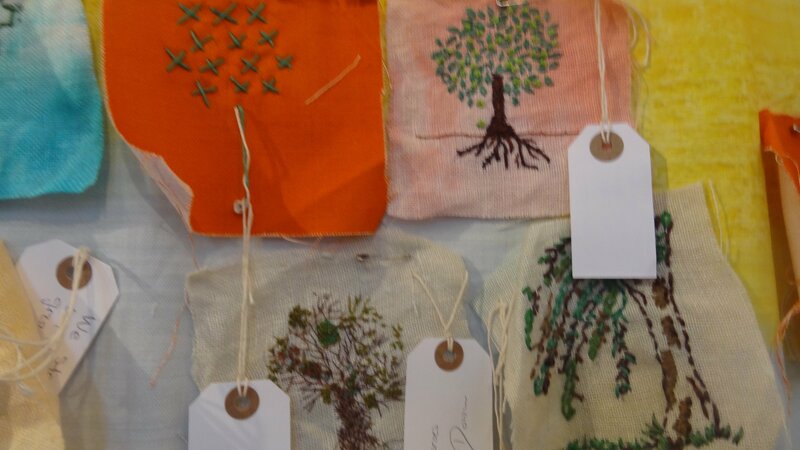 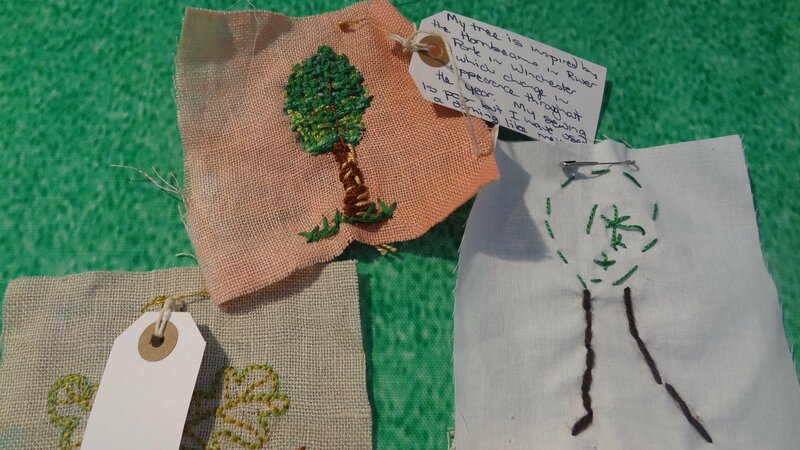 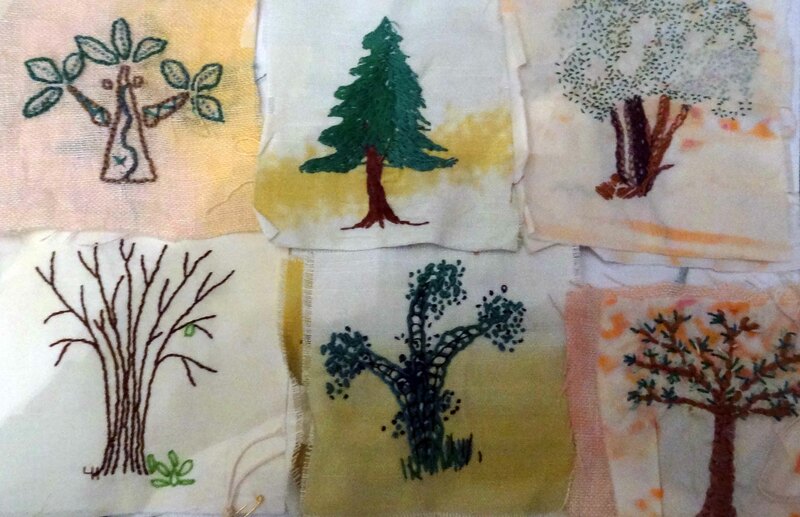 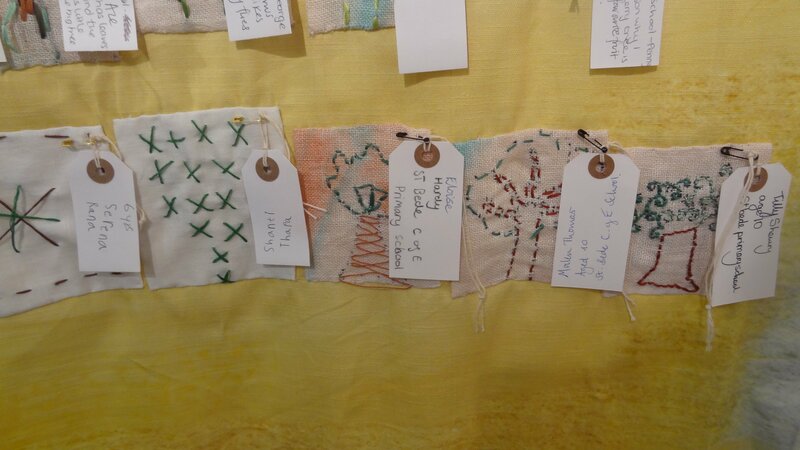 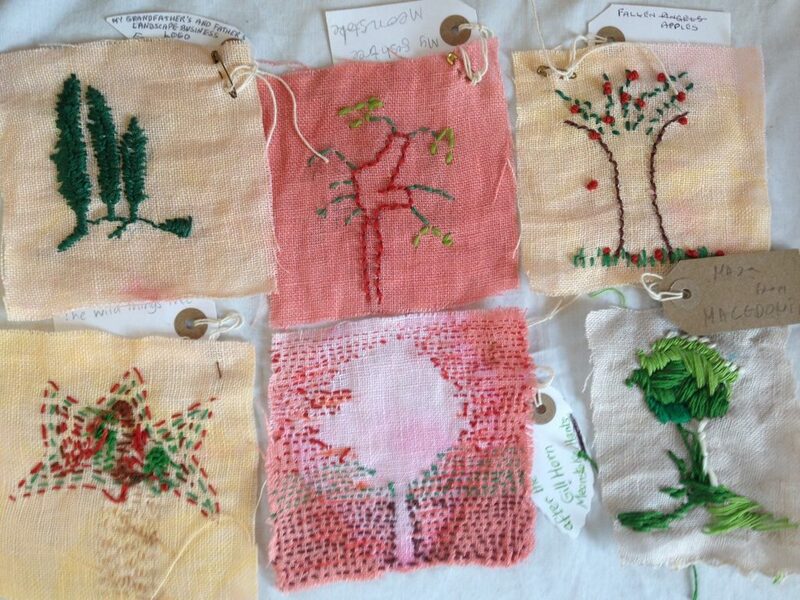 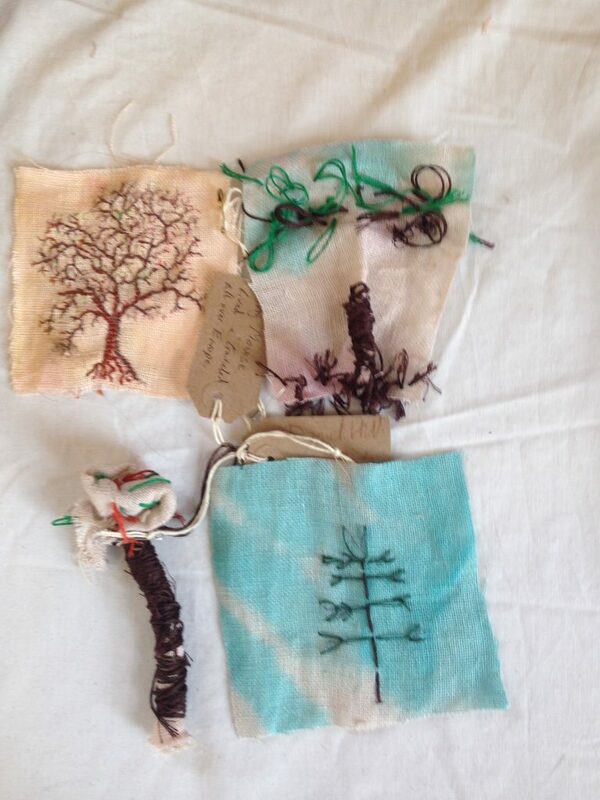 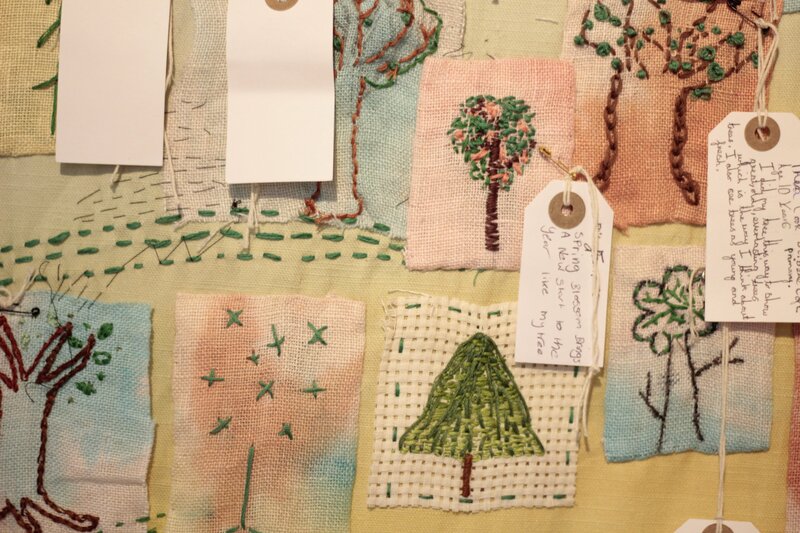 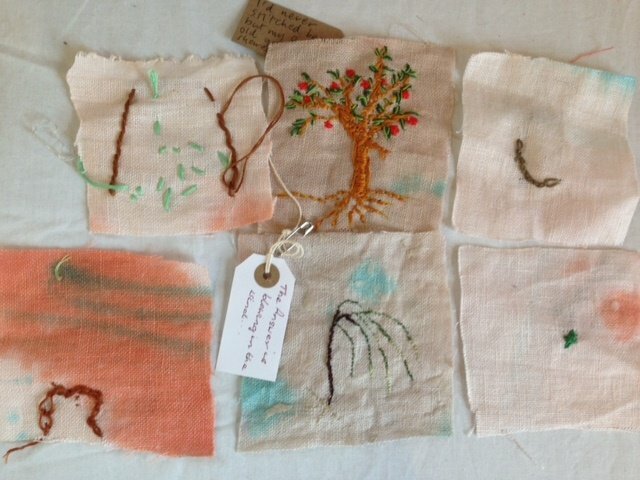 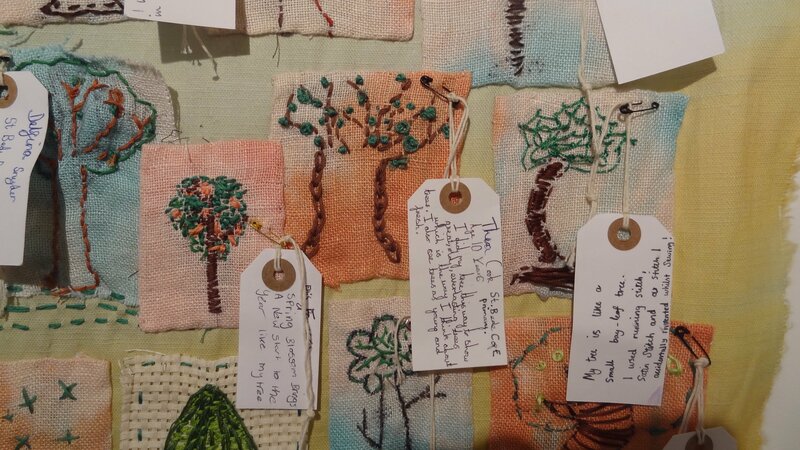 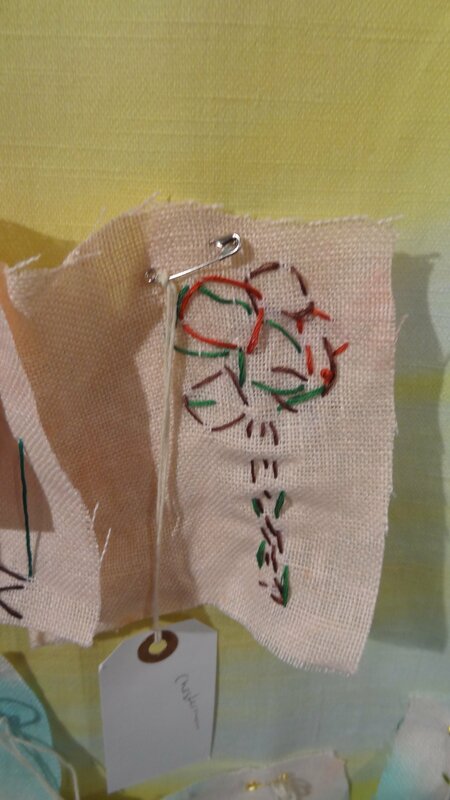 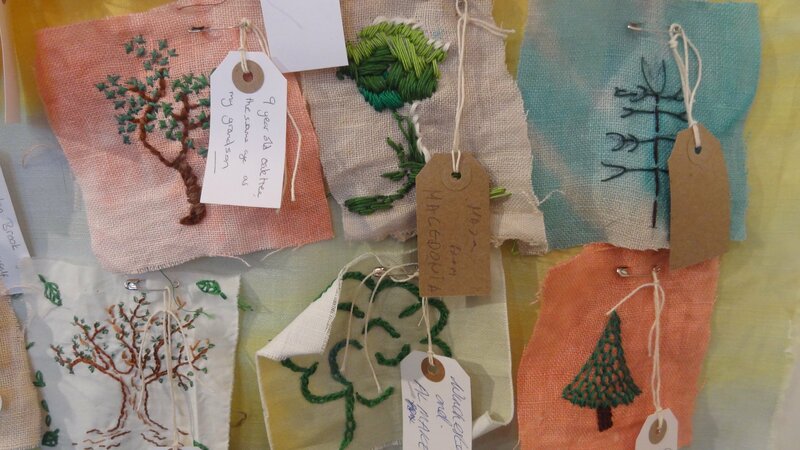 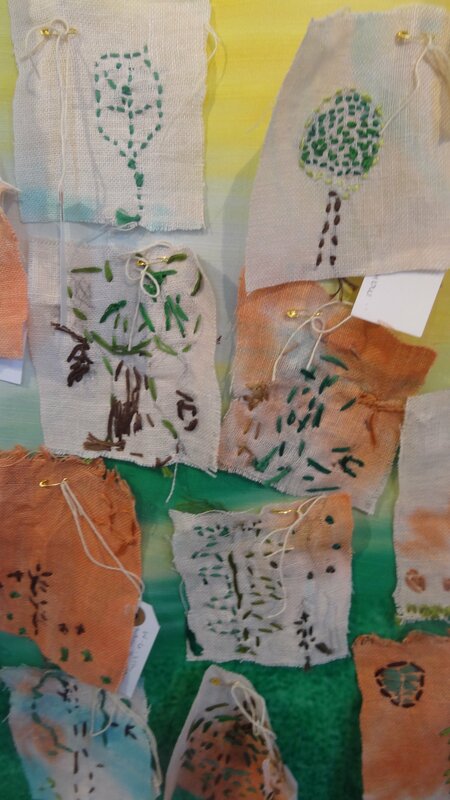 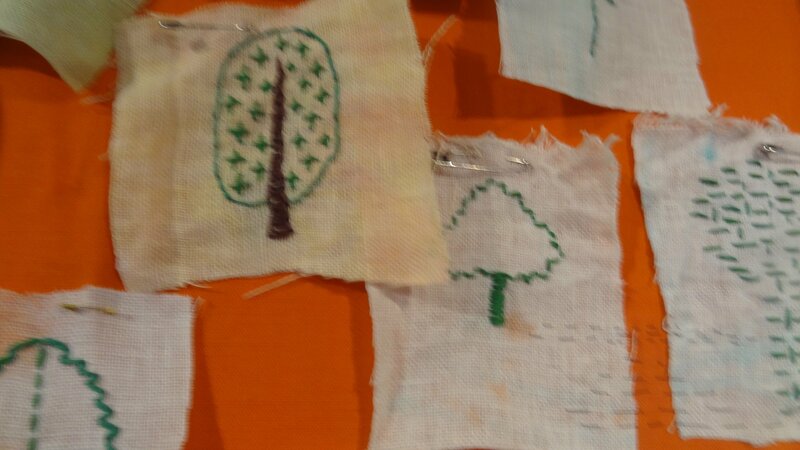 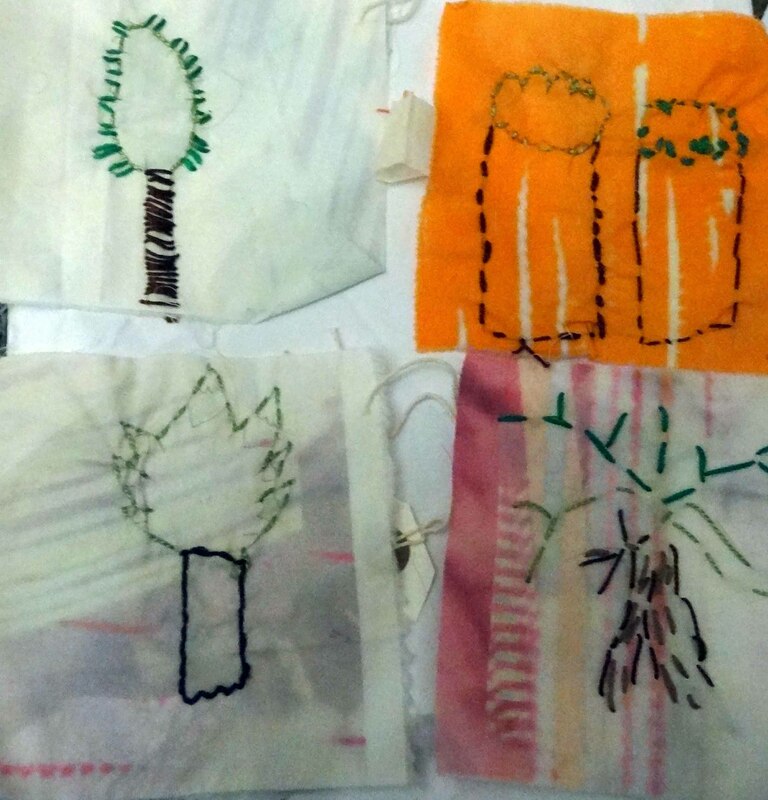 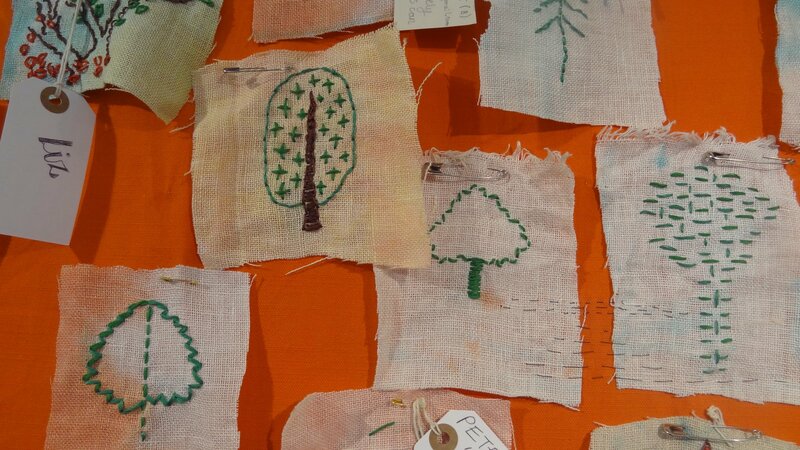 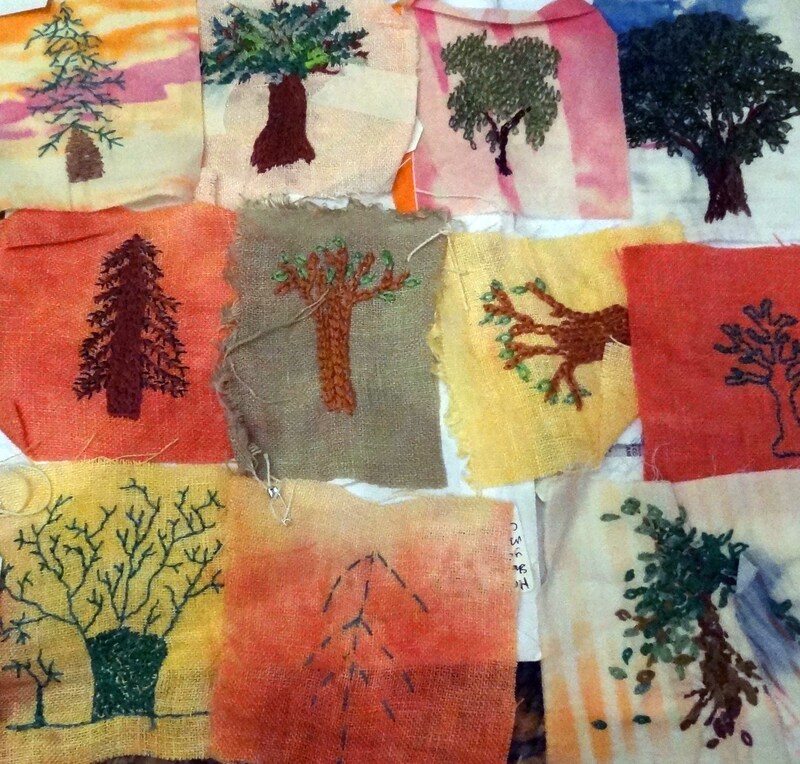 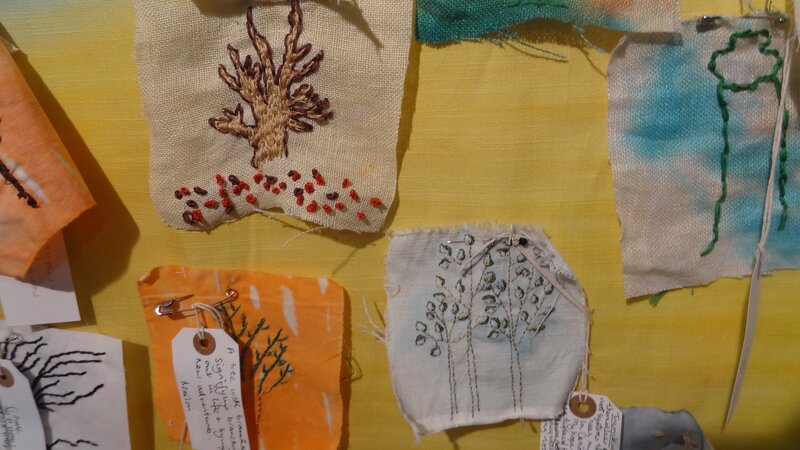 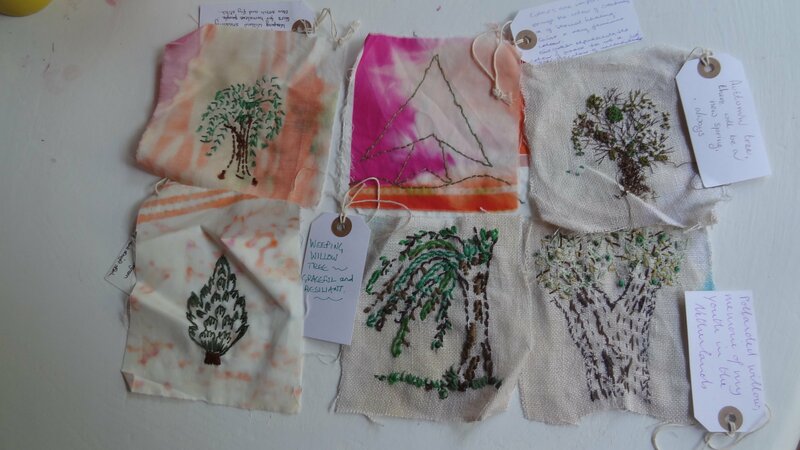 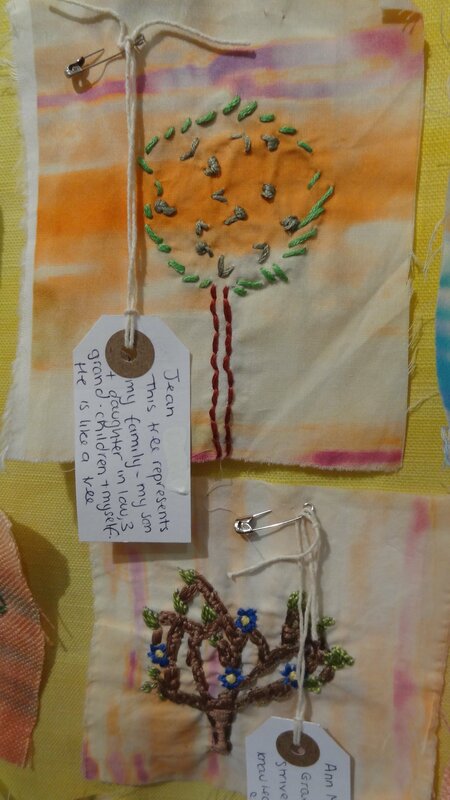 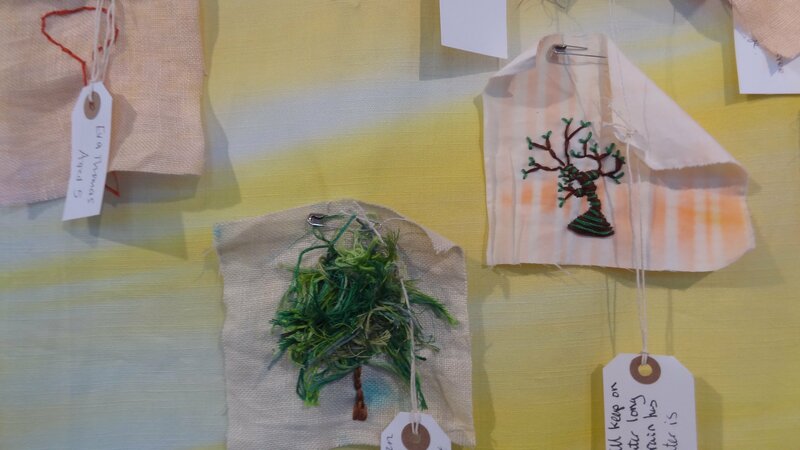 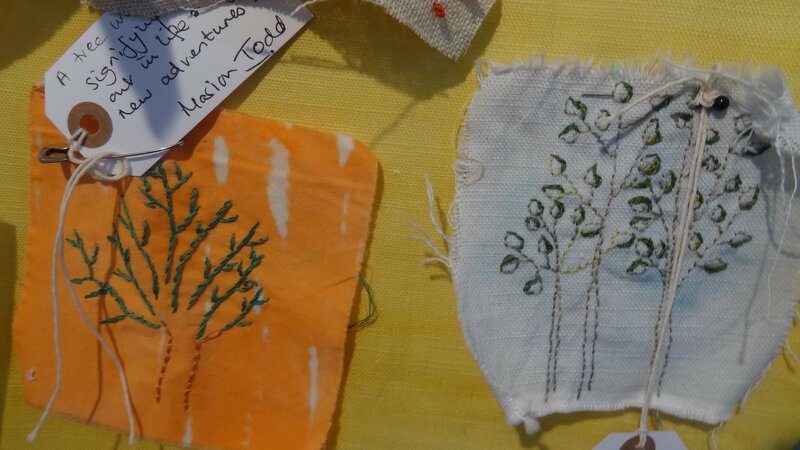 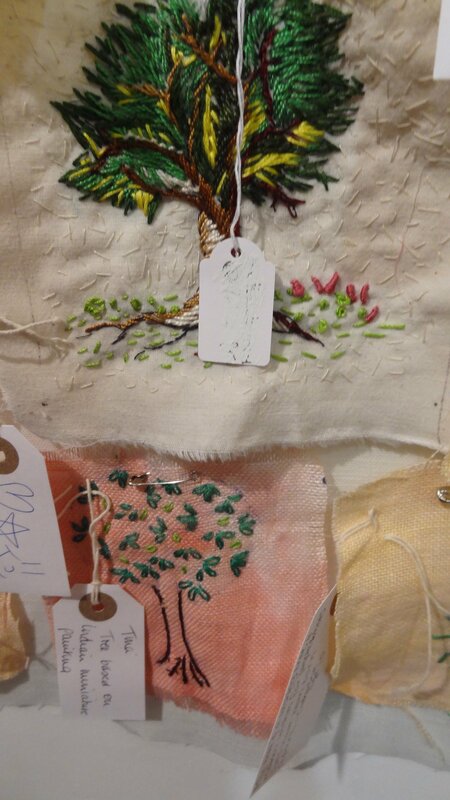 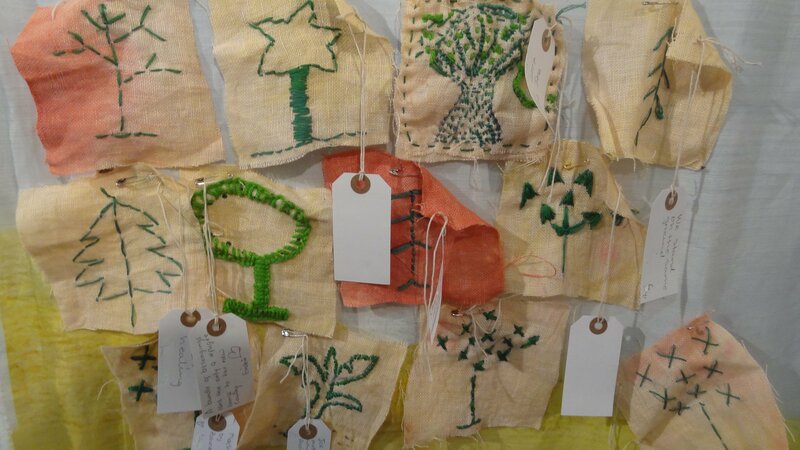 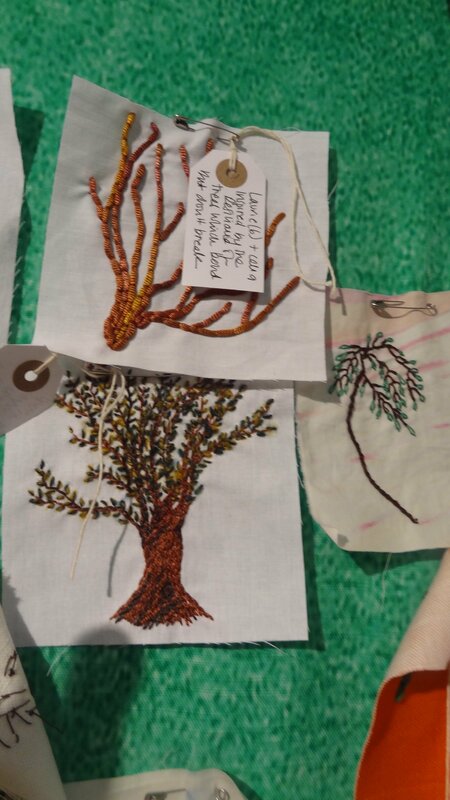 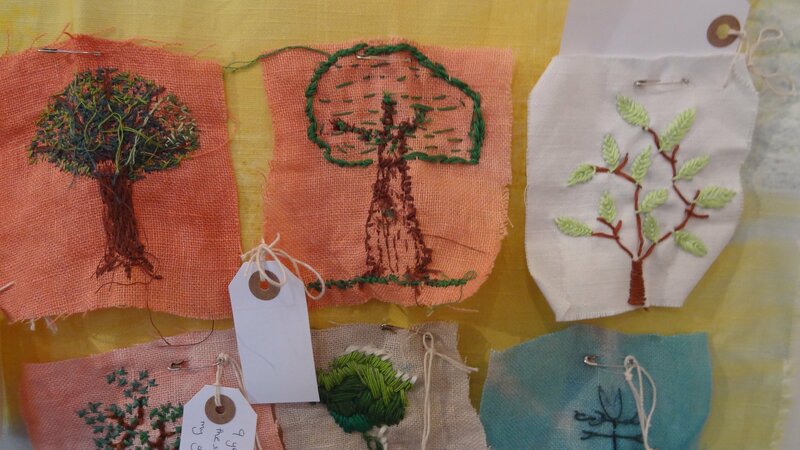 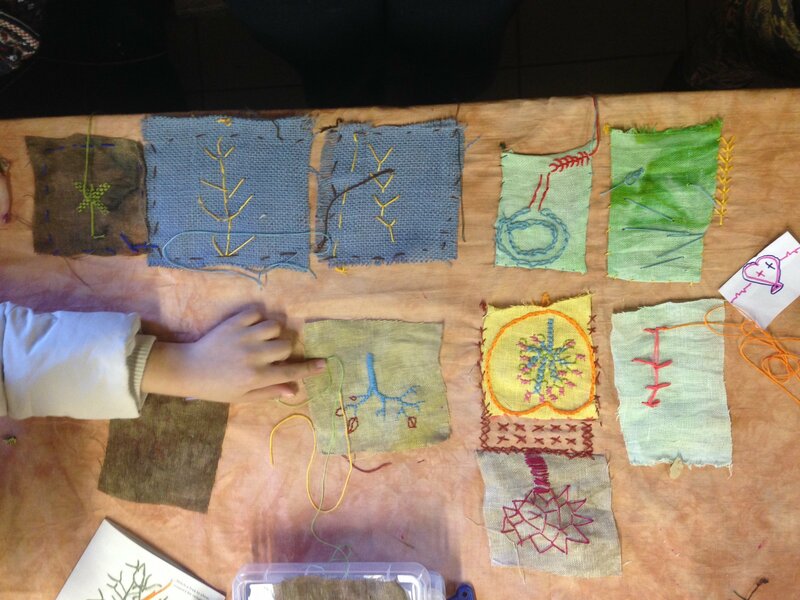 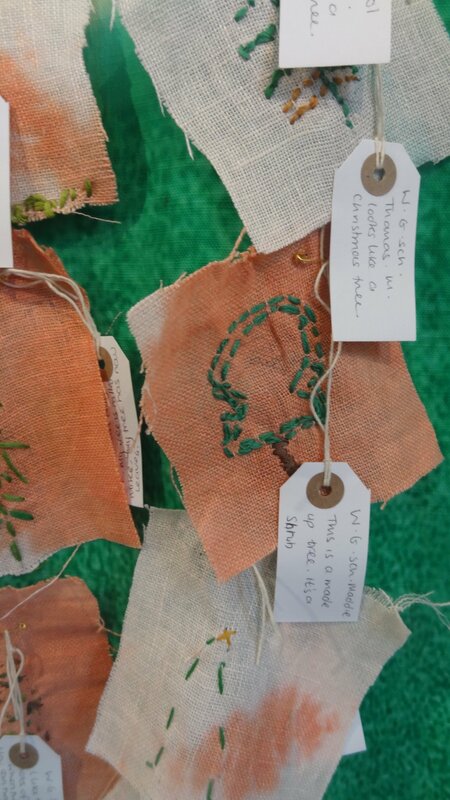 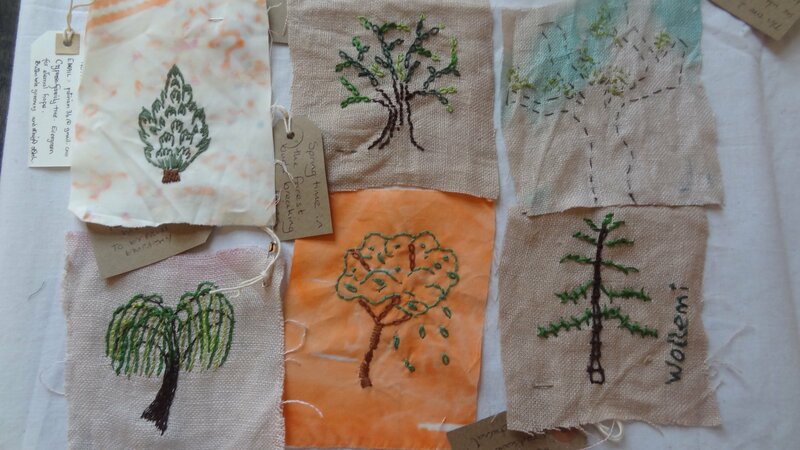 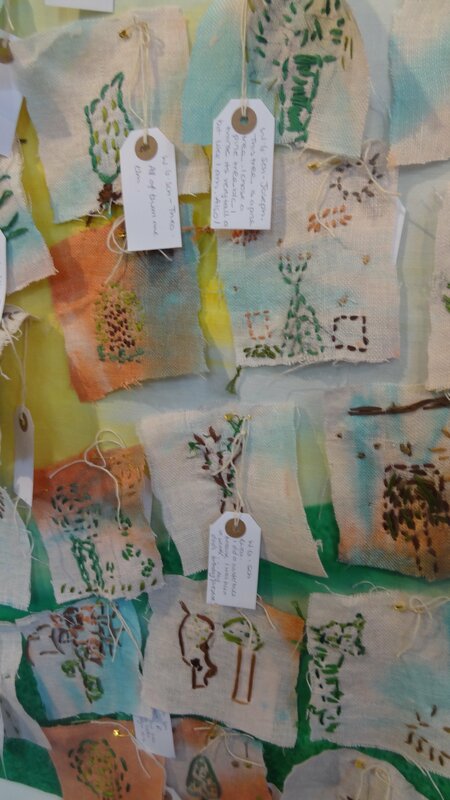 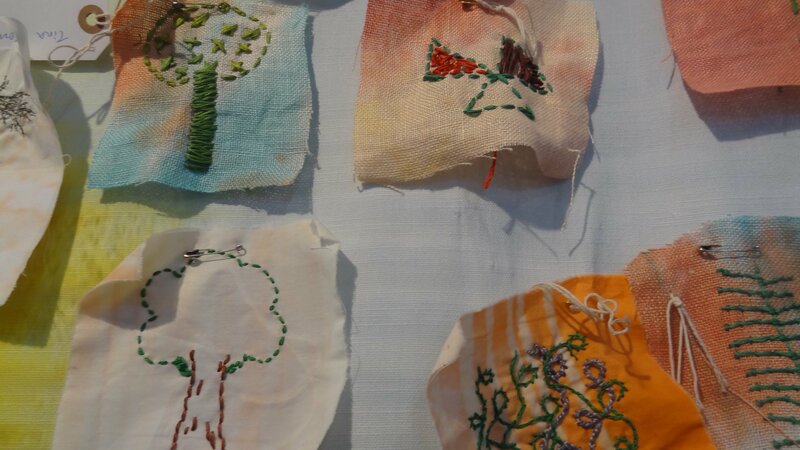 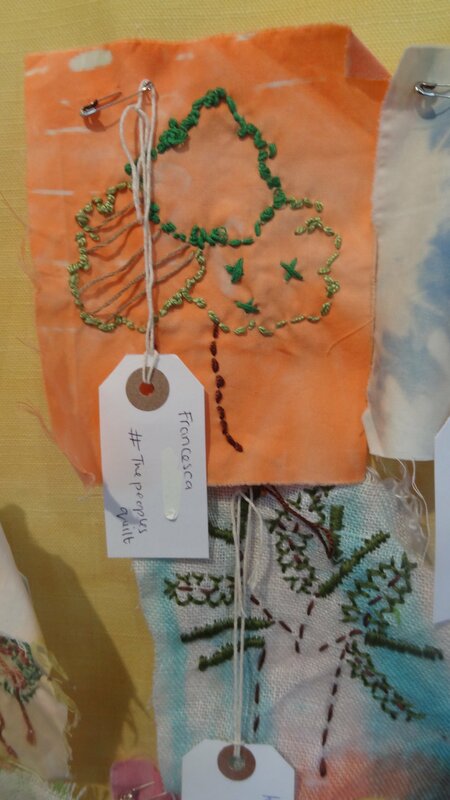 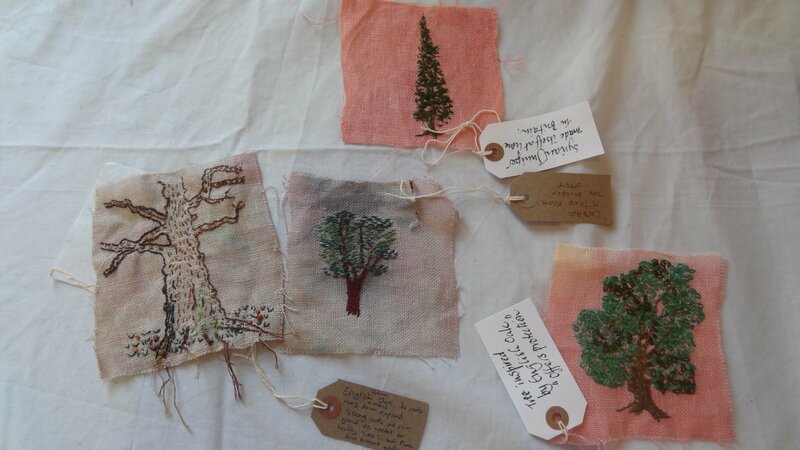 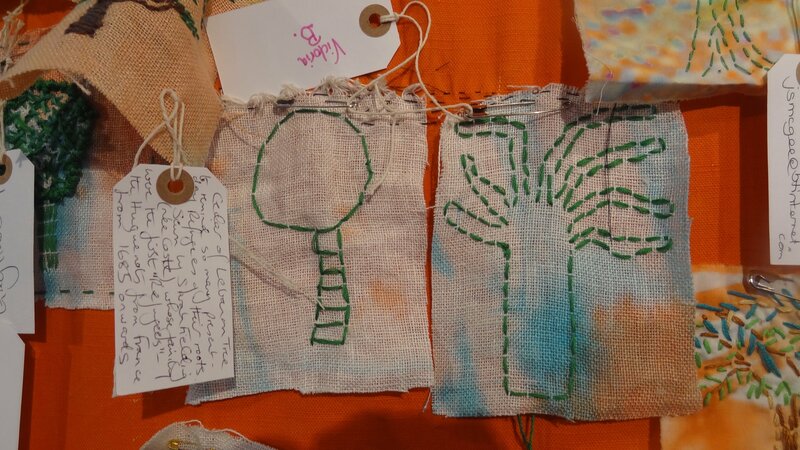 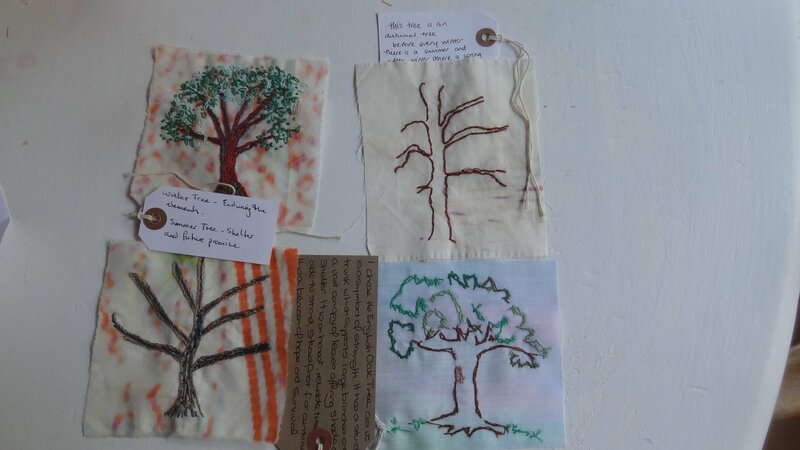 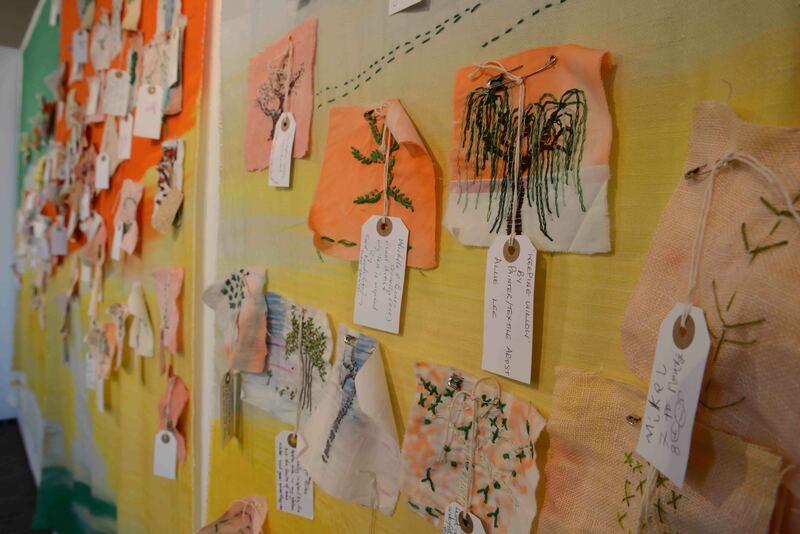 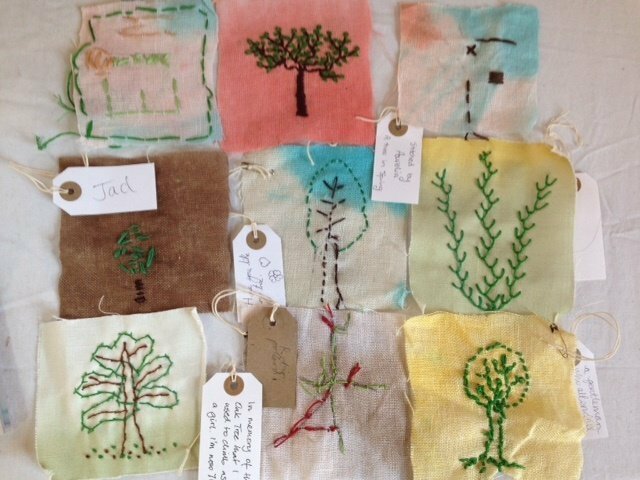 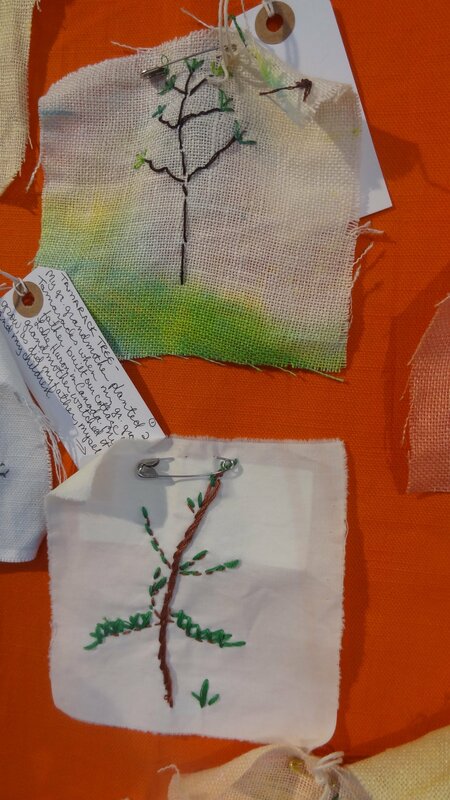 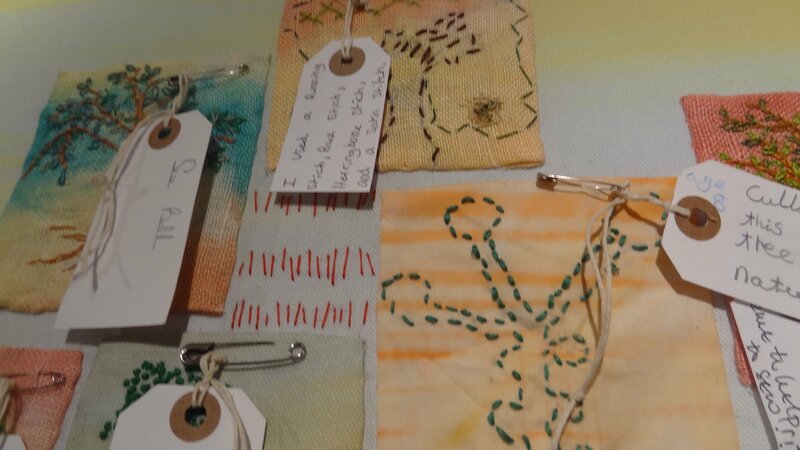 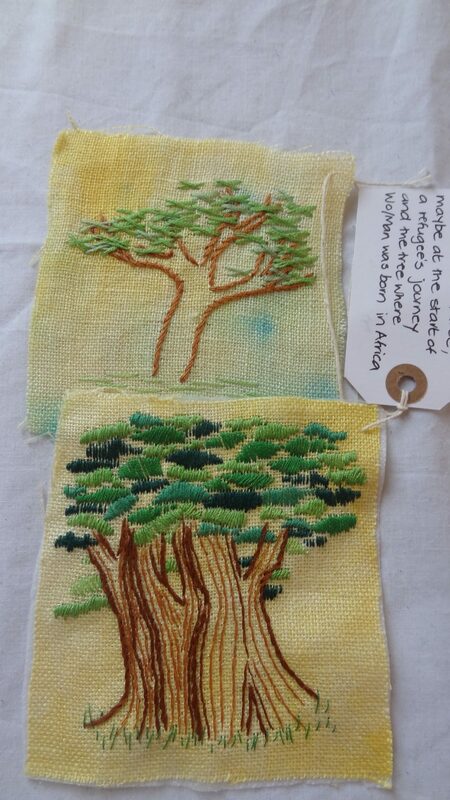 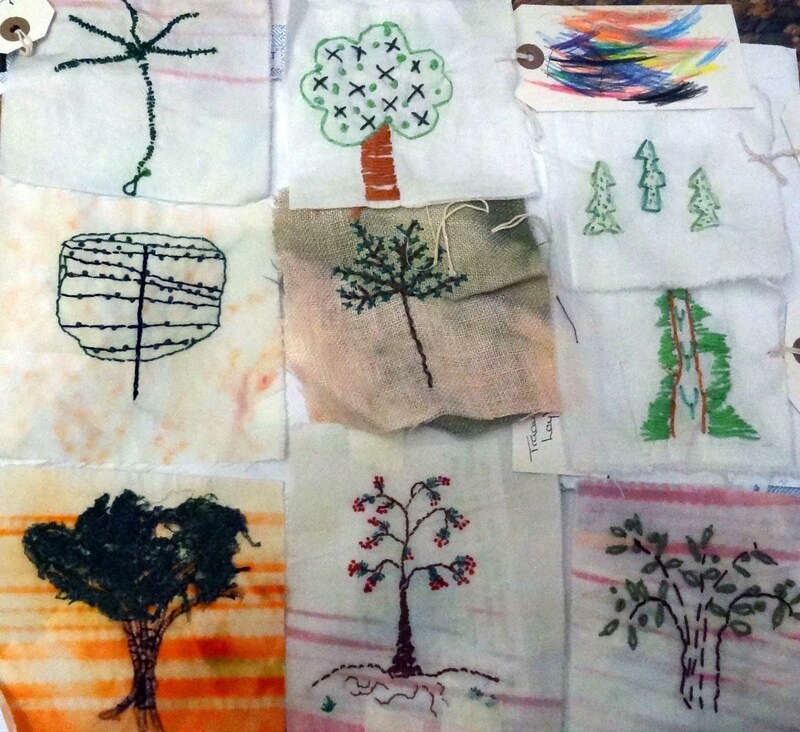 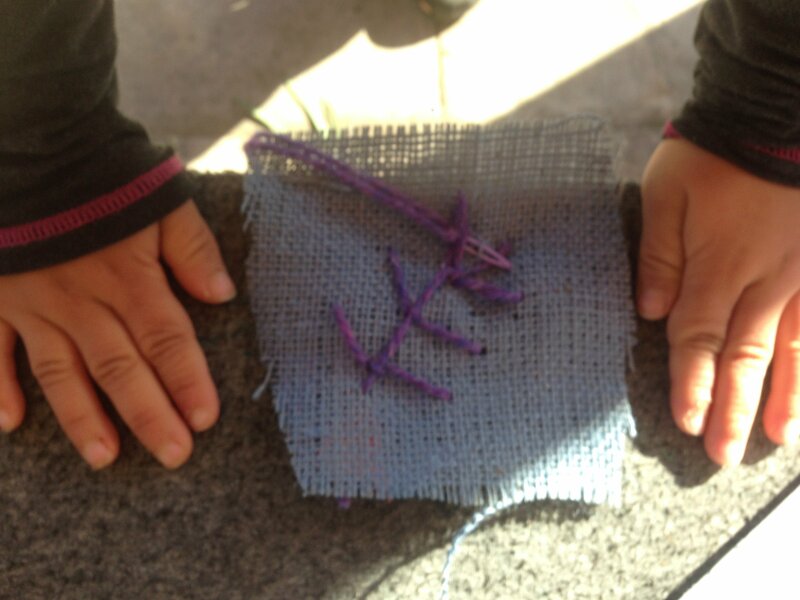 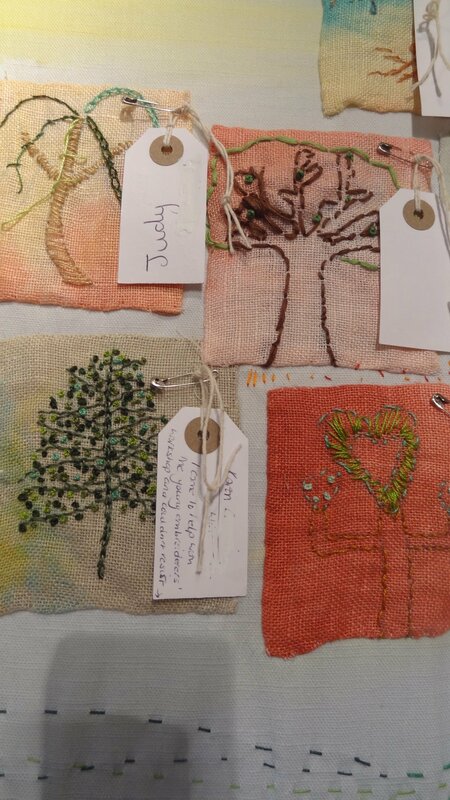 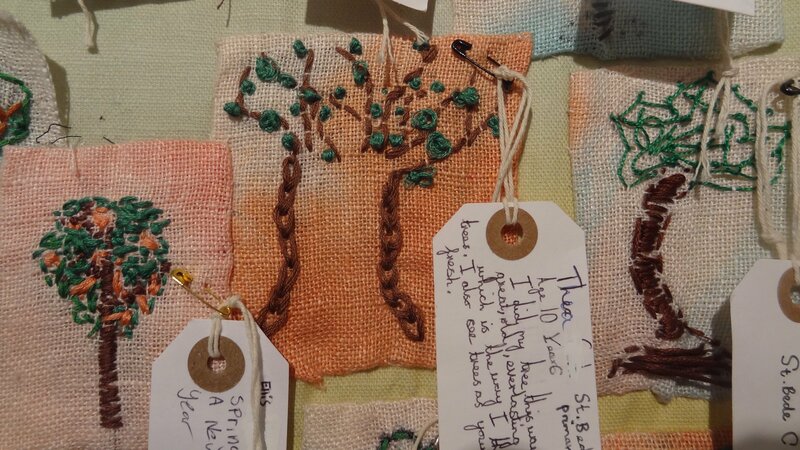 We thank you for contributing to this project and we look forward to seeing your stitched tree as part of Forest at the Whitworth in Autumn 2018! 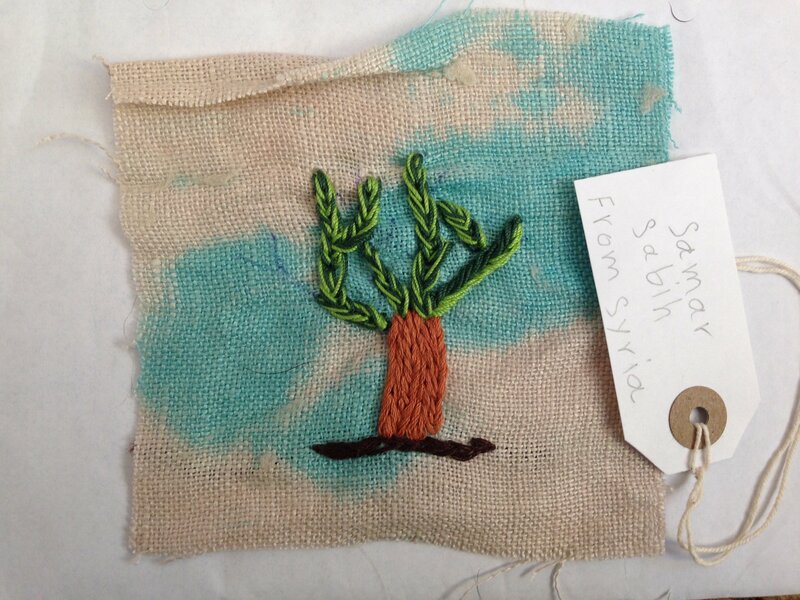 We hope to raise funds at the end of the project – further details to follow. 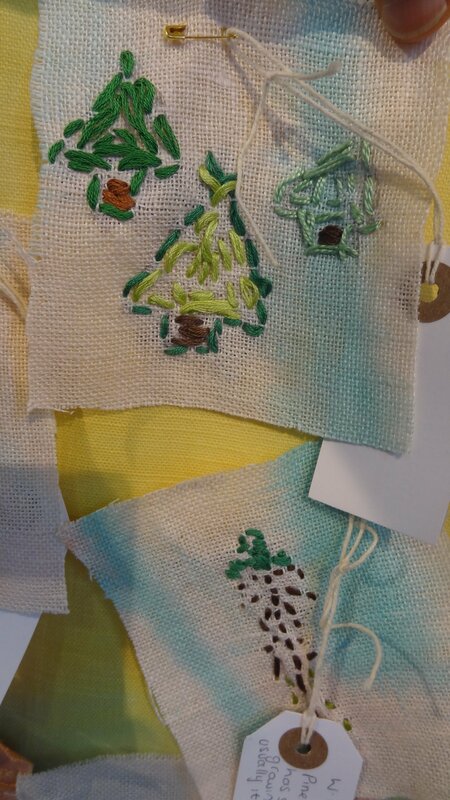 ادرز على ماكينة الخياطة شجرة لتعبر عن دعمك لقضية اللاجئين . 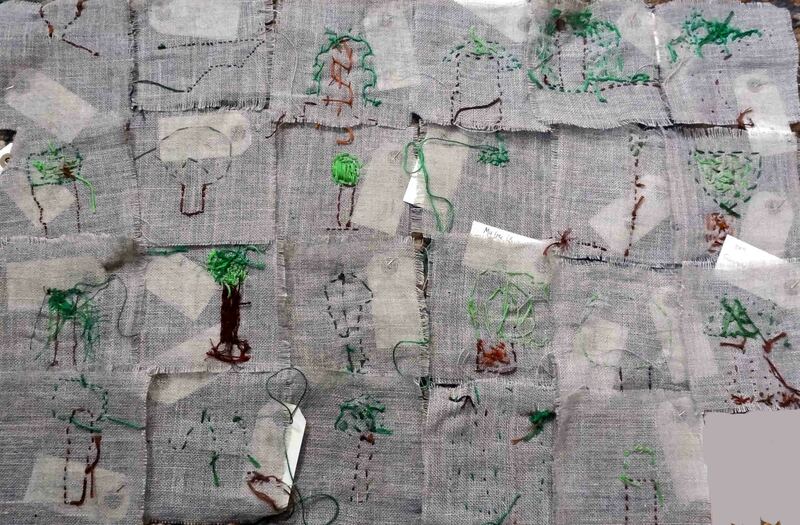 يهدف هذا المشروع إلى خلق صلة وصل بين الجماعات والأفراد في أنحاء المملكة المتحدة لجمع تبرعات للنازحين من كل أنحاء العالم لدعمهم والتضامن معهم. 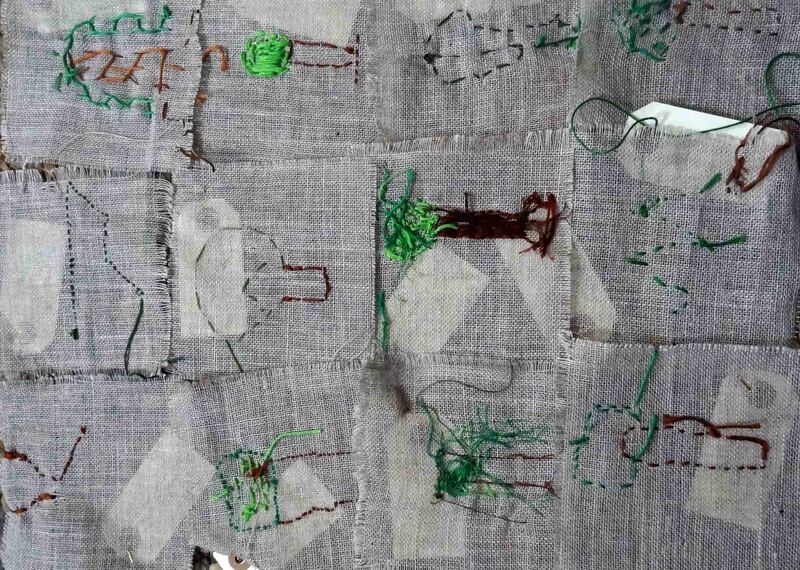 تتم دعوة المشاركين إلى درز شجرة واضافتها الى لوحة فنية كبيرة من النسيج بعنوان الغابة للفنانة التشكيلية أليس كيتل . 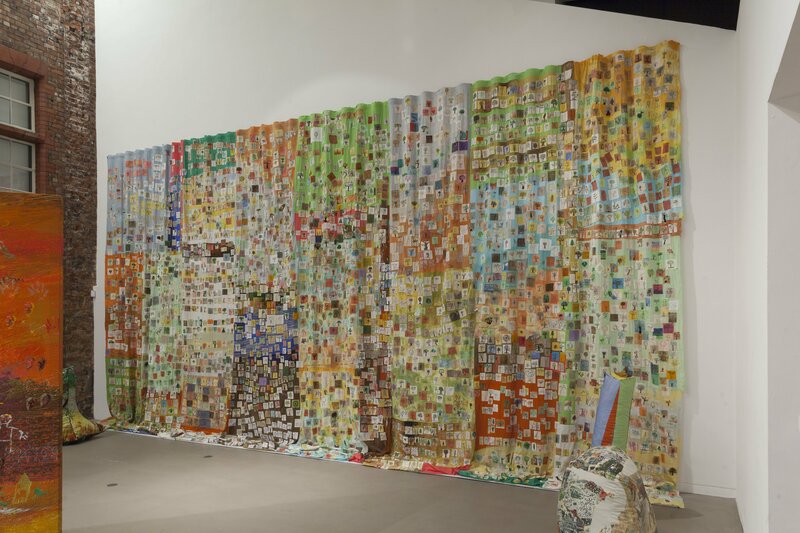 سيتم عرض الغابة في معرض ويتورث الفني في مدينة مانشستر في أيلول 2018 وأثناء حياكتها وقبل إكمالها في معرض سيتي سبيس في مركز الاستكشاف في وينشستر بتاريخ 15 اكتوبر الى 26 نوفمبر 2017. 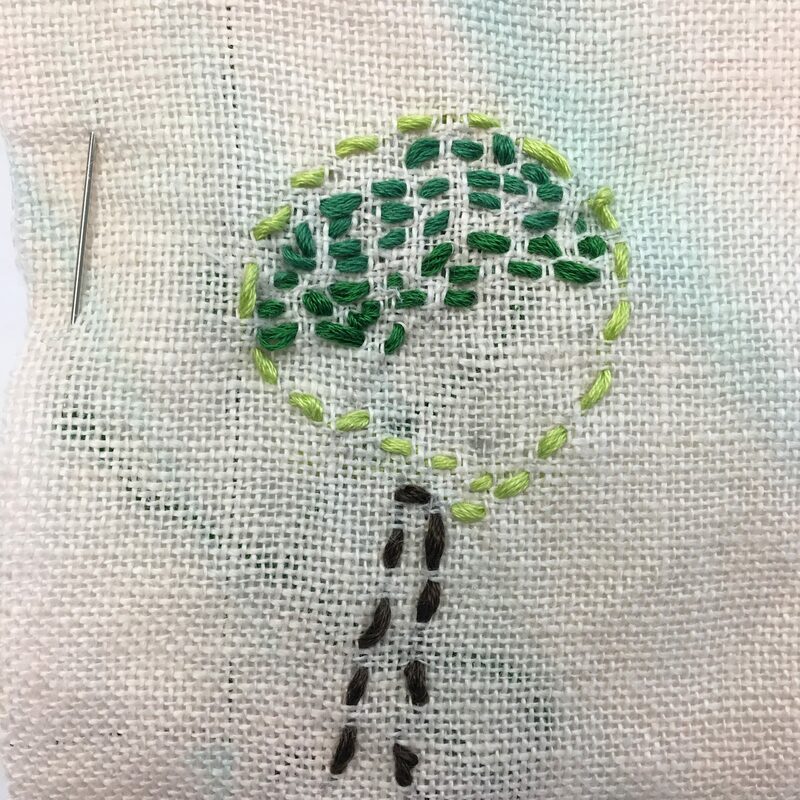 وكذلك بالإمكان تحميل ملف “كُتيب ادرز شجرة على ماكنة الخياطة” وملف “معلومات اضافية” من موقعنا. 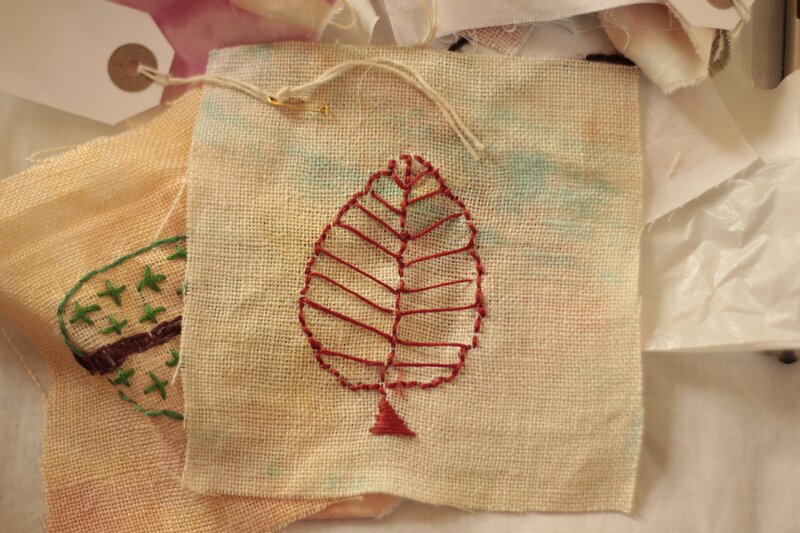 بإمكانكم البدء بالتصميم ودرز شجرتكم على أية قطعة من القماش (يرجى استخدام الأقمشة القطنية فقط) بقياس 12 x 12 . 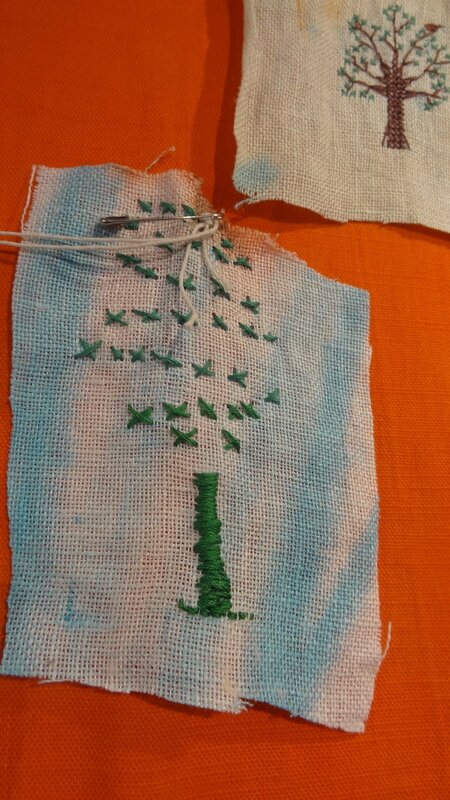 عند الانتهاء من عملية الدرز الرجاء إرسال الشجرة بالبريد في الظرف المرفق. 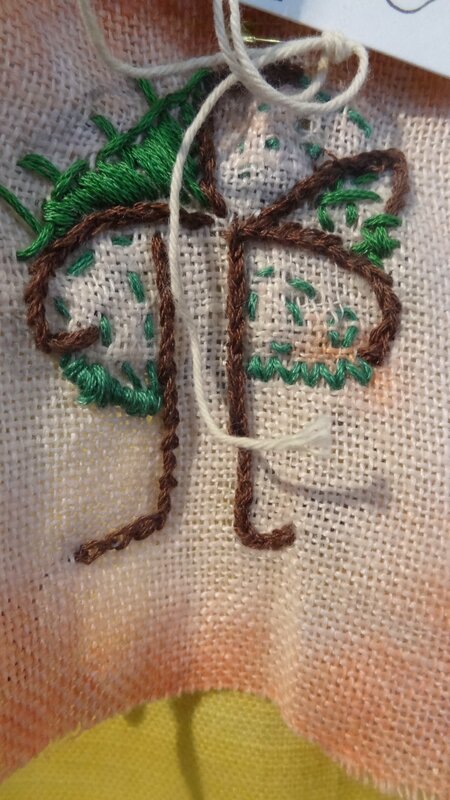 الرجاء كتابة الاسم المرغوب والعنوان الالكتروني (ايميل) وملخص عن شجرتكم. 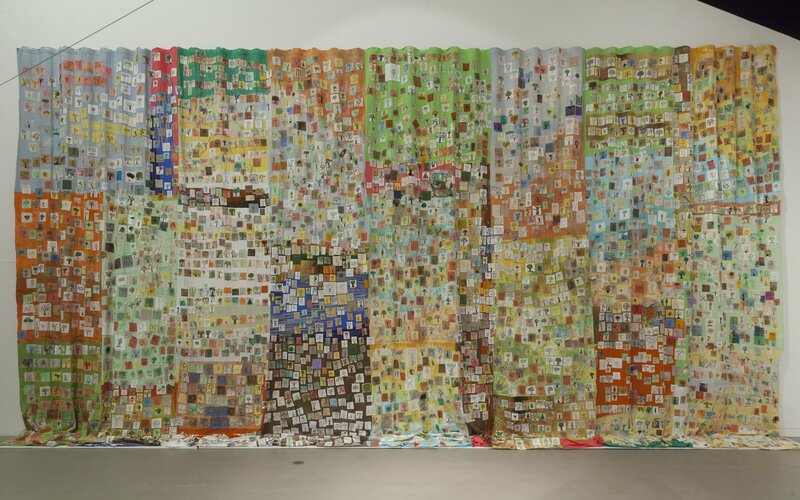 للأسف، ليس لدينا القدرة على التكفل بسعر الطوابع ولكن لدينا أمكنة بامكانكم ايصال الظرف اليها باليد. 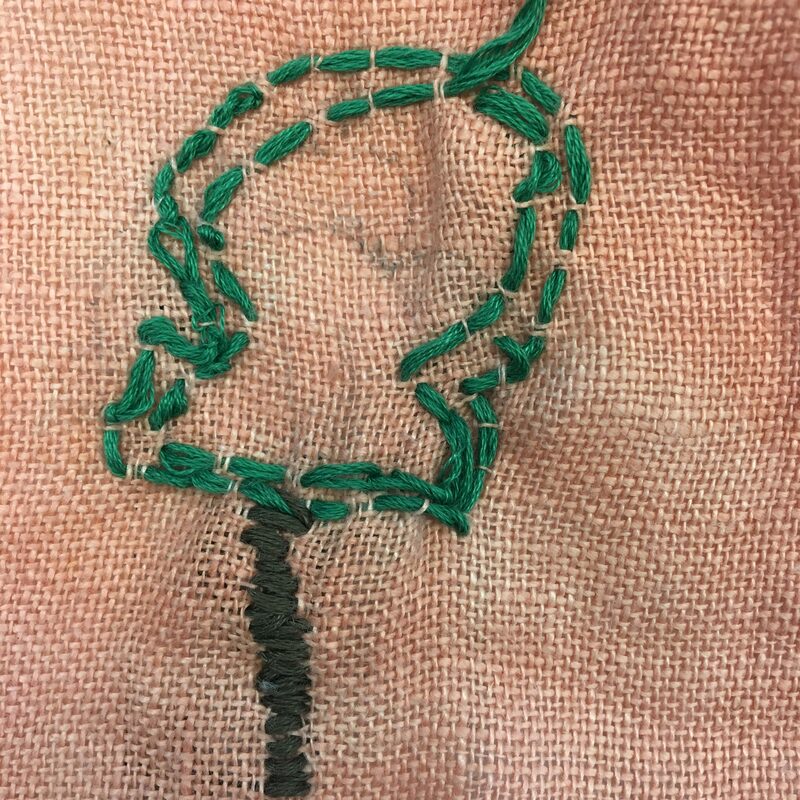 سيتم تسجيل كل مساهمة في لوحة الغابة وتوثيقها على خريطة. 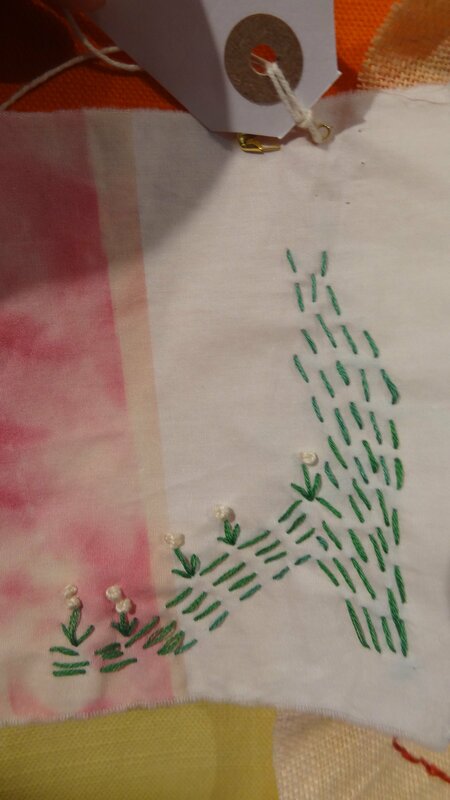 اسمحوا لنا بتقديم فائق الشكر لمشاركتكم في هذا المشروع ونتطلع إلى رؤية شجرتكم في الغابة في معرض ويتورث الفني في خريف عام 2018. 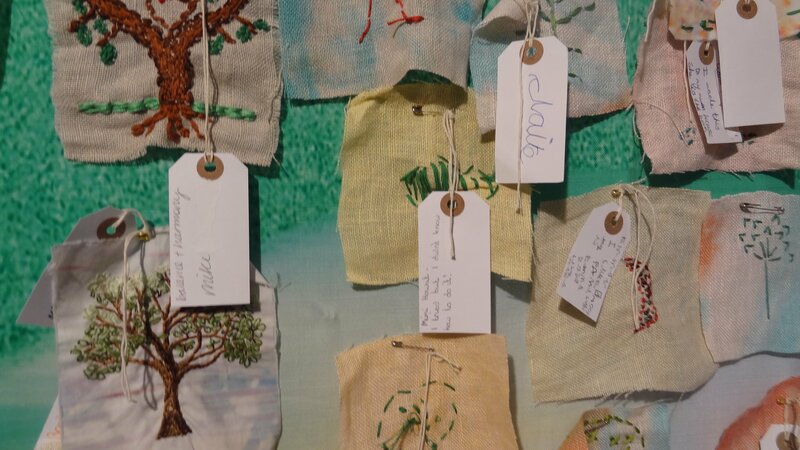 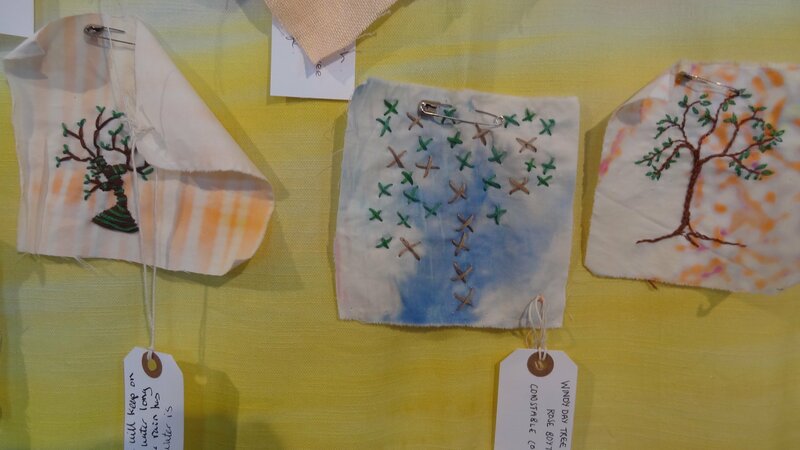 This project has generated so much interest that we invite a minimum voluntary donation of £3 to cover workload and costs in preparation for our summer exhibition. 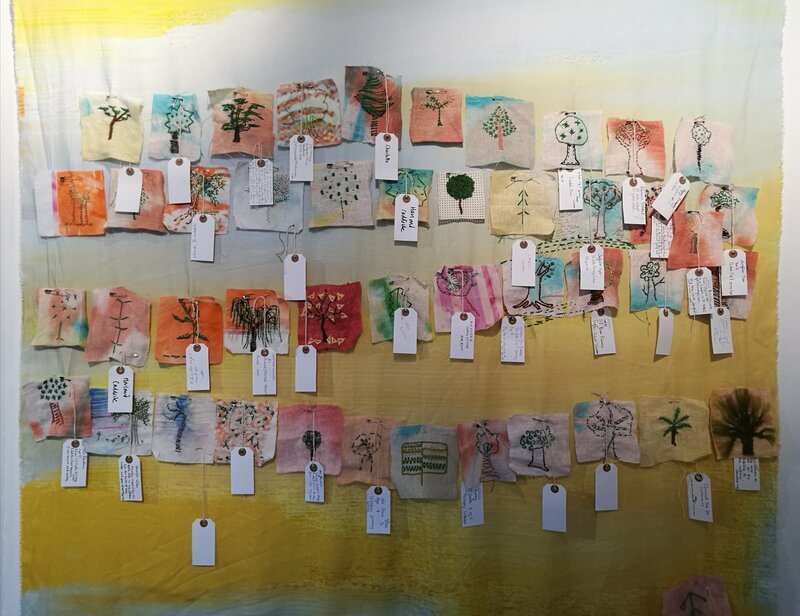 The completed Forest will be auctioned and (together with donations that exceed the costs) the money will be used to support refugee charities. 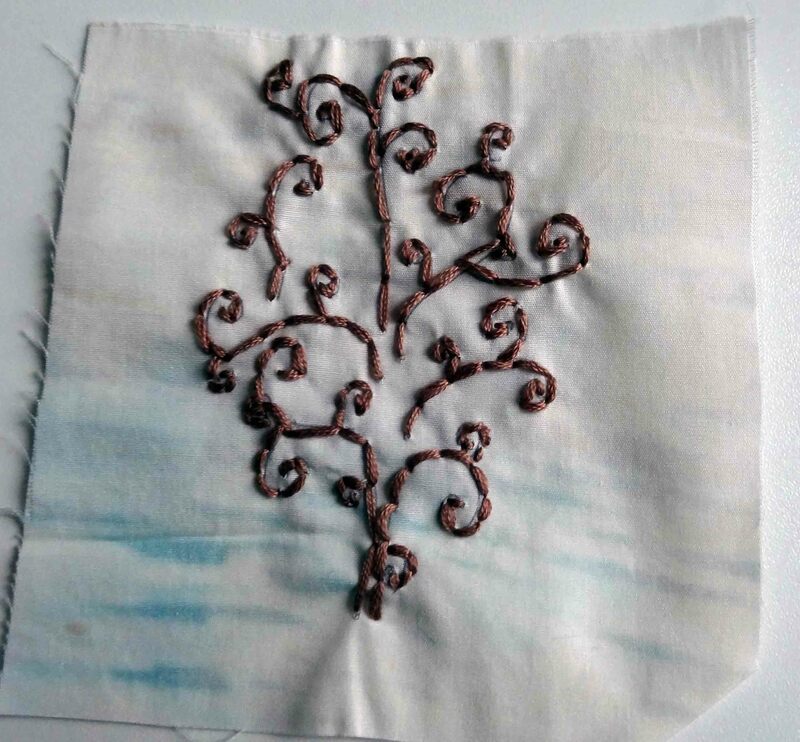 بإمكانكم تحميل : ملف الPDF أدناه.